본 발명은 특정 접속의 모든 수신된 DDP 세그먼트가 얼라인되는 경우에 메모리로의 직접 데이터 배치를 실행하거나, 특정 접속의 모든 DDP 세그먼트가 비얼라인되는 경우에 재조립 버퍼를 통해 데이터를 이동시키는 RNIC 구현을 포함한다. The invention RNIC to execute a data arrangement directly to the memory in the case where all received DDP segments of a particular connection are aligned, or moves data through reassembly buffers if all DDP segments of a particular connection are non-aligned including the implementation. 재조립 버퍼를 액세스하지 않고 컷-스루하는 접속의 유형은 얼라인될 가능성이 높기 때문에 "고속" 접속이라 칭해지는 반면, 그외 다른 유형은 "저속" 접속이라 칭해진다. Cut without accessing the reassembly buffers types of connection through which the other hand, referred to as "high-speed" connection because of the high possibility of the alignment, and other different types is referred to as the "low-speed" connection. 소비기는 접속을 설정할 때, 접속 유형을 지정한다(S2). When consumption groups establish a connection, it specifies a connection type (S2). 접속 유형은 고속에서 저속으로 그리고 그 반대로 변경할 수 있다. Connection type can be changed from high speed to low speed and vice versa. 본 발명은 메모리 대역폭, 지연, TCP 재전송을 이용한 에러 회복을 줄이고, 빈 수신 큐로부터 "우아한 회복"을 제공한다. The present invention reduces the error recovery using the memory bandwidth, delay, TCP retransmit and provides a "graceful recovery" from an empty receive queue. 이러한 구현은 또한 세그먼트 수신을 확인하는 TCP 긍정응답(Ack)을 보내기 전에 고속 접속의 대부분의 내향 DDP 세그먼트에 대해 CRC 검증(S11, S6)을 행할 수 있다. This implementation also can be carried out CRC verification (S11, S6) for most inward DDP segments in the Fast connection before sending a TCP acknowledgment (Ack) confirming segment reception. 본 발명은 일반적으로 데이터 전송에 관한 것으로, 더욱 구체적으로 얼라인된 DDP 세그먼트를 위한 컷-스루(cut-through) 구현을 갖는 RDMA(Remote Memory Data Access) 인에이블드 네트워크 인터페이스 제어기(RNIC)에 관한 것이다. The present invention relates generally to data transmission, more specifically, alignment of DDP-cut for the segment - on an enabled network interface controller (RNIC) (Remote Memory Data Access) RDMA having implemented through (cut-through) will be. 도 1a를 참조하면, 종래의 데이터 전송 환경(1)의 블럭도가 도시된다. Referring to Figure 1a, a block diagram of a conventional data transfer environment 1 is illustrated. 데이터 전송 환경(1)은 하나 이상의 원격 메모리 데이터 액세스(RDMA) 인에이블드 네트워크 인터페이스 제어기(들)(RNIC)(4)을 통해, 데이터 전송(3B)을 수신하는 데이터 싱크(sink)(5)(즉, 피어)에, 데이터 전송(3A)을 송신하는 데이터 소스(2)(즉, 피어)를 포함한다. Data transfer environment 1 includes a data sink (sink) that receives the data transmission (3B) through an enabled network interface controller (s) (RNIC) (4) one or more remote memory data access (RDMA) (5) (i. e., a peer), a data source 2 (i. e., a peer) that transmits a data transfer (3A). RNIC(4)는 그 중에서도 특히(아래에서 더욱 설명됨), 재조립(reassembly) 버퍼(6)를 포함한다. The RNIC (4) are among them include in particular (as further described below), reassembly (reassembly) buffer 6. 네트워킹 통신 속도는 초 당 10 메가비트(Mbps)에서 100 Mbps를 거쳐 초 당 1 기가비트(Gbps)로 최근에 상당히 증가되었으며, 이제는 10 Gbps 범위의 속도에 가까워지고 있다. Networking communication speeds via a 100 Mbps at 10 megabits per second (Mbps) were significantly increased in recent years as 1 Gigabit (Gbps) per second, it is now getting close to the speed of 10 Gbps range. 그러나, 통신 대역폭 증가는 이제, 중앙 처리 장치(CPU)가 데이터를 효율적으로 처리할 수 있는 속도를 앞지르기 시작하고 있어서, 서버 프로세서, 예를 들어 RNIC(4)에서 병목현상을 초래한 다. However, increasing the communication bandwidth is now, and is a central processing unit (CPU) to start overtake the speed that can process data efficiently, and in, the server processor, for example a bottleneck in the RNIC (4). 예를 들어, 일반적인 1 Gbps 네트워크 접속은 완전히 이용되는 경우에 2 GHz CPU의 큰 부담이 될 수 있다. For example, a common 1 Gbps network connection may be a great burden on the CPU 2 GHz when the full advantage. 특히, 이와 같은 CPU는 네트워크 카드에서 나오는 데이터로부터의 로우-레벨 전송 제어 프로토콜(TCP) 처리를 다루는 것만으로 자신의 처리 능력의 거의 절반을 확장할 수 있다. In particular, such a low CPU from the data coming from the network card - can be extended to nearly half of its processing power just to deal with the level of transmission control protocol (TCP) processing. 이러한 문제를 해결하는 한가지 방법은 전송 제어 및 인터넷 프로토콜(TCP/IP) 스택을, CPU에 의해 처리될 소프트웨어로서 구현하기 보다는 하드웨어 유한 상태 기계(FSM : Finite State Machine)로 구현하는 것이었다. One way to solve this problem is the Transmission Control and Internet Protocol (TCP / IP) stack, hardware finite state machine implemented as software rather than be handled by the CPU: that was implemented (FSM Finite State Machine). 이 방법은 연속적인(back-to-back) 짧은 패킷의 유선(wire) 속도 처리를 초래하는 매우 빠른 패킷 처리를 고려한다. This method is considered a very fast packet processing, which results in a fixed (wire) speed processing of consecutive (back-to-back) short packets. 또한, 이 방법은 저렴한 비용으로 매우 간결하고(compact) 강력한 해결책을 제시한다. In addition, this method is very simple and low cost given the (compact) powerful solution. 불행히도, TCP/IP 스택은 소프트웨어로의 구현을 위해 정의되고 개발되었기 때문에, 하드웨어로의 TCP/IP 스택의 생성은 광범위한 새로운 문제를 초래하게 된다. Unfortunately, TCP / IP stack is because the definition for the implementation of the software being developed, the creation of a TCP / IP stack in hardware, resulting in a wide range of new problems. 예를 들어, 발생된 문제는 하드웨어 FSM으로 소프트웨어 기반의 프로토콜을 구현하고 개선된 성능을 달성하는 방법에 관한 문제, 더 빠른 상위 계층 프로토콜(ULP) 구현을 제공하기 위해 ULP(예를 들어, 응용 프로토콜)에 대한 유익하고 효율적인 인터페이스를 설계하는 방법에 관한 문제, 및 스케일-업(scale-up) 구현에서의 새로운 병목현상을 방지하는 방법에 관한 문제를 포함한다. For example, the occurrence of problem ULP (for example, application protocol for the problem of how to accomplish the implementation of the software-based protocol in hardware FSM and improved performance, faster implement an upper layer protocol (ULP) and a problem of how to prevent a new bottleneck in the up (scale-up) implementation -) in useful and common problem of how to design an efficient interface, and a scale for. 이러한 새로운 문제들에 대처하기 위해, 새로운 통신 계층은 종래의 ULP와 TCP/IP 스택 사이에 놓이도록 개발되었다. In order to cope with these new problems, new communication layers have been developed to be placed between the conventional ULP and the TCP / IP stack. 불행히도, TCP/IP 스택 상에 배치된 프로토콜은, 지연(latency)을 추가하고 상당한 CPU 및 메모리 자원을 소모하는 간접 데이터 배치를 위해 ULP가 버퍼를 제공해야 하기 때문에, 전형적으로 다수의 복사 동작을 요구한다. Unfortunately, TCP / Because the protocol placed on the IP stack, the additional delay (latency), and must ULP provides a buffer for indirect data placement that consume significant CPU and memory resources, typically requiring multiple copy operations do. 복사 동작의 수를 줄이기 위해, iWARP라고 칭해지는 새로운 프로토콜의 슈트(suite)가 개발되었다. The suite (suite) of the new protocol, referred to as, iWARP to reduce the number of copying operations have been developed. 도 1b를 참조하여, iWARP를 포함하는 다양한 프로토콜 및 데이터 전송 포맷 구조의 간단한 개요가 이제 설명될 것이다. To Fig. 1b to, it will be a variety of protocols and data transfer format structure including a brief summary of the iWARP now be described. 알 수 있는 바와 같이, 각각의 데이터 전송은 데이터 전송에 관련된 상이한 기능을 각각 제공하는 다수의 상이한 프로토콜에 관련된 정보를 포함할 수 있다. As can be seen, each data transfer may include information related to a number of different protocols to provide different functions related to data transmission, respectively. 예를 들어, 도 1b에 도시된 바와 같이, 이더넷 프로토콜(100)은 IEEE 표준 802.3에 의해 정의된 바와 같은 LAN(Local Area Network) 액세스를 제공하고; For example, and as illustrated in Figure 1b, an Ethernet protocol 100 provides a LAN (Local Area Network) access as defined by IEEE standard 802.3; 인터넷 프로토콜(IP)(102)은 필요한 네트워크 라우팅 정보를 추가하며; Internet Protocol (IP) (102) is added and the necessary network routing information; 전송 제어 프로토콜(TCP)(104)은 외향(outbound) TCP 세그먼트(106)를 스케쥴링하여 전달 보증을 충족시키며; Transmission Control Protocol (TCP) (104) by scheduling the outgoing (outbound) TCP segment 106 meets the transfer assurance; 프로토콜 데이터 유닛 얼라인먼트를 갖는 마커[Marker with Protocol data unit(PDU) Alignment: MPA] 프로토콜(108)은 DDP 세그먼트(112)(하나만 도시되었지만 스트림일 수 있음)를 가로질러 고정된 간격으로(즉, 매 512 바이트마다) 후방 MPA 마커(들)(110)을 포함하는 MPA 프레임(109)을 제공하고, 또한 길이 필드(114) 및 순환 용장 검사(cyclic redundancy checking: CRC) 필드(116)를 각각의 MPA 프레임(109)에 추가한다. Having a protocol data unit alignment marker [Marker with Protocol data unit (PDU) Alignment: MPA] protocol 108 at fixed intervals across the (which may be, but stream only one shown) DDP segment 112 (i. E., Every every 512 bytes) provided the MPA frame 109 including a rear MPA marker (s) 110, and also the length field 114 and cyclic redundancy check (cyclic redundancy checking: CRC) each MPA fields 116 It is added to the frame 109. 또한, 직접 데이터 배치(DDP) 프로토콜(102)은 외향 메시지를 하나 이상의 DDP 세그먼트(112)로 분할하고, 하나 이상의 DDP 세그먼트(112)를 하나의 DDP 메시지(113)로 재조립하며; In addition, direct data placement (DDP) protocol 102 may divide the outwardly message to one or more DDP segments 112, and material of one or more DDP segments 112 as a DDP message 113 and assembly; 원격 데이터 메모리 액세스(RDMA) 프로토콜(122)은 DDP 메시지로/에서 RDMA 기입, 판독, 송신을 변환시킨다. A remote data memory access (RDMA) protocol 122 converts RDMA write, read, sent from / to the DDP messages. 명확하게 하기 위해 하나의 DDP 세그먼트(112)만이 도시되었지만, 다수의 DDP 세그먼트(112)가 각각의 TCP 세그먼트(106) 내에 제공될 수 있다는 것을 알기 바란다. It should be understood that although a single DDP segment 112 is only illustrated, the multiple DDP segments 112 can be provided in each TCP segment 106 in order to make it clear. RDMA 프로토콜(122)을 특별히 주시하면, RDMA 컨소시엄에 의해 개발된 이 프로토콜은 메모리 보호 의미론을 유지하면서, 메모리 버스 대역폭 및 중앙 처리 장치(CPU) 처리 부하에 관한 최소한의 요구로, 한 컴퓨터가 다른 컴퓨터의 메모리 내에 정보를 직접 배치할 수 있게 함으로써 데이터 복사 동작의 제거 및 지연의 감소를 가능하게 한다. If particularly notice the RDMA protocol 122, this protocol, developed by the RDMA Consortium, with minimal requirements for the memory bus bandwidth and central processing unit (CPU) processing load while maintaining the memory protection semantics, a computer is another computer, a by making it directly place the information in the memory enables a reduction in the removal and delay of a data copy operation. TCP/IP를 통한 RDMA는 프로세서 및 메모리 상의 오버헤드 부담을 감소시킴으로써 데이터 센터 내의 더욱 효율적이고 크기조정 가능한(scalable) 컴퓨팅 및 데이터 전송을 약속하는데, 이것은 프로세서 자원이 사용자 애플리케이션과 같은 다른 작업에 이용가능하게 하여, 기반구조 이용도를 개선시킨다. RDMA over TCP / IP is more efficient in the data center by reducing the overhead burden on processors and memory, and to promise a resizable (scalable) computing and data transmission, which can be used for other tasks, such as the processor resources and user applications to be, thereby improving the infrastructure utilization. 이 경우에, 네트워크가 더욱 효율적으로 됨에 따라, 애플리케이션은 더욱 크고 더욱 비싼 시스템에서의 집중화 작업과 대조적으로 네트워크 전반에서 태스크를 공유함으로써 더욱 잘 크기조정할 수 있다. In this case, as the network is more efficient, the application can be controlled better in size by sharing a centralized operation and contrast tasks across the network in a larger and more expensive systems. RDMA 기능으로, 송신기는 이더넷 바이트 스트림이 수신기에서 비순서적(out-of-order) 모드로 더욱 용이하게 디코딩되고 실행될 수 있도록 이더넷 바이트 스트림 상에 헤더를 두기 위해 프레이밍(framing)을 사용할 수 있어서, 특히 인터넷 소형 컴퓨터 시스템 인터페이스(iSCSI) 및 기타 저장장치 트래픽 유형의 경우에 성능을 향상시킬 것이다. RDMA functionality, a transmitter is able to use the framing (framing) to put headers on Ethernet byte streams so that Ethernet byte streams can be decoded more readily to non-forward books (out-of-order) mode in a receiver is carried out, in particular will improve the performance of the Internet small computer system interface (iSCSI) and other storage devices if the type of traffic. RDMA에 의해 제공된 다른 장점은 보다 적은 상호접속 유형을 통해 데이터 센터 내에 기능들을 모을 수 있는 능력이다. Another advantage provided by RDMA is the ability to gather data center capabilities in a smaller type of interconnection. 보다 적은 상호접속을 통해 기능들을 모음으로써, 결과적으로 얻어진 기반구 조는 덜 복잡하고, 관리하기가 더욱 용이하며, 구조적 용장성의 기회를 제공하여, 시스템 복원력을 개선시킨다. Than by gathering the functions through the small interconnected, as a result based on old Joe less complex and more manageable obtained, and to provide an opportunity for architectural redundancy, and improves system resiliency. DDP 프로토콜을 특별히 주시하면, 이 프로토콜은 데이터가 중간 버퍼없이 상위 계층 프로토콜(ULP)의 수신 버퍼 내로 직접 배치될 수 있는 메카니즘을 도입한다. If particularly notice the DDP protocol, this protocol introduces a mechanism by which data may be placed directly into the receive buffer of the upper layer protocol (ULP) without intermediate buffer. DDP는 내향(inbound) TCP 세그먼트를 처리할 때 RDMA 인에이블드 네트워크 인터페이스 제어기(RNIC)에 의해 실행된 (재조립 버퍼로/로부터의) 추가 복사를 감소시키고, 몇몇 경우에는 그것을 제거한다. DDP is the inward (inbound) to reduce the RDMA an enabled network interface controller (from the re-assembly buffer /) has been performed by the (RNIC) additional copies in the handling of TCP segments, and in some cases to remove it. 하드웨어 설정시에 RDMA 및 DDP를 갖는 TCP/IP의 효율적인 구현에 직면하는 한가지 도전과제는 표준 TCP/IP 오프-로드(off-load) 엔진(TOE) 구현이 복사 동작을 증가시키는 순서없이 수신된 TCP 스트림들을 배열하기 위해 수신 로직 내에 재조립 버퍼를 포함하는 것이다. One kinds challenge facing efficient implementation of TCP / IP with RDMA and DDP in a hardware setting is a standard TCP / IP off-load (off-load) engine (TOE) is implemented is received out of order, to increase the copy operation TCP intended to include reassembly buffers in receive logic to arrange the stream. 부가적으로, 수신기의 데이터 버퍼로의 직접 데이터 배치가 완료되게 하기 위해, RNIC는 각각의 도달하는 TCP 세그먼트 페이로드(127)에 대해 수신지 버퍼를 위치시킬 수 있어야 된다. Additionally, the data to be arranged is complete directly into the receiver's data buffer, is RNIC must be able to locate the destination buffer for TCP segment payload 127, which each reach of. 결과적으로, 모든 TCP 세그먼트들은 그들이 순서적이고 수신지 버퍼가 위치될 수 있다는 것을 확실하게 하기 위해 재조립 버퍼에 저장된다. As a result, all TCP segments are saved to the reassembly buffers to ensure that they are in order and the destination buffers can be located. 이 문제에 대처하기 위해, iWARP 스펙(specification)은 작성된 DDP 세그먼트가 TCP 세그먼트에 "얼라인(align)"될 수 있는 방식으로 RDMA 메시지의 세그먼트화를 실행하도록 전송 RNIC에 강력하게 권장한다. To address this problem, iWARP spec (specification) is strongly recommended to transfer the created DDP segment RNIC to perform segmentation of RDMA messages in such a way that it can be "alignment (align)" in the TCP segment. 그럼에도 불구하고, 비얼라인 DDP 세그먼트들은, 특히 데이터 전송이 많은 교환을 통해 행해지는 경우에, 종종 피할 수 없다. Nonetheless, non-aligned DDP segments, especially if the data transfer is done through a number of exchanges, often can not be avoided. 도 1b를 참조하면, "얼라인먼트"는 TCP 헤더(126)가 DDP 세그먼트(112)의 바로 앞에 오고(즉, MPA 헤더가 TCP 헤더 다음에 오고, 그 다음에 DDP 헤더가 옴), DDP 세그먼트(112)가 하나의 TCP 세그먼트(106)에 완전히 포함된다는 것을 의미한다. Referring to Figure 1b, "alignment" is a TCP header 126, coming just before the DDP segment 112 (ie, MPA header comes to the TCP header, then the DDP header ohms then), DDP segment (112 ) are means that fully contained in a TCP segment 106. the 더욱 구체적으로, 각 TCP 세그먼트(106)는 TCP 헤더(126) 및 TCP 페이로드/TCP 데이터(127)를 포함한다. More specifically, each TCP segment 106 includes a TCP header 126 and a TCP payload / TCP data (127). "TCP 홀(hole)"(130)은 TCP 데이터 스트림 내의 빠진 TCP 세그먼트(들)이다. "TCP hole (hole)" (130) is a missing TCP segment (s) in the TCP data stream. MPA 마커(110)는 무순서 TCP 세그먼트(106)가 수신될 때, 및 TCP 세그먼트(106) 내의 MPA 프레임(109)이 TCP 세그먼트(106)와 얼라인되는지, 얼라인되지 않는지 수신기가 알고 싶어할 때 데이터를 제공한다. MPA markers 110 when the random TCP segment 106 is received, and to MPA frame 109 that is aligned to TCP segment 106, want a receiver to know not being in alignment in a TCP segment 106 when it provides the data. 각 마커(110)는 특정 접속의 초기 순서 번호에서 시작하여, TCP 스트림 내에서 동일한 간격(512 바이트)으로 배치되고, 이동하는 MPA 프레임(109)의 DDP/RDMA 헤더(124)를 가리킨다. Each marker 110, starting from the initial sequence number of a specific connection, and arranged at equal intervals (512 bytes) in a TCP stream, points to a DDP / RDMA header 124 of the MPA frame 109 to move. 제1 순서 식별 번호는 제1 TCP 세그먼트(106)에 할당되고, 후속되는 TCP 세그먼트(106) 내의 각각의 초기 순서 번호는 증가된 순차 번호를 포함한다. A first sequence identification number is assigned to a first TCP segment 106, respectively, in the initial sequence number of the subsequent TCP segments 106 includes an increased sequence number. 도 1b에서, 실선은 TCP 헤더(126)가 MPA 길이 필드(114) 및 DDP/RDMA 헤더(124) 바로 앞에 오고, DDP 세그먼트(112)가 TCP 세그먼트(106) 내에 완전히 포함되는, 얼라인된 데이터 전송의 한 예를 나타낸 것이다. In Figure 1b, the solid line represents the TCP header 126, the MPA length field 114 and comes just in front of DDP / RDMA header 124, and the DDP segment 112 is aligned, to be completely contained within TCP segment 106, data It illustrates an example of a transmission. DDP 프로토콜(120) 계층에서의 점선은 TCP 헤더(126)가 MPA 길이 필드(114) 및 DDP/RDMA 헤더(124)의 바로 앞에 오지 않는, 비얼라인된 DDP 세그먼트(112NA)를 나타낸다. DDP protocol 120 layer is a dotted line in the TCP header 126 is shown which does not come directly in front of, the non-aligned DDP segment (112NA) of MPA length field 114 and DDP / RDMA header 124. 예를 들어, 비얼라인된 DDP 세그먼트는 송신 및 수신 RNIC들 사이에 있을 수 있는 중간-박스에 의한 재세그먼트화로 인해, 또는 작동중 최대 세그먼트 크기(MSS)의 감소로 인해 생길 수 있다. For example, the non-aligned DDP segment is medium, which may be between the transmitting and receiving RNIC - can occur because of a reduction in the maximum segment size (MSS) of the furnace because of the re-segment, or the activation of the box. 송신기 RNIC가 DDP 세그먼트화를 변경(TCP 스트림 내의 DDP 헤더의 위치 를 변경)할 수 없기 때문에, 재전송 동작은 더 큰 MSS를 갖는 원래의 DDP 세그먼트 작성에도 불구하고 새로운 감소된 MSS를 요구할 수 있다. Since there is no transmitter RNIC can change DDP segmentation (change location of DDP headers in TCP stream), the retransmission operation is despite the original DDP segments creation with a larger MSS, and may require a new reduced MSS. 어떤 경우든, 복사 동작의 증가는 속도와 효율을 감소시킨다. In any case, the increase in copying operations reduces speed and efficiency. 따라서, 비얼라인된 DDP 세그먼트 배치 및 전달과 다른 형태로, 얼라인된 DDP 세그먼트 배치 및 전달을 처리하는 방식이 본 기술 분야에 필요하다. Thus, in a non-aligned DDP segment placement and delivery and the other forms, methods to handle aligned DDP segment placement and the transfer is required in the art. 비얼라인된 DDP 세그먼트(112NA) 처리와 관계가 있는 새로운 도전과제는 비얼라인먼트를 야기하는 원인을 판정하기가 종종 어렵다는 사실에 의해 생겨난다. The non-aligned DDP segment (112NA) process and the new challenges in a relationship is created by the fact that often is difficult to determine the cause of the non-alignment. 예를 들어, 단일의 비얼라인된 DDP 세그먼트(112NA)는 2개 이상의 TCP 세그먼트(106)들 사이에서 분할될 수 있고, 그들 중 하나는 도달하고, 다른 하나는 도달하지 않을 수 있다. For example, the single non-aligned DDP segment (112NA) may be split between two or more TCP segments 106 and one of them is reached, and the other may not be reached. 그 외에, 몇몇 DDP 세그먼트(112NA)가 MPA 마커(110)들 사이에 속하거나, 헤더가 빠지거나, 또는 세그먼트 테일(tail)이 빠질 수 있는 경우 등이 있다(후자의 경우에는, 세그먼트를 부분적으로 배치하고, 나머지 부분 도달시에 그 나머지 부분을 배치하는 곳을 알기 위한 소정의 정보를 유지할 필요가 있을 수 있다). In addition, some DDP segments include cases (112NA) is in MPA marker 110 in between, or header is disconnected, or a segment tail (tail) can not fall (in the latter case, the segment part layout, it may be necessary to maintain the predetermined information to know where to place the remaining part during the remainder of travel). 후자의 경우와 관련하여, 도 1c는 하나 이상의 비얼라인된 DDP 세그먼트(112NA)에 대한 MPA 마커 참조에 관련된 가능한 상황의 블럭도를 도시한 것이다. With respect to the latter, Figure 1c shows a block diagram of possible situations related to MPA marker references for one or more non-aligned DDP segment, the (112NA). A의 경우는 새로 수신된 DDP 세그먼트(162)의 DDP 세그먼트 헤더(160)가 이전에 처리된 DDP 세그먼트(166)의 MPA 길이 필드(164)에 의해 참조되는 상황을 나타낸 것이다. In the case of A is a newly received DDP DDP segment header 160 of the segment 162, illustrating a situation in which the length of the MPA DDP segment 166 is referenced by the processing in the previous field (164). B의 경우는 새로 수신된 DDP 세그먼트(162) 헤더(160)가 새로 수신된 DDP 세그먼트(162) 내에 위치한 마커(168)에 의해 참조되는 상황을 나타낸 것이다. For B illustrates a situation in which newly received DDP segment 162 header 160 is referenced by a marker 168 located inside newly received DDP segment 162. 즉, 마커(168)는 새로 수신된 DDP 세그먼트(162)의 처음을 나타낸다. That is, the marker 168 shows the beginning of newly received DDP segment 162. C의 경우는 마 커(168)가 새로 수신된 DDP 세그먼트(162) 내에 위치되지만, 그 세그먼트의 외부를 가리키는 상황을 나타낸 것이다. For C, the marker 168 is located, but in newly received DDP segment 162, illustrating a situation that points to the outside of the segment. D의 경우는 마커(168)가 새로 수신된 DDP 세그먼트(162) 내에 위치되고, 그 세그먼트 내부를 가리키는 상황을 나타낸 것이다. If the D is positioned in the DDP segment 162, the marker 168, the newly received, illustrating a situation that points to the interior of the segment. E의 경우는 새로 수신된 DDP 세그먼트(162) 내에 어떤 마커도 위치하지 않는 상황을 나타낸 것이다. For E illustrates a situation does not have any marker located within a newly received DDP segment 162. 어떤 경우든, DDP 세그먼트 비얼라인먼트의 원인이 결정될 수 없는 경우에, RNIC는 적절하게 어드레싱하기에 너무 많은 경우들이 있고, 중간 저장장치에 보유하기에 너무 많은 정보/부분 세그먼트들이 있기 때문에 직접 데이터 배치를 행할 수 없다. In any case, DDP if segments cause can not be determined in the non-alignment, RNIC is data arranged directly because they properly so there are many cases, too much information to hold the intermediate storage / partial segments in addressing can not be performed. 따라서, 얼라인된 및 비얼라인된 DDP 세그먼트들의 상이한 처리조작을 제공하는 임의의 해결책은 비얼라인먼트를 야기할 수 있는 다양한 상황에 대처할 수 있어야 된다. Thus, any solution that provides different handling operations of the aligned and non-aligned DDP segment, the is should be able to cope with various situations that can result in non-alignment. 도 1d-1h를 참조하여, 나중의 설명을 위해 DDP/RDMA 동작 흐름의 간단한 개요가 지금 설명될 것이다. Referring to Fig. 1d-1h, for later description of a brief overview of DDP / RDMA operational flow will now be described. DDP 프로토콜(120)(도 1b)을 특별히 주시하면, DDP는 태그가 지정된 메시지 및 태그가 지정되지 않은 메시지라고 하는 2가지 유형의 메시지를 제공한다. If the DDP protocol 120 (FIG. 1b), give particularly, DDP provides two types of messages that messages tagged and untagged messages. 도 1d를 참조하면, "태그가 지정된 메시지"에서, 각각의 DDP 세그먼트(112)(도 1b)는 데이터가 직접 배치될 수 있는 수신기 상의 수신지 버퍼 내의 메모리 영역/윈도우[예를 들어, 도 1g의 메모리 영역(232)]를 식별하는 DDP/RDMA 헤더(124) 내의 조종 태그(steering tag: STag), 이 영역/윈도우 내의 타겟 오프셋(TO), 및 세그먼트 페이로드(payload)(도시되지 않음)를 갖고 있다. Referring to Figure 1d, the "message is tagged", each DDP segment 112 (Fig. 1b) is on the receiver to which data can be placed directly be stored in a memory region / window, for example, in a destination buffer, Fig. 1g (: STag steering tag), a target offset (tO), and a segment payload (payload) in this region / window (not shown) of the memory area one trillion kinds of tags in the DDP / RDMA header 124 that identifies the 232] to have. 이 경우에, 수신지 버퍼의 이용도는 Stag를 통해 "광고"된다. In this case, the number of utilization of the destination buffer are "ad" with Stag. 도 1e를 참조하면, "태그가 지정 되지 않은 메시지"는 원격 송신기가 수신기에서의 버퍼를 몰라서, 적절한 버퍼를 결정하기 위해 수신기에 의해 사용될 수 있는 큐 ID(QN), 메시지 순서 번호(MSN) 및 메시지 오프셋(MO)을 갖는 메시지를 송신하는 것이다. Referring to Figure 1e, "message untagged" is a remote transmitter not know buffers at a receiver, the queue ID (QN) that can be used by the receiver, the message sequence number (MSN) and to determine the appropriate buffer to send a message having a message offset (MO). 도 1f-1h를 참조하면, RDMA 프로토콜은 4가지 유형의 메시지: 송신(200), 기입(202), 판독(204) 및 판독 응답(206)을 정의한다. Referring to Figure 1f-1h, RDMA protocol, four types of messages: Defines the transmission 200, the writing unit 202, the read unit 204 and a read response (206). 도 1a로 돌아가면, 동사(verb) 인터페이스(7)는 RNIC(4)를 소비기(consumer)에 제공하고; Turning to Figure 1a, the verb (verb) interface 7 provides RNIC (4) to the consuming device (consumer) and; RNIC(4) 자원을 할당 및 해제하고, 작업 요청(WR)(208)을 RNIC(4)에 포스트(post)하는 방법을 포함한다. RNIC (4) allocation and de-allocation of resources, and includes a method of post (post) a work request (WR) (208) to the RNIC (4). 동사 인터페이스(7)는 보통, 2개의 부분; Verb interface 7 is typically two portions; 즉, 사용자 공간 소비기용으로 사용되는 사용자 공간 라이브러리(9A) 및 커널(kernel) 공간 소비기용으로 사용되는 커널 모듈(9B)을 갖는 동사 라이브러리(8)에 의해 구현된다. That is, it is implemented by a verb library 8 having the kernel module (9B) that is used in user space libraries (9A) and the kernel (kernel) space consuming appointed to be used in user space consuming machines. 동사 인터페이스(7)는 RNIC(4) 하드웨어 및 펌웨어와 함께 동작하는 RNIC 전용 소프트웨어이다. Verb interface 7 is RNIC-specific software that works with RNIC (4), hardware and firmware. 동사 인터페이스(7)[동사 라이브러리(8)], 하드웨어 및 펌웨어로 구현되어야 하는 것에 관한 엄격한 정의는 없다. There is no verb interface 7 [verb library 8], a strict definition of what should be implemented in hardware and firmware. 동사 인터페이스(7)는 RNIC(4) 서비스를 소비기에 제공하는 단일 패키지로서 간주될 수 있으므로, 소비기는 주로 2가지 유형의 동작; Verb interface 7 is RNIC (4) can be viewed as a single package that provides the service consumer groups, consumer groups are mainly two types of operations; 즉, RNIC(4) 자원의 관리(할당 및 해제), 및 RNIC(4)로의 작업 요청(들)의 포스팅을 실행할 수 있다. In other words, it is possible to execute the post of RNIC (4) management of resources (allocation and de-allocation), and the RNIC (4) work request (s) to. RNIC(4) 자원 관리의 예로는 큐 쌍 할당 및 해제, 완료 큐(이후, "CQ") 할당 및 해제, 또는 메모리 영역 할당 및 해제가 있다. RNIC (4) An example of the resource management is a queue pair allocation and de-allocation, a completion queue (hereinafter, "CQ") allocation and de-allocation or memory region allocation and de-allocation. 이러한 관리 태스크들은 아래에 더욱 상세하게 설명될 것이다. These management tasks will be described in more detail below. 도 1f-1h에 도시된 바와 같이, 소비기는 작업 요청(208)이 포스트되는 큐 쌍을 할당한다. As shown in Fig. 1f-1h, consumer group allocates a queue pair of the job request 208, the post. "큐 쌍"(이후, "QP")은 TCP 접속과 관련되고, 각 큐에 대한 포스팅 메카니즘(도시되지 않음)뿐만 아니라 한 쌍의 작업 큐(예를 들어, 송신 및 수신)(210, 212)를 포함한다. "Queue pair" (hereinafter, "QP") is TCP is associated with a connection, posting mechanism (not shown) as well as a pair of work queues (e. G., Transmit and receive) for each queue (210, 212) It includes. 각각의 작업 큐(210, 212)는 각각의 작업 큐 요소(WQE)가 하나의 작업 요청(WR)(208)을 기술하는 소정의 제어 정보를 보유하고 소비기 버퍼를 나타내는(또는 가리키는) WQE(216)의 리스트이다. Each work queue 210,212 is representing each work queue element group (WQE) holds and consume some control information describing one work request (WR) (208) buffer (or points) WQE ( a list of 216). 소비기는 동사 인터페이스(7)(도 1a) 및 RNIC(4)(도 1a)를 얻기 위해 작업 요청(WR)(208)을 작업 큐(210, 212)에 포스트하여, 포스트된 작업 요청(WR)(208)을 실행한다. Consumption group verb interface 7 (FIG. 1a) and RNIC (4) to the post (FIG. 1a), the work queues (210, 212) a work request (WR) (208) to obtain, a post work requests (WR) executes 208. 또한, 판독 큐(214)(도 1h) 및 작업 큐 요소(WQE)(216)와 같이 소비기가 직접 상호작용하지 못하는 QP를 구성할 수 있는 자원이 있다. Further, the resources that can be configured to consume QP group is not directly interact such as a read queue 214 (Fig. 1h) and a work queue element (WQE) (216). WQE(216)에 의해 보유될 수 있는 전형적인 정보로는 소비기 작업 요청(WR) 유형[즉, 송신 WR(208S)의 경우에는 RDMA 송신, RDMA 기입, RDMA 판독 등일 수 있고, 수신 WR(208R)의 경우에는 RDMA 수신만 될 수 있음], 및 전송하기 위해 데이터를 전달하거나, 또는 수신된 데이터에 대한 위치를 나타내는 소비기 버퍼의 설명이 있다. The typical information that can be held by a WQE (216) if the consuming device work request (WR) type, that is, transmission WR (208S) has and the like RDMA transmission, RDMA write, RDMA read, the received WR (208R) in case there is a description of consumer buffers group indicating a position for the transmission of data, or receiving data to only subject to], and receive RDMA transfer. WQE(216)는 항상 단일 RDMA 메시지를 기술하고/그 메시지에 대응한다. WQE (216) is always written to a single RDMA message and / respond to the message. 예를 들어, 소비기가 RDMA 기입 유형의 송신 작업 요청(WR)(208S)을 포스트할 때, 동사 라이브러리(8)(도 1a)는 RDMA 기입 메시지를 사용하여 데이터가 획득되어 응답기에 보내질 필요가 있는 소비기 버퍼를 기술하는 WQE(216S)를 작성한다. For example, a consumer group to post a send work request (WR) (208S) of the RDMA write type, verb library 8 (FIG. 1a) is the data is obtained using a RDMA write message that needs to be sent to the transponder create a WQE (216S) describing the consuming device buffer. 다른 예에서는, 수신 작업 요청(WR)(208R)(도 1f)이 존재한다. In other instances, there is a receive work request (WR) (208R) (Fig. 1f). 이 경우에, 동사 라이브러리(8)(도 1a)는 수신된 송신 메시지(200)의 페이로드를 배치하기 위해 사용될 소비기 버퍼를 보유하는 수신 큐(RQ)에 WQE(216R)를 추가한다. In this case, verb library 8 (FIG. 1a) adds a WQE (216R) in the received buffer that holds the consuming device used to place the payload of the received transmission message 200, queue (RQ). 동사 라이브러리(8)(도 1a)는 새로운 WQE(216)를 송신 큐(SQ)(210) 또는 수 신 큐(RQ)(212)에 추가할 때, 새로운 WQE(216)가 송신 큐(SQ)/수신 큐(RQ)에 각각 추가되었다는 것을 RNIC(4)(도 1a)에 통지한다(여기에서는 "초인종을 울린다"라고 한다). Verb library 8 (FIG. 1a) when adding a new WQE (216) in the send queue (SQ) (210) or the receive queue (RQ) (212), a new WQE (216) a send queue (SQ) notifies the / receive queue (RQ) RNIC (4) (Fig. 1a) that the addition of each of the (in this case referred to as "ringing the bell"). 이 "초인종 울림" 동작은 일반적으로, RNIC 하드웨어에 의해 검출되고 디코딩되는 RNIC 메모리 공간으로의 기입이다. The "bell sound" operation is usually a write to the RNIC memory space, which is detected and decoded by RNIC hardware. 따라서, 초인종 울림은 특정된 SQ/RQ에 대해 각각 행해야 할 필요가 있는 새로운 작업이 있다는 것을 RNIC에 통지한다. Thus, the doorbell is ringing and notifies the RNIC that there is a new work that needs to be subjected to each of the specific SQ / RQ. RNIC(4)(도 1a)는 계류중인(포스트된) WQE(216)를 갖는 송신 큐(SQ)의 리스트를 보유한다. RNIC (4) (Fig. 1a) holds a list of send queue (SQ) with the original (post) copending WQE (216). 또한, RNIC는 그러한 송신 큐(SQ)들(210) 사이를 중재하고, 잇따라서 그들을 서비스한다. In addition, RNIC arbitrates between those send queue (SQ) 210, and one after another standing service them. RNIC(4)는 서비스하기 위한 송신 큐(SQ)(210)를 골라내면, 서비스하기 위한 다음 WQE(216)를 판독하고(WQE들은 소비기에 의해 포스트된 순서로 RNIC에 의해 처리되고), 요청된 RDMA 메시지에 속하는 하나 이상의 DDP 세그먼트(220)를 생성한다. RNIC (4) is read out the next WQE (216) to pick out the inner surface, service a send queue (SQ) (210) for the service and (WQE can be processed by the RNIC in the order that the post by a consumer), the request It generates one or more DDP segments 220 belonging to the RDMA message. 특정 유형의 RDMA 메시지의 처리는 도 1f-1h를 참조하여 이제 설명될 것이다. Processing of RDMA messages of a certain type will now be described with reference to Fig. 1f-1h. 도 1f에 도시된 바와 같이, RNIC(요청기)는 특정 송신 큐(SQ)(210S)를 서비스하는 것을 선택한다. As shown in Figure 1f, RNIC (request group) selects to serve particular send queue (SQ) (210S). 그 RNIC는 송신 큐(SQ)(210S)로부터 WQE(216S)를 판독한다. The RNIC reads WQE (216S) from the send queue (SQ) (210S). 이 WQE(216S)가 RDMA 송신 요청에 대응하면, RNIC는 송신 메시지를 생성하고, 이 메시지를 피어 RNIC(응답기)에 송신한다. If the WQE (216S) corresponding to the RDMA send request, RNIC generates a Send message, transmits, and this message to the peer RNIC (transponder). 생성된 메시지는, 예를 들어 3개의 DDP 세그먼트(220)를 포함할 수 있다. The generated message may include, for example, three DDP segments 220. RNIC(응답기)는 송신 메시지를 수신할 때, 수신 큐(RQ)(212)로부터 WQE(216R)를 판독하고, 수신된 DDP 세그먼트(220)의 페이로드를, 그 WQE(216R)에 의해 참조된 소비기 버퍼(즉, 응답기 Rx buff)(230)에 배치한다. The RNIC (transponder) is referred to by the payload at the time of receiving the transmitted message, receive queue (RQ) read the WQE (216R) from the (212), receiving DDP segment 220, to the WQE (216R) It is placed in the buffer-consuming device (i.e., responder Rx buff) (230). 송신 메시지(200)가 순서대로 수신되면, RNIC는 수신 큐(RQ)(212)로부터 제1 미사용 WQE(216R)를 골라낸다. If the transmitted message 200 is received in order, RNIC singles the first unused WQE (216R) from the receive queue (RQ) (212). WQE(216R)는 소비기에 의해 포스트된 순서로 요청 큐(RQ)(212) 내에 연쇄적으로 연결된다. WQE (216R) is coupled to a chain in the request to the post-order queue (RQ) (212) by a consumer. 태그 비지정 DDP 메시지와 관련하여, 송신 메시지(200)는 동일한 DDP 큐에 속하는 각각의 송신된 DDP 메시지(220)를 갖는 송신기에 의해 1로 초기화되고 단조 증가되는 메시지 순서 번호(MSN)(도 1e)를 갖고 있다. Tag with regard to unspecified DDP message, sending the message 200, each of which is initialized to 1, by a transmitter having a transmission DDP message 220 is monotonically increasing message sequence number (MSN) that belong to the same DDP Queue (Fig. 1e) to have. (태그 지정된 메시지는 RDMA 기입 메시지와 관련하여 아래에 설명될 것이다.) DDP 큐는 DDP 헤더 내의 큐 번호(QN)(도 1e)에 의해 식별된다. (Tagged messages will be described below with regard to RDMA write message.) DDP Queue is identified by Queue Number (QN) (FIG. 1e) in the DDP header. RDMA 프로토콜은 3개의 DDP 큐: 즉, 내향 RDMA 송신용의 QN #0, 내향 RDMA 판독 요청용의 QN #1, 및 내향 종료용의 QN #2를 정의한다. RDMA protocol, three DDP Queues: that is, define the QN # 2 for the transmission of inbound RDMA QN # 0, inbound RDMA QN # 1, and the inward end of the read request. 따라서, 송신 메시지(200)가 비순서적으로 도달할 때, RNIC(4)는 그 송신 메시지(200)에 대응하는 WQE(216R)를 찾기 위해 그 메시지의 MSN을 사용할 수 있다. Thus,, when RNIC send message 200 reaches a non-forward books (4) may use the MSN of that message to find the WQE (216R) corresponding to the transmitted messages (200). 하나의 수신된 송신 메시지(200)는 수신 큐(RQ)(212)로부터 하나의 WQE(216R)를 소비한다. One received transmission message 200 consumes one WQE (216R) from the receive queue (RQ) (212). 포스트된 WQE의 부족, 또는 WQE 버퍼의 길이를 초과하는 메시지 데이터 길이는 심각한 에러로 간주되어, 접속 종료를 초래한다. Lack, or message data length exceeding the length of the WQE buffers of the post WQE is regarded as a serious error, resulting in disconnection. RDMA 기입 메시지(202)를 특별히 주시하면, 도 1g에 도시된 바와 같이, RDMA 기입 메시지(202)는 RNIC(4)에 의해 수신되고, RNIC는 등록된 메시지 영역(232)을 찾기 위해 (그 메시지에 속하는) DDP 세그먼트의 헤더 내의 STag와 TO(도 1d) 및 길이를 사용하며, RDMA 기입 메시지(202)의 페이로드를 메모리(232)에 배치한다. If particular regard to RDMA write message 202, a, RDMA write message 202 as shown in Figure 1g is received by RNIC (4), RNIC is (that message to find the message area 232 registered using the STag and tO (FIG. 1d), and length in the header of belonging) to the DDP segment, and places the payload of RDMA write message 202 to the memory 232. the 수신기 소프트웨어 또는 CPU(즉, 도시된 바와 같은 응답기)는 데이터 배치 동작에 관련되지 않고, 이 동작이 발생했다는 것을 알아차리지 못한다. The receiver software or CPU (i.e., an answering machine as illustrated) does not notice that the data does not relate to a batch operation, this behavior occurs. RDMA 판독 메시지(204)를 특별히 주시하면, 도 1h에 도시된 바와 같이, 메시지가 RNIC(4)(도 1a)에 의해 수신될 때, RNIC는 RDMA 판독 응답 메시지(206)를 생성하고, 그것을 다시 원격 호스트, 즉 도시된 바와 같은 요청기에 보낸다. If particular regard to RDMA read message 204, as shown in Figure 1h, when a message is received by RNIC (4) (Fig. 1a), RNIC generates a RDMA read response message 206, it again a remote host, that sends the request groups as shown. 이 경우에, 수신 큐는 판독 큐(214)라 칭해진다. In this case, the receive queue is referred to as a read queue 214. RDMA 판독 응답(206)의 생성은 또한, 이 동작이 발생했다는 것을 알아차리지 못하는 로컬 소비기(즉, 응답기)와 관련없이 실행된다. Generation of RDMA read response 206 also is performed without regard to local consumer group not realize that the operation of this occurrence (i.e., transponders). RDMA 판독 응답(206)이 수신될 때, RNIC(4)(도 1a)는 RDMA 기입 메시지(204)를 처리하는 것과 유사하게 이 메시지를 처리한다. When the RDMA read response is received (206), RNIC (4) (Fig. 1a) and processes this message similarly to handling an RDMA write message (204). 즉, RNIC는 요청기측 상의 메모리 영역(232)에 기입한다. That is, RNIC is written to the memory region 232 on the request gicheuk. 소비기 작업 요청 이외에, RNIC(4)(도 1a)는 또한 도 1f-1h에 도시된 바와 같이, 이들 요청의 완료에 대해 소비기에 통지한다. In addition to consuming device work requests, RNIC (4) as described (Fig. 1a) is also shown in Figure 1f-1h, and notifies groups consumption for the completion of those requests. 완료 통지는 [동사 라이브러리(8)에 의해 제공된 전용 기능을 통해] 소비기에 의해 할당되는 다른 RNIC 자원인 완료 큐(240)를 사용함으로써 행해진다. Completion notification is performed by using the completion queue 240, another RNIC resource allocated by [via a dedicated function provided by verb library 8] groups consumption. 완료 큐(240)는 완료 큐 요소(CQE)(242)를 포함한다. The completion queue 240 includes completion queue elements (CQE) (242). CQE(242)는 소비기 작업 요청(WR)(208S, 208W, 208RR)의 완료 보고시에 RNIC(4)(도 1a)에 의해 완료 큐(CQ)(240)에 배치된다. CQE (242) is disposed on a completion queue (CQ) (240) by the RNIC (4) (Fig. 1a) at the time of reporting the completion of the consuming device work request (WR) (208S, 208W, 208RR). 각각의 작업 큐[즉, 송신 큐(SQ)(210), 수신 큐(RQ)(212)]는 관련된 완료 큐(CQ)(240)를 갖는다. Each work queue that is, send queue (SQ) (210), receive queue (RQ) (212)] having an associated completion queue (CQ) (240). [주의: 판독 큐(214)는 하드웨어에 의해 유지된 내부 큐이고, 소프트웨어에 나타나지 않는다. [Note: read queue 214 is an internal queue maintained by hardware, and does not appear in the software. 그러므로, 어떤 CQ(240)도 이 큐와 관련되지 않고, 소비기는 이 큐를 할당하지도 않고 그것의 존재에 대해서도 모른다.] 그러나, 동일한 완료 큐(CQ)(240)는 하나보다 많은 송신 큐(SQ)(210) 및 수신 큐(RQ)(212)와 관련될 수 있다는 것을 알기 바란다. Therefore, any CQ (240) also is not relevant to this queue, neither consumption group assigned to this queue may also in its presence. However, the same completion queue (CQ) (240) is much transmit queue than one (SQ ) it should be understood that there may be associated with the 210 and the receive queue (RQ) (212). 관련은 큐 쌍(QP) 할당 시간에 실행된다. Related is carried out in a queue pair (QP) allocation time. 동작시, 소비기는 작업 요청(WR)(208)을 송신 큐(SQ)(210)에 포스트할 때, 이 요청 완료시에 통지를 받고 싶은지 지정할 수 있다. In operation, the consumer group to post work requests (WR) (208) send queue (SQ) (210) a, it is possible to specify whether you want to send notifications to the request is complete. 소비기가 완료 통지를 요청했으면, RNIC(4)는 작업 요청(WR) 완료시에 송신 큐(SQ)(210)와 관련된 관련 완료 큐(CQ)(240)에 완료 큐 요소(CQE)(242)를 배치한다. If you consume group requests a completion notification, RNIC (4) is a work request (WR) completion of a send queue (SQ) (210) complete the relevant associated with completing the queue (CQ) (240) queue element (CQE) (242) to It is arranged. RDMA 프로토콜은 송신 큐(SQ)(210)에 포스트된 작업 요청(WR)(208)에 대한 매우 단순한 완료 순서화를 정의한다. RDMA protocol defines very simple completion ordering for work requests on the (WR) (208) posts the send queue (SQ) (210). 특히, RDMA 송신 작업 요청(WR)(208S) 및 RDMA 기입 작업 요청(WR)(208W)은 신뢰성있게 송신되었을 때 완료된다. In particular, RDMA send work requests (WR) (208S) and RDMA write work requests (WR) (208W) is completed when the transmission reliably. RDMA 판독 작업 요청(WR)(208R)은 대응하는 RDMA 판독 응답 메시지(206)가 수신되었을 때 완료되고, 메모리 영역(232)에 배치된다. RDMA read work request (WR) (208R) is completed when the RDMA read response message 206 is received which corresponds, is arranged in the memory area 232. 소비기 작업 요청(WR)은 송신 큐(SQ)(210)에 포스트된 순서로 완료된다. Consuming device work requests (WR) are completed in the order that they are posted to send queue (SQ) (210). 도 1f를 참조하면, 수신 큐(RQ)(212)에 포스트된 각각의 작업 요청(WR)은 또한 완료 통지를 요구한다. Referring to Figure 1f, receive queue (RQ) (212) each work request (WR) posted to a further requires completion notification. 그러므로, RNIC(4)(도 1a)는 수신된 송신 메시지(200)의 배치를 완료할 때, 그 수신 큐(RQ)(212)와 관련된 완료 큐(CQ)(240)에 완료 큐 요소(CQE)(242)를 배치한다. Thus, RNIC (4) (Fig. 1a) is at the completion of the placement of the received transmission message 200, completes its receive queue completion queue associated with (RQ) (212) (CQ) (240) queue element (CQE ) and places (242). 상기 설명에 비추어보아, 비얼라인된 DDP 세그먼트 배치 및 전달과 다르게, 얼라인된 DDP 세그먼트 배치 및 전달을 처리하는 방식이 본 기술 분야에 필요하다. In light of the above description, the way they handle the non-aligned DDP segment placement and delivery differently than, the aligned DDP segment placement and delivery it is needed in the art. 본 발명은 특정 접속의 모든 수신된 DDP 세그먼트가 얼라인되는 경우에 메모리로의 직접 데이터 배치를 실행하거나, 특정 접속의 몇몇 DDP 세그먼트가 비얼라인되는 경우에 재조립 버퍼를 통해 데이터를 이동시키는 RNIC 구현을 포함한다. The invention RNIC to execute a data arrangement directly to the memory in the case where all received DDP segments of a particular connection are aligned, or moves data through reassembly buffers in the case where some DDP segments of a particular connection are non-aligned including the implementation. 재조립 버퍼를 액세스하지 않고 컷-스루하는 접속의 유형은 "고속" 접속이라 칭해지는 반면, 그외 다른 유형은 "저속" 접속이라 칭해진다. Without accessing the reassembly buffers cut-other hand, it referred to as the type of connection that is through "high-speed" connection, and other different types is referred to as the "low-speed" connection. 소비기는 접속을 확립할 때, 접속 유형을 지정한다. Consumer groups, and specifies the type of connection when establishing the connection. 예를 들어, 인터넷을 통해 다른 대륙으로 가려고 하는 접속은 얼라인된 세그먼트를 갖는 수신지에 도달할 확률이 낮으므로, "저속" 접속 유형으로서 소비기에 의해 지정된다. For example, through the Internet connection to go to a different continent, since the probability of reaching the destination with the aligned segments during the day, and is specified by a consumer as "low-speed" connection type. 한편, 저장 영역 네트워크(SAN) 내에서 2개의 서버를 접속하는 접속은 모든 DDP 세그먼트가 얼라인될 확률이 매우 높으므로, "고속" 접속 유형으로서 소비기에 의해 접속될 수 있다. On the other hand, the connection connecting the two servers in a storage area network (SAN) may be connected by a consumer because all DDP segments is very high probability of alignment, as a "high-speed" connection type. 접속 유형은 고속에서 저속으로 그리고 그 반대로 바뀔 수 있다. Connection type can be changed from high speed to low speed and vice versa. 본 발명은 메모리 대역폭, 지연, TCP 재전송을 이용한 에러 회복을 줄이고, 빈 수신 큐로부터, 즉 수신 큐가 내향 태그 비지정 DDP 세그먼트를 위한 포스트된 작업 큐 요소(WQE)를 갖지 않는 경우에, "우아한 회복"(graceful recovery)을 제공한다. The present invention when reducing the error recovery using the memory bandwidth, delay, TCP retransmission, from an empty receive queue, i. E. Having no post a work queue element (WQE) for tag unspecified DDP segment is received, the queue inward, "graceful recovery It provides "(graceful recovery). 종래의 구현은 접속 종료로 끝날 수 있다. The conventional implementation can be done by disconnection. 이에 반해, 본 발명에 따른 고속 접속은 그러한 세그먼트를 드롭(drop)시키고, TCP 재전송 프로세스를 사용하여 이러한 상황에서 회복해서 접속 종료를 방지한다. On the other hand, high-speed access in accordance with the present invention the drop (drop) of such a segment and using a TCP retransmit process to recover from this situation and avoid connection termination. 이러한 구현은 또한 세그먼트 수신을 확인하는 TCP 긍정응답(Ack)을 보내기 전에 고속 접속의 대부분의 내향 DDP 세그먼트에 대해 순환 용장 검사(CRC) 검증을 행할 수 있다. This implementation also can be performed to verify cycle redundancy check (CRC) for the most inward DDP segments in the Fast connection before sending TCP acknowledgment (Ack) confirming segment reception. 이것은 CRC 검사에 의해 검출된 데이터 손상으로부터 TCP 신뢰 서비스를 사용하여 효율적인 회복을 할 수 있게 한다. This allows efficient recovery using TCP reliable services from data corruption detected by a CRC check. 본 발명의 제1 실시양상은 전송 제어 프로토콜(TCP) 재전송 처리 속도를 증가시키는 방법에 관한 것으로, 이 방법은 TCP에 의해 유효로 판정되고, 상위 계층 프로토콜(ULP) 판정에 기초하여 TCP에 의해 드롭된 수신 TCP 세그먼트를 커버하는 제1 복제 TCP 긍정응답(Ack)을 생성하는 단계; It relates to a method of increasing the first embodiment of the present invention is the Transmission Control Protocol (TCP) retransmission processing speed, the method is determined as valid by TCP, on the basis of the determined upper layer protocol (ULP) dropped by the TCP a receiving step of generating a first duplicate TCP acknowledgment (Ack) covering a TCP segment; 및 제1 복제 TCP Ack를 전송하는 단계를 포함한다. And transmitting the first duplicate TCP Ack. 본 발명의 제2 실시양상은 전송 제어 프로토콜(TCP) 재전송 처리 속도를 증가시키는 시스템에 관한 것으로, 이 시스템은 TCP에 의해 유효로 판정되고, 상위 계층 프로토콜(ULP) 판정에 기초하여 TCP에 의해 드롭된 수신 TCP 세그먼트를 커버하는 제1 복제 TCP Ack를 생성하는 TCP Ack 생성기를 포함한다. Relates to a system for increasing the second embodiment of the present invention is the Transmission Control Protocol (TCP) retransmission processing rate, the system is judged to be valid by TCP, on the basis of the determined upper layer protocol (ULP) dropped by the TCP the received and a TCP Ack generator for generating a first duplicate TCP Ack covering a TCP segment. 본 발명의 제3 실시양상은 전송 제어 프로토콜(TCP) 재전송 처리 속도를 증가시키기 위한 컴퓨터 판독가능 프로그램 코드가 구현되어 있는 컴퓨터 사용가능 매체를 포함하는 컴퓨터 프로그램 제품에 관한 것으로, 이 프로그램 제품은, TCP에 의해 유효로 판정되고 상위 계층 프로토콜(ULP) 판정에 기초하여 TCP에 의해 드롭된 수신 TCP 세그먼트를 커버하는 제1 복제 TCP Ack를 생성하도록 구성된 프로그램 코드를 포함한다. The third aspect of the present invention relates to a computer program product comprising a transmission control protocol (TCP) computer readable program, computer usable medium having code is implemented to increase the retransmission processing speed, the program product, TCP It determined as valid by the determination being based on the upper layer protocol (ULP) and comprises program code configured to generate a first duplicate TCP Ack covering a received TCP segment dropped by the TCP. 본 발명의 상기 및 그외 다른 특징은 본 발명의 실시예에 관한 다음의 더욱 구체적인 설명으로부터 명백해질 것이다. These and other various embodiments of the invention will become apparent from the following more particular description of the embodiments of the present invention. 본 발명의 실시예는 동일한 표시가 동일한 구성요소를 나타내는 다음의 도면을 참조하여 상세하게 설명될 것이다. Embodiments of the invention will be described in detail with reference to the following drawings, the same display showing the same components. 도 1a는 종래의 데이터 전송 환경 및 RNIC를 도시한 블럭도. Figure 1a is a block diagram showing a conventional data transfer environment and RNIC. 도 1b는 TCP/IP 데이터 전송 구조를 통한 종래의 MPA/RDMA/DDP를 도시한 블럭도. Figure 1b is a block diagram showing a conventional MPA / RDMA / DDP over TCP / IP data transfer structure. 도 1c는 하나 이상의 DDP 세그먼트에 대한 가능한 MPA 마커 참조를 도시한 블럭도. Figure 1c is a block diagram showing a possible MPA marker references for one or more DDP segments. 도 1d는 종래의 태그 지정된 DDP 헤더를 도시한 블럭도. Figure 1d is a block diagram showing a conventional DDP header specified in the tag. 도 1e는 종래의 태그 비지정 DDP 헤더를 도시한 블럭도. Figure 1e is a block diagram showing a conventional tag unspecified DDP header. 도 1f-1h는 다양한 종래의 RDMA 메시지 데이터 전송을 도시한 블럭도. Figure 1f-1h is a block diagram showing the various conventional RDMA message data transfers. 도 2a는 본 발명에 따른 데이터 전송 환경 및 RNIC를 도시한 블럭도. Figure 2a is a block diagram showing a data transfer environment and RNIC according to the invention. 도 2b는 도 2a의 RNIC의 접속 문맥을 도시한 블럭도. Figure 2b is a block diagram showing a connection context of the RNIC of FIG. 2a. 도 2c는 도 2a의 RNIC의 검증 유닛을 도시한 블럭도. Figure 2c is a block diagram showing the verification unit of the RNIC of FIG. 2a. 도 3은 RNIC 입력 로직(즉, InLogic) 기능의 흐름도. 3 is RNIC input logic (i. E., InLogic) functions of the flow chart. 도 4a-4b는 도 3의 InLogic에 대한 제한된 재전송 시도 모드 실시예의 흐름도. Figure 4a-4b is a flow diagram of exemplary limited retransmission attempt mode for the InLogic of FIG. 도 5는 대안적인 실시예에 따른 접속 다운그레이드(downgrade) 후의 TCP 세그먼트의 처리조작을 도시한 블럭도. Figure 5 is a block diagram showing a processing operation of the connection downgrade (downgrade) after TCP segments according to an alternative embodiment. 도 6은 도 3의 InLogic에 대한 접속 업그레이드 실시예의 흐름도. Figure 6 is a flow diagram of exemplary upgrade access to InLogic of FIG. 도 7은 순환 용장 검사(CRC) 계산 및 검증을 위한 초기 순서 번호 절충 구현과 함께 사용하기 위한 MPA 요청/응답 프레임을 도시한 도면. 7 is a diagram illustrating a cycle redundancy check (CRC) calculation and MPA request / reply frame for use with an initial sequence number compromise implementation for validation. 도 8은 CRC 계산 및 검증을 위한 대안적인 변경된 MPA 길이 구현의 흐름도. 8 is a flow diagram of an alternative modified MPA length implementation for CRC calculation and validation. 도 9는 CRC 계산 및 검증을 위한 무-마커 컷-스루(no-marker cut-through) 구현을 사용한 InLogic의 제1의 대안적인 실시예의 흐름도. 9 is free for CRC calculation and validation-marker cut-through (no-marker cut-through) a first alternate embodiment of a flow diagram of InLogic using the implement. 도 10은 CRC 계산 및 검증을 위한 무-마커 컷-스루 구현을 사용한 InLogic의 제2의 대안적인 실시예의 흐름도. 10 is free for CRC calculation and validation-flow diagram of an alternative embodiment of the second implementation of InLogic using the through-marker cut. 도 11은 본 발명에 따른, 판독 큐를 포함하는 RDMA 판독 및 판독 응답 메시지 데이터 전송을 도시한 블럭도. 11 is a diagram showing the RDMA read and a read response message including the data transfer, the read queue in accordance with the present invention. 도 12는 RNIC 출력 로직(즉, OutLogic)에 의해 처리된 메시지를 위한 작업 큐 요소(WQE) 및 TCP 홀을 도시한 블럭도. Figure 12 is a block diagram showing a work queue element (WQE) and TCP holes for messages processed by RNIC output logic (i. E., OutLogic). 도 13은 본 발명에 따른, 완료 큐 요소(CQE)를 포함하는 RDMA 송신 메시지 데이터 전송을 도시한 블럭도. 13 is a diagram showing the transmission RDMA message data transfers including a completion queue element (CQE) according to the present invention. 도 14는 도 13의 CQE를 도시한 블럭도. Figure 14 is a block diagram showing the CQE of FIG. 다음은 단지 구성상의 이유로, I. 개요, Ⅱ. Here are just reasons, configuration, I. Introduction, Ⅱ. InLogic, Ⅲ. InLogic, Ⅲ. OutLogic, 및 Ⅳ. OutLogic, and Ⅳ. 결론의 형태로 설명된다. It is described in the form of a conclusion. 첨부 도면을 참조하면, 도 2a는 본 발명의 한 실시예에 따른 데이터 전송 환경(10)의 블럭도이다. Referring to the drawings, Figure 2a is a block diagram of data transfer environment 10 according to one embodiment of the present invention. 데이터 전송 환경(10)은 하나 이상의 원격 메모리 데이터 액세스(RDMA) 인에이블드 네트워크 인터페이스 제어기(들)(RNIC)(16)을 통해, 데이터 전송(14B)을 수신하는 데이터 싱크(sink)(18)(즉, 피어)에, 데이터 전송(14A)을 송신하는 데이터 소스(12)(즉, 피어)를 포함한다. Data transfer environment 10 includes a data sink (sink) that receives a data transmission (14B) via an enabled network interface controller (s) (RNIC) (16) one or more remote memory data access (RDMA) (18) (i. e., a peer), a data source 12 (i. e., a peer) that transmits a data transfer (14A). 설명을 위해, 데이터 전송을 시작하는 엔티티는 여기에서 "요청기"로 칭해지고, 데이터 전송에 응답하는 엔티티는 여기에서 "응답기"로 칭해질 것이다. For purposes of illustration, the entity that starts the transfer of data it is herein referred to as getting "requester", an entity that responds to the data transfer will be referred to herein as a "transponder". 이와 유사하게, 데이터를 송신하는 엔티티는 여기에서 "송신기"로 칭해지고, 데이터 전송을 수신하는 엔티티는 여기에서 "수신기"로 칭해질 것이다. Similarly, an entity that transmits data is becoming referred to herein as a "transmitter", the entity that receives a data transfer will be referred to herein as a "receiver." 데이터 소스(12) 및 싱크(18)의 각각은 서로 다른 시간에, 데이터의 송신기 또는 수신기, 또는 요청기 또는 응답기일 수 있고, "소스" 및 "싱크"라는 표시는 전송될 데이터를 보유하는 그 엔티티를 처음에 나타내기 위해서만 제공된다. Each data source 12 and sink 18 to each other at different times, may be the transmitter or the receiver, or request group or a response date of the data, the display of "source" and "sink" is that which holds the data to be transmitted It is provided only to indicate the entity in the first place. 다음 설명은 또한, 더욱 구체적인 표시가 필요없는 경우에 상기 엔티티들 중의 하나를 [RNIC(16) 자원의 소비를 위한] "소비기(consumer)"로 칭할 수 있다. The following description also may be referred to as a further one of said entities in the absence of specific display needs [RNIC (16) for the consumption of resources; "consuming device (consumer)". "수신지 버퍼"는 수신기에서 데이터를 마지막으로 수신하는 데이터 저장장치, 즉 데이터 소스(12) 또는 데이터 싱크(18)의 데이터 버퍼(50)를 나타낼 수 있다. "Destination buffer" may indicate the data buffer 50 of data storage device that last receives the data at the receiver, i.e., the data source 12 or data sink 18. 데이터 소스(12) 및 데이터 싱크(18)는 각각 데이터 저장을 위한 데이터 버퍼(50)를 포함한다. Data source 12 and data sink 18 includes a data buffer 50 for each data store. 하드웨어와 관련하여, RNIC(16)는 iWARP 및 동사 기능을 갖는 네트워크 I/O 어댑터 또는 내장된 제어기와 같은 임의의 네트워크 인터페이스 제어기이다. With regard to hardware, RNIC (16) is any network interface controller such as the network I / O adapter or embedded controller with iWARP and verbs functionality. 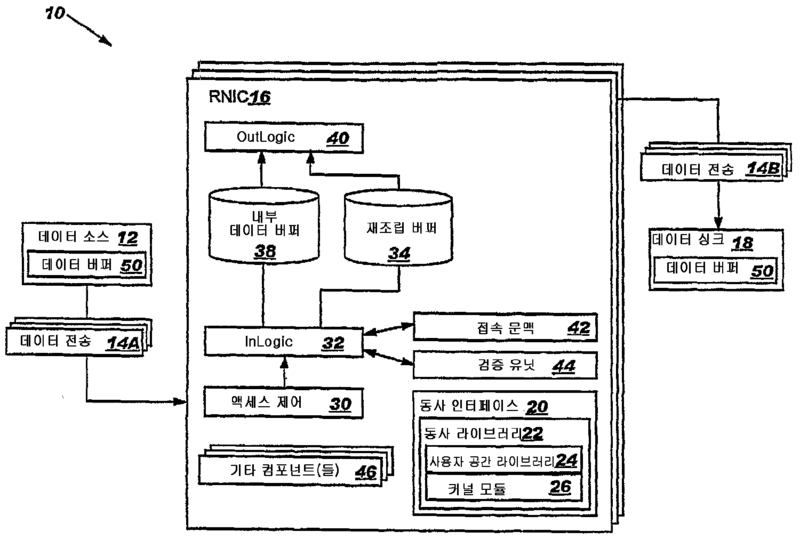 RNIC(16)는 또한 동사 인터페이스(20), 액세스 제어(30), RNIC 입력 로직(이후, "InLogic")(32), 재조립 버퍼(34), 내부 데이터 버퍼(38), RNIC 출력 로직(이후, "OutLogic")(40), 접속 문맥(42), 검증 유닛(44) 및 기타 컴포넌트(46)를 포함한다. RNIC (16) is also verb interface 20, an access control (30), RNIC input logic (hereinafter, "InLogic") (32), reassembly buffers 34, an internal data buffer (38), RNIC output logic ( later, a "OutLogic") (40), connection context 42, a validation unit 44 and other components (46). 동사 인터페이스(20)는 동작을 실행하기 위해 RNIC(16) 하드웨어와 RNIC 드라이버(도시되지 않음)의 결합을 통해 구현된 바와 같은 소비기에 대한 RNIC(16)의 표현이다. Verb interface 20 is a representation of RNIC (16) and the hardware driver RNIC RNIC (16) for consumer groups such as those implemented by a combination of (not shown) to execute an operation. 동사 인터페이스(20)는 2개의 부분, 즉 사용자 공간 라이브러리(24) 및 커널 모듈(26)을 갖는 동사 라이브러리(22)를 포함한다. The verb interface 20 comprises two parts: a verb library 22 having a user space library 24 and a kernel module (26). 액세스 제어(30)는 InLogic(32)으로의 액세스를 제어하기 위한 임의의 지금 알려져 있거나 나중에 개발되는 로직을 포함할 수 있다. Access control 30 may include any now known or later developed logic for controlling access to InLogic (32). 재조립 버퍼(34)는 데이터 전송(14A, 14B)에 관련된 데이터의 임시 저장을 위한 임의의 메카니즘을 포함할 수 있다. Reassembly buffers 34 may include any mechanism for temporary storage of data related to data transfer (14A, 14B). 특히, 재조립 버퍼(34)는 더욱 상세하게 후술되는 바와 같이, 비순서적인 TCP 스트림의 임시 저장을 위해 보통 사용된다. In particular, reassembly buffers 34, and is normally used for temporary storage of non-sequential TCP stream as will be described later in more detail. 기타 컴포넌트(46)는 RNIC(16)의 동작에 필요하지만 여기에서는 달리 설명되지 않는 임의의 기타 로직, 하드웨어, 소프트웨어 등을 포함할 수 있다. Other component 46 is required for operation of RNIC (16), however it may include any other logic, hardware, and software that are not otherwise described. 도 2b를 참조하면, 접속 문맥(42)은 접속 전용 데이터를 저장하는 다수의 필 드를 포함한다. Referring to Figure 2b, connection context 42 includes a number of fields for storing connection-specific data. 기타 문맥 데이터(60)는 여기에서 달리 설명되지 않지만 본 기술 분야에 숙련된 기술자가 알 수 있는 접속 전용 데이터를 제공한다. Other context data 60 provides access only the data that can be skilled in the art, but not otherwise stated in this notice. 본 발명에 따르면, 2개의 접속 유형, 즉 고속(이후, "FAST") 접속 및 저속(이후, "SLOW") 접속이 정의된다. According to the invention, two connection types, that is, a high speed (hereinafter, "FAST") and a low-speed connection (hereinafter, "SLOW") connection is defined. "고속" 및 "저속"이라는 용어는 접속의, 얼라인된 DDP 세그먼트를 전달할 가능성을 나타낸다. The term "high speed" and "low speed" indicates the possibility to pass, aligned DDP segments of a connection. 접속 유형은 접속 유형(62)이라고 하는 접속 문맥 필드에서 식별된다. Connection type is identified in a connection context field called a connection type (62). SLOW 접속은 더욱 상세하게 후술하는 바와 같이, SLOW 접속으로서 만들어졌거나, 또는 내향 데이터의 처리 도중에 RNIC(16)에 의해 다운그레이드된 RDMA 접속을 위해 사용될 수 있다. SLOW connection may be used for RDMA connections downgraded by, RNIC (16) during been created as SLOW connections, or the processing of inbound data, as described in more detail below. 도 2b에 도시된 그외 다른 필드는 이 명세서의 다른 부분에서 관련 처리와 관련하여 설명될 것이다. The other different fields shown in Figure 2b will be described in conjunction with associated processing elsewhere in this disclosure. 도 2c를 참조하면, 검증 유닛(44)은 검증 처리에 필요할 수 있는, 순환 용장 검사(CRC) 로직(64), TCP 체크섬(checksum) 로직(66) 및 저장-전송 버퍼(68)를 포함한다. And a transmit buffer (68) Referring to Figure 2c, verifying unit 44, a cyclic redundancy check (CRC) logic (64), TCP checksum (checksum) logic 66 and stored that may be necessary for validation processing . 도 2a로 돌아가면, 동작시, RNIC(16)는 InLogic(32)으로의 액세스를 제어하는 액세스 제어를 통해 데이터 전송(14A)을 수신한다. Turning to Figure 2a, in operation, RNIC (16) receives a data transmission (14A) via an access control for controlling access to InLogic (32). 접속을 유지하는 정보는 종래에서처럼, 접속 문맥(42)의 기타 문맥 데이터(60)(도 2b) 내에 보유된다. Information to keep the connection is as shown in the prior art, it is retained in other context data 60 (FIG. 2b) in connection context 42. InLogic(32)은 데이터 전송(14A) 내의 내향 TCP 세그먼트를 처리하고, TCP 체크섬 로직(66)(도 2c)을 통해, 수신된 TCP 세그먼트의 검증을 실행하며, CRC 로직(64)(도 2c)을 통해 MPA CRC를 계산하고, FAST 접속 데이터 스트림을 SLOW 접속 데이터 스트림으로부터 분리시킨다. InLogic (32) processes the inbound TCP segments in data transfer (14A), and through the TCP checksum logic 66 (FIG. 2c), and execute a verification of the received TCP segment, (Fig. 2c), CRC logic 64 to thereby calculate the MPA CRC, and separates the FAST connection data streams from SLOW connection data streams. 후자의 기능과 관련하여, InLogic(32)은 더욱 상세하게 후술되는 바와 같이, SLOW 접속 상에서 RNIC(16)에 의해 수신된 모든 데이 터를 재조립 버퍼(34)로 향하게 하여, 여러가지 상이한 방식으로 FAST 접속을 처리조작한다. In relation to the latter function, InLogic (32) is as described in more detail below, by directing all data received by RNIC (16) on a SLOW connection to reassembly buffers 34, and in a number of different ways FAST the processing operation for access. FAST 접속과 관련하여, InLogic(32)이 얼라인먼트 위반을 검출하면(즉, TCP 헤더가 DDP 헤더의 바로 앞에 오지 않고, DDP 세그먼트가 하나의 TCP 세그먼트 내에 완전히 포함되지 않으면), 접속은 SLOW 접속으로 다운그레이드되고, 데이터는 재조립 버퍼(34)로 향하게 된다. In relation to the FAST connections, if InLogic (32) detects an alignment violation (i. E., TCP header has not come immediately before the DDP header, if the DDP segment is not fully contained in the one TCP segment), the connection is a SLOW connection down and grade, the data is directed to reassembly buffers 34. 이에 반해, 얼라인먼트 위반이 존재하지 않으면, InLogic(32)은 수신지 데이터 버퍼(50)로의 직접 배치를 위해, 얼라인된 내향 DDP 스트림을 내부 데이터 버퍼(38)로 향하게 한 다음에 OutLogic(40)으로 향하게 한다. On the other hand, if the alignment violation exists, InLogic (32) is a destination OutLogic (40) directly, alignment of the inward DDP stream to an arrangement to the data buffer 50 to the facing into the data buffer 38, and then to be directed. 대안적으로, TCP 세그먼트(106)는 드롭될 수 있고, 아무런 긍정응답(Ack)도 보내지지 않으므로, 세그먼트의 재전송을 필요로 한다. Alternatively, and TCP segment 106 may be dropped, since not sent any positive response (Ack), it requires a retransmission of the segment. OutLogic(40)은 FAST와 SLOW 접속 사이를 중재하고, 데이터 싱크(18)의 데이터 버퍼(50)에 대해 2가지 접속 유형 스트림의 데이터 배치를 실행한다. OutLogic (40) executes the second data arrangement of the connection type streams to data buffer 50 of the mediate between FAST and SLOW connections, and a data sink 18. FAST 접속 상의 얼라인된 DDP 세그먼트가 수신지 버퍼로의 직접 배치를 위해 내부 데이터 버퍼(38)로 향하게 되는 상황은 얼라인된 DDP 세그먼트를 갖는 FAST 접속이 재조립 버퍼(34)를 우회하여 OutLogic(40)에 의해 직접 배치되기 때문에 "컷-스루(cut-through) 모드" 라 칭해진다. Situation where the alignment of DDP segments on a FAST connection may be directed to internal data buffer 38 for direct placement to a destination buffer is to the FAST connections having a DDP segments aligned bypassing reassembly buffer (34) OutLogic ( since the direct arrangement by 40) is referred to as "cut-through (cut-through) mode". 그러나, 2가지 접속 유형에 대해, 순서대로 수신된 데이터 스트림만이 OutLogic(40)을 통해 데이터 싱크(18)로 전달된다. However, with respect to two types of access, only the received data stream in the order it is transmitted to a data sink 18 via OutLogic (40). 도 3과 관련하여, 본 발명에 따른 InLogic(32)(도 2a)의 흐름도 및 그것의 데이터 전송(14A)의 처리가 더욱 상세하게 설명될 것이다. With respect to Figure 3, it will be described in greater detail processing of the flow chart and its data transmission (14A) of InLogic (32) (Fig. 2a) according to the present invention. 전술한 바와 같이, InLogic(32)은 내향 TCP 세그먼트를 처리하고, 수신된 세그먼트의 TCP 검증을 실행 하며, MPA CRC를 계산하고, SLOW 접속 데이터 스트림으로부터 FAST 접속 데이터 스트림을 분리한다. As noted above, InLogic (32) processes the inbound TCP segments, and running the TCP validation of received segments, calculates MPA CRC, and separates FAST connection data streams from SLOW connection data streams. 달리 언급되지 않는 한, "S"가 붙지 않는 참조 번호는 도 2a-2c에 도시된 구조를 나타낸다. The reference number is "S" non-stick unless otherwise stated represents the structure shown in Fig. 2a-2c. 단계 S2에서, InLogic(32)은 TCP 세그먼트(106)가 SLOW 접속에 속하는 지의 여부를 판정한다. In step S2, InLogic (32) judges whether or not a TCP segment 106 belongs to a SLOW connection. 이 경우에, InLogic(32)은 송신기가 어떤 식으로 접속을 분류했는지 판정한다. In this case, InLogic (32) determines that the transmitter classifies the connection in any way. 예(YES)이면, TCP 세그먼트(106)는 재조립 버퍼(34)로 향하게 되고, TCP 로직은 이 세그먼트가 성공적으로 수신된 것으로 간주한다(단계 S3). If yes, (YES), TCP segment 106 is directed to reassembly buffers (34), TCP logic is considered to be a segment has been successfully received (step S3). 아니오(NO)이면, 단계 S4에서, InLogic(32)은 TCP 세그먼트(106) 길이가, 지정된 MPA 세그먼트 길이보다 더 큰지 아닌지 판정하기 시작한다. If NO (NO), in step S4, the InLogic (32) it is started to determine whether a TCP segment 106 length is greater than the specified MPA segment length. 즉, TCP 헤더(126) 내에 지정된 TCP 세그먼트(106) 길이가 MPA 길이 필드(114) 내에 지정된 MPA 길이보다 더 긴지 아닌지 판정한다. That is, it is determined whether the TCP segment 106 length is specified in the TCP header 126, is longer than the further given MPA length in the MPA length field 114. 예이면, 이것은 TCP 세그먼트(106)가 다수의 DDP 세그먼트(112)를 포함한다는 것을 나타내는데, 그 처리에 대해서는 아래에 설명될 것이다. If yes, this is to indicate that TCP segment 106 includes multiple DDP segments 112, it will be described below for the process. 아니오이면, 이것은 TCP 세그먼트(106)가 단일 DDP 세그먼트(112 또는 112NA)를 포함한다는 것을 나타낸다. If NO, this indicates that TCP segment 106 includes a single DDP segment (112 or 112NA). 이러한 후자의 경우에, 단계 S5에서, InLogic(32)은 MPA 길이가 TCP 세그먼트(106) 길이보다 긴지 아닌지 판정한다. In the case of this latter, at step S5, InLogic (32) determines whether the MPA length of TCP segment 106 length is longer than that. 예이면, 이것은 다음 세가지 상황 중의 하나를 나타낸다: 1) 단일 DDP 세그먼트(112NA)가 TCP 세그먼트(106)에 얼라인되지 않고, MPA 길이 필드로 추정된 필드가 길이 필드가 아닌 상황; If YES, this indicates one of the following three situations: 1) the single DDP segment (situation 112NA) is not one of the field is a length field estimate is not aligned to TCP segment is 106, in MPA length field; 2) 단일 DDP 세그먼트(112)의 처음이 TCP 세그먼트(106)에 얼라인되지만, 단일 DDP 세그먼트의 길이가 TCP 세그먼트(106) 페이로드 크기를 초과하는 상황; 2) The situation in which the beginning of the single DDP segment 112, but is aligned to TCP segment 106, the length of the single DDP segment exceeds TCP segment 106 payload size; 또는 3) 수신된 단일 DDP 세그먼트(112)가 TCP 세그먼트(106)에 얼라인되지만, 손상된 MPA 길이 필드(114)를 갖는 상황. Or 3) the situation with a single received DDP segment 112, but is aligned to TCP segment 106, corrupted MPA length field 114. 처음의 두 경우(1 및 2)는 비얼라인된 단일 DDP 세그먼트(112NA)가 FAST 접속 상에서 수신되었고, 따라서 접속은 SLOW 접속으로 다운그레이드되어야 한다는 것을 나타낸다(단계 S3). If the first two (1 and 2) was the non-aligned single DDP segment (112NA) received on a FAST connection, and thus represents that the connection should be downgraded to a SLOW connection (step S3). 세번째 경우(3)는 접속 다운그레이드를 요구하지 않는다. If the third (3) does not require a connection to downgrade. 그러나, MPA 프레임(109) 길이가 TCP 세그먼트(106) 길이를 초과하는 이유가 식별되고 확인될 수 없기 때문에, 그러한 TCP 세그먼트(106)의 드롭(즉, 취소 및 비-전송)은 교착 상태[상기 경우(2)]를 초래할 수 있기 때문에 적당하지 않다. However, MPA frame 109, because the length can be identified and confirmed the reason for exceeding the length of TCP segment 106, the drop (i. E., Clear and non-transmission) of such TCP segment 106 is a deadlock [the If it is not suitable because it can result in (2)]. 즉, 그러한 TCP 세그먼트가 정말로 비얼라인된 DDP 세그먼트를 전달했다면, 송신기는 동일한 흐름을 따라, 교착상태를 초래하는 수신기에 의해 반복적으로 드롭될 수 있는 동일한 비얼라인된 DDP 세그먼트를 재전송할 것이다. That is, if such TCP segment passing truly non-alignment of DDP segment, the transmitter according to the same flow, will retransmit the same non-aligned with DDP segments of which can be dropped repeatedly by the receiver leading to a deadlock. 따라서, 단계 S3에서, InLogic(32)은 TCP 세그먼트(106)의 데이터 전송을 재조립 버퍼(34)로 향하게 하고, TCP 세그먼트(106)가 성공적으로 수신되었다는 것을 확인하도록 Ack를 스케쥴링하며, 접속을 SLOW 접속으로 다운그레이드한다[즉, 도 2b의 접속 유형 필드(62)가 FAST로부터 SLOW로 전환된다]. Thus, in step S3, InLogic (32) is, and scheduling an Ack to confirm that the direct data transfer of TCP segment 106 to reassembly buffers 34, and, TCP segment 106 is received successfully, the connection be downgraded to SLOW connections i.e., connection type field 62 of Figure 2b is switched from FAST to SLOW]. 후술되는 바와 같이, MPA 길이 필드(114)가 손상 되면[상기 경우(3)], 이것은 OutLogic(40)에 의해 검출되고, 접속은 검증 유닛(44)에 의해 검출된 CRC 에러로 인해 종료될 수 있다. As will be described later, MPA length when the field 114 is damaged - the case (3), this is detected by OutLogic (40), connection may be terminated because of a CRC error detection by the verification unit 44 have. 그러므로, 단계 S3에서, 접속 다운그레이드는 얼라인된 DDP 세그먼트(112) 내의 데이터 손상으로 인해 FAST 접속이 영구적으로 SLOW 접속으로 되지 않게 할 수 있다. Thus, in step S3, the connection downgrade may be due to data corruption in an aligned DDP segment 112, this does not FAST connection to a SLOW connection permanently. CRC 로직(64)이 "무효" 표시를 돌려 보내면, 즉 단계 S6에서 아니오이면, 이것은 본 발명에 따라 판정될 수 있는 다섯 가지 가능한 경우 중의 하나가 존재한다는 것을 나타낸다. CRC logic 64 is sent back to display "OFF", i.e., if NO in step S6, this indicates that one is present in the five kinds of cases can be determined in accordance with the present invention. 도 1c는 다섯가지 가능한 경우를 도시한 것으로, 단계 S8-S10은 InLogic(32)이 각각의 경우를 어떤 식으로 처리하는 지를 나타낸다. Figure 1c shows that the five possible cases, steps S8-S10 represents whether InLogic (32) The process in each case in any way. 어떤 경우든, 처리의 목적은 1) 비얼라인된 접속이 송신기에 의해 FAST 접속으로 선언되었더라도, 이 비얼라인된 접속의 종료를 방지하기 위한 것; In any case, the object of the process are: 1) even if the non-alignment of the connection is declared as a FAST connection by a transmitter, is to prevent the end of the non-alignment-connected; 2) FAST 접속에 속하는 얼라인된 DDP 세그먼트 내의 데이터 손상으로 인한 접속 종료 가능성을 줄이기 위한 것; 2) to reduce the possibility of disconnection due to data corruption in aligned DDP segments belonging to a FAST connection; 및 3) 따로따로 최소한도로 취급될 경우의 수를 줄이면서 가능한 한 단순하게 InLogic(32)을 유지하기 위한 것이다. And 3) is to simply maintain InLogic (32) as far as possible while reducing the number of cases to be treated separately to a minimum. 단계 S8에서, InLogic(32)은 도 1c에 A의 경우로 도시된 바와 같이, 새로 수신된 DDP 세그먼트(162)의 DDP 세그먼트 헤더(160)가 이전에 처리된 DDP 세그먼트(166)의 MPA 길이 필드(164)에 의해 참조되었는 지의 여부를 판정한다. In step S8, MPA length field of InLogic (32) is a, the DDP segment 162 of DDP segment header 160, the DDP segment 166 is processed prior to receiving the new as shown by the case of A in Figure 1c It determines whether referred to by 164. 이 경우에, 이전에 처리된 DDP 세그먼트(166)의 MPA 길이는 새로 수신된 DDP 세그먼트(162)의 MPR CRC의 검증동안에 검사되었으므로, 다음 세그먼트 내의 DDP 헤더(160)의 정확한 위치를 나타낸다. In this case, the MPA length of DDP segment 166 has been previously processed during the testing of a new verification of the MPR CRC received DDP segment 162, and then indicates the correct location of DDP header 160 in a segment. 단계 S6에서, A의 경우에 대한 CRC 무효는 단일 DDP 세그먼트(162) 데이터 또는 헤더(106)가 손상되어 있다는 것을 의미한다. In step S6, the CRC is valid for the case of A means that the single DDP segment 162 data or header 106 is damaged. 새로 수신된 세그먼트(162)의 TCP 재전송은 이 문제를 해결한다. TCP retransmission of the newly received segment (162) solves this problem. 따라서, 단계 S9에서, TCP 세그먼트(106)는 드롭되고, 세그먼트 수신은 확인되지 않은 것으로 간주된다. Thus, in step S9, TCP segment 106 is dropped, the segment reception is considered not confirmed. 새로 수신된 DDP 세그먼트(162) 헤더(160)가 이전에 처리된 DDP 세그먼트(166)의 MPA 길이 필드(164)에 의해 참조되지 않으면(즉, 단계 S8에서 아니오이면), 단계 S10에서, InLogic(32)은 도 1c에 B의 경우로 도시된 바와 같이, 새로 수신된 DDP 세그먼트(162) 헤더(160)가 새로 수신된 DDP 세그먼트(162) 내부에 위치한 마커(168)에 의해 참조되었는 지의 여부를 판정한다. If newly received DDP segment 162 header 160 is not referenced by MPA length field 164 of the DDP segment 166 is processed before (i.e., if NO in step S8), in step S10, InLogic ( 32) whether doeeotneun referenced by a marker (168 located inside newly received DDP segment 162 header 160 is newly received DDP segment 162, as shown in the case of B in Fig. 1c) It is determined. 즉, 마커(168)는 새로 수 신된 DDP 세그먼트(162)의 처음을 나타내고 있다. That is, marker 168 is a new number represents the start of the Placed DDP segment 162. The 이 경우에, 단계 S6에서, CRC 무효는: 1) 마커(168)가 정확한 값을 전달하고, 새로 수신된 DDP 세그먼트(162)가 손상된 DDP 헤더(160) 또는 데이터를 갖거나, 또는 2) 새로 수신된 DDP 세그먼트(162) 내부의 마커(168)가 손상되어 있다는 것을 나타낸다. In this case, in step S6, CRC invalid: 1) marker 168 is or pass the correct value, and has a newly received DDP segment 162 is corrupted DDP header 160 or data, or 2) a new received DDP segment 162, the internal markers 168 indicates that there is damage. 두 경우에서, 새로 수신된 DDP 세그먼트(162)의 재전송은 그 문제를 해결한다. In both cases, the re-transmission of the newly received DDP segment 162 resolves the problem. 따라서, 단계 S9에서, TCP 세그먼트는 드롭되고, 세그먼트 수신은 확인되지 않는다. Thus, in step S9, TCP segment is dropped, the segment reception is not confirmed. 새로 수신된 DDP 세그먼트(162) 헤더(160)가 새로 수신된 DDP 세그먼트(162) 내부에 위치한 마커(168)에 의해 참조되지 않으면, 즉, 단계 S10에서 아니오이면, 세가지 경우 중의 한가지가 존재한다. If newly received DDP segment 162 header 160 is newly received DDP segment 162 is not referenced by a marker 168 located inside, that is, if NO in step S10, it's one exists, of the three cases. 첫번째, 도 1c에 C의 경우로 도시된 바와 같이, 마커(168)는 새로 수신된 DDP 세그먼트(162) 내에 위치하지만, 세그먼트의 외부를 가리킨다. First, the marker 168, as illustrated in the case of C in FIG. 1c is located in a newly received DDP segment 162, but points outside of the segment. 두번째, 도 1c에 D의 경우로 도시된 바와 같이, 마커(168)는 새로 수신된 DDP 세그먼트(162) 내에 위치하지만, 세그먼트의 내부를 가리킨다. Located in the second, as illustrated in the case of D in Figure 1c, the marker 168 is newly received DDP segment 162, but points inside the segment. 세번째, 도 1c에 E의 경우로 도시된 바와 같이, 새로 수신된 DDP 세그먼트(162) 내에 어떤 마커도 위치하지 않는다. Third, as illustrated in the case of E in Fig. 1c, it does not have any marker located in the newly received DDP segment 162. C, D 및 E의 경우에서, CRC 로직(64)이 무효 표시를 돌려 보내는 이유는 확실하지 않는데, 비얼라인된 DDP 세그먼트(112NA)(도 1b)의 데이터 손상 및/또는 수신의 결과일 수 있다. In the case of C, D and E, CRC logic 64, the reason to return the invalid indication does not clear, the non-alignment of DDP segments (112NA) (Fig. 1b) of data corruption and / or be the result of receiving have. 그러한 세그먼트의 무제한 재전송은 비얼라인된 DDP 세그먼트(112NA)의 경우에 교착상태를 초래할 수 있다. Unlimited retransmit of such a segment can lead to deadlock in the case of non-aligned DDP segment, the (112NA). 잠재적인 교착상태를 피하기 위해, InLogic(32)은 단계 S3에서 나타낸 바와 같이, 새로 수신된 DDP 세그먼트(162)를 재조립 버퍼(34)로 향하게 하고, 세그먼트의 성공적 수신을 확인하도록 Ack를 스케쥴링하며, 접속을 SLOW 접속으로 다운그레이드함으로써 C, D 및 E의 경우를 다룬다. To avoid potential deadlock, InLogic (32) is, as shown in step S3, and direct the newly received DDP segment 162 to reassembly buffers 34, and scheduling an Ack to confirm successful reception of the segment, a, connected by downgraded to SLOW connections deals with the case of C, D and E. 무효 표시를 돌려 보내는 CRC 로직(64)이 얼라인된 DDP 세그먼트(112) 내의 데이터 손상으로 인한 것이었으면, 이 에러는 후술되는 바와 같이, SLOW 접속의 데이터를 처리할 때, OutLogic(40)에 의해 검출될 수 있고, 접속은 종료될 수 있다. Eoteumyeon it to return the invalid indication CRC logic 64 is due to the alignment of data corruption in the DDP segment 112, this error in the handling of data of, SLOW connection, as described below, by OutLogic (40) can be detected, the connection may be terminated. 그렇지 않으면, 접속은 영원히 SLOW 접속 상태로 있을 것이다. Otherwise, the connection will be forever connected to SLOW. 그러나, 후술되는 바와 같이, 제한된 재전송 시도 모드는 이 문제를 방지할 수 있다. However, the limited retransmission attempt mode as described below may avoid this problem. 도 3의 단계 S4로 돌아가서, InLogic(32)이 TCP 세그먼트(106) 길이가 MPA 프레임(109) 길이보다 더 큰 것으로 판정하면, 이것은 TCP 세그먼트(106)가 다수의 DDP 세그먼트(112)를 포함한다는 것을 나타낸다. Returning to step S4 of Fig. 3, that InLogic (32), the TCP segment 106 length of MPA frame 109 if it is determined to be greater than the length, this TCP segment 106 includes multiple DDP segments 112, It indicates that. 이 경우에, 단계 S11에서, CRC 로직(64) 검증 결과의 순차적인 검사는 처음부터 마지막 DDP 세그먼트(112)까지 행해진다. In this case, in step S11, the CRC verification result of the sequential scan logic (64) is conducted from the first to the last DDP segment 112. 모든 DDP 세그먼트(112)가 유효 CRC를 가지면, 즉, 예이면, 모든 DDP 세그먼트(112)는 TCP 세그먼트(106) 내에 완전히 포함되고, 적절하게 얼라인된 DDP 세그먼트(112)는 모두 유효하다. Having all DDP segments 112, the CRC is valid, that is, If YES, all DDP segments 112 are fully contained in TCP segment 106, are all properly aligned with the DDP segment 112 is valid. 이 경우에, 단계 S7에서, InLogic(32)은 수신된 TCP 세그먼트(106)를 수신지 데이터 버퍼, 예를 들어 데이터 싱크(18)의 데이터 버퍼(50)에 배치하는 OutLogic(40)에 의한 처리를 위해, 수신된 TCP 세그먼트(106)를 RNIC(16)의 내부 데이터 버퍼(38)에 배치함으로써 고속 경로 모드에서 DDP 세그먼트(112)를 처리한다. In this case, in step S7, InLogic (32) is processed by OutLogic (40) placing the received TCP segment 106 can be the data buffer 50 of the destination data buffers, e. G. A data sink (18) for, processes DDP segments 112 from the fast path mode by placing the received TCP segment 106 to internal data buffer 38 of RNIC (16). 또한, Ack는 이 TCP 세그먼트(106)의 성공적 수신을 확인하도록 스케쥴링된다. Also, Ack is scheduled to confirm successful reception of this TCP segment 106. [ InLogic(32)은 첫번째 실패가 검출되었을 때, CRC 검증 결과를 검사하는 것을 정지하며, 그것의 관리는 단계 S12-S13과 관련하여 설명된다. InLogic (32) is, when a first failure is detected, stops to check the CRC verification result, its management is described in conjunction with steps S12-S13. 단계 S12에서, InLogic(32)은 제1 DDP 세그먼트(112)가 CRC 로직(64)에 의해 판정된 바와 같이 무효 CRC를 가졌는지 판정한다. In step S12, InLogic (32) is checked for valid CRC gajyeotneunji as claim 1 DDP segment 112 is determined by the CRC logic 64. The 예이면, InLogic(32)은 단일 DDP 세그먼트에 대한 무효 CRC 경우와 유사하게 제1 DDP 세그먼트(112)를 처리한다(단계 S8). If YES, InLogic (32) processes the first DDP segment 1 112, similar to the case invalid CRC for a single DDP segment (step S8). 즉, InLogic(32)은 무효 CRC를 갖는 제1 DDP 세그먼트(112)를 단일 DDP 세그먼트(112)로서 취급하고, 무엇이 CRC 무효를 야기했는지, 즉 도 1c의 AE의 경우 중에 어떤 경우를 적용할지와 그 경우를 어떻게 적절하게 다룰지 판정하는 처리를 한다. That is, with what InLogic (32) is treated to claim 1 DDP segment 112 with an invalid CRC as a single DDP segment 112, and what is applicable to any case in the case of, that is, Fig. 1c that causes the CRC invalid AE How the case a process for determining if properly handled. 단계 S12가 아니오로 되면, 즉 제1 DDP 세그먼트(112)가 유효 CRC를 가졌으면, InLogic(32)은 단계 S13에서 중간 또는 최종 DDP 세그먼트(112)를 검사할 때 CRC 무효가 검출되었는지 판정하는 처리를 한다. If a NO is step S12, that is the 1 DDP segment processing 112 if had a valid CRC, InLogic (32) is whether CRC invalidity has been detected when checking an intermediate or final DDP segment 112 at step S13 determines and the. 예이면, InLogic(32)(도 1)은 CRC 무효를 야기한 DDP 세그먼트(112)의 데이터 또는 헤더(즉, 유효 CRC를 갖는 이전의 DDP 세그먼트의 길이)가 손상되었다는 것을 이 에러가 나타내기 때문에, 단계 S9로 진행한다. Because If YES, InLogic (32) (Fig. 1) is bet, this error appears that the damage (the length of previous DDP segment with the words, valid CRC) data or header of DDP segment 112 that caused the CRC invalid, the flow advances to step S9. 즉, CRC 에러는 동일한 TCP 세그먼트(106) 내의 중간 또는 최종 DDP 세그먼트(112) 상에 검출되었는데, 이것은 이전의 DDP 세그먼트가 유효 CRC를 가졌으므로, 이전의 DDP 세그먼트의 길이가 무효 CRC를 갖는 세그먼트의 헤더를 가리킨다는 것을 의미한다. I.e., CRC error was detected on the intermediate or final DDP segment 112 in the same TCP segment 106, this is because the previous DDP segment had a valid CRC, the segment length of a previous DDP segment with valid CRC It means that refers to the header. 이것은 A 경우(도 1c)의 설명과 일치한다. This is consistent with the explanation of (Fig. 1c) when A. 그러므로, A의 경우에서 설명된 바와 같이, 헤더의 위치는 알려지므로, CRC 에러는 데이터 또는 헤더 손상에 의해 야기된 것으로 알려진다. Therefore, as described in the case of A, the location of the header is known because, CRC error is known to be caused by data or header corruption. 따라서, 전체 TCP 세그먼트의 재전송은 교착상태 시나리오의 아무런 위험없이 이 문제를 해결할 것이다. Thus, the retransmission of the entire TCP segment will solve the problem without any risk of the deadlock scenario. 단계 S9에서, TCP 세그먼트는 드롭되고, 세그먼트 수신은 확인되지 않는다. In step S9, TCP segment is dropped, the segment reception is not confirmed. 단계 S13이 아니오로 되면, 즉, 중간 또는 최종 DDP 세그먼트(112)가 CRC 무 효를 야기하지 않았으면, 이것은 최종 DDP 세그먼트(112)의 MPA 길이 필드(114)가 TCP 세그먼트(106) 경계를 초과한다, 즉 최종 DDP 세그먼트가 TCP 세그먼트(106) 경계의 밖에 있거나, 너무 길다는 것을 나타낸다. If a NO is step S13, that is, if an intermediate or final DDP segment 112 has not cause a CRC no effect, which is MPA length field 114 of the last DDP segment 112 exceeds TCP segment 106 boundaries , that is the end DDP segment or outside of the TCP segment boundary (106), indicating that is too long. 이 경우에, InLogic(32)은 너무 긴 단일 DDP 세그먼트(112)와 동일한 상황을 다룬다. In this case, InLogic (32) addresses the same situation so long as a single DDP segment 112. 특히, InLogic(32)은 단계 S3에서, TCP 세그먼트(106)의 데이터 전송(14A)을 재조립 버퍼(34)로 향하게 하는 처리를 하고, TCP 세그먼트(106)가 성공적으로 수신되었다는 것을 확인하도록 Ack를 스케쥴링하며, 접속을 SLOW 접속으로 다운그레이드한다. In particular, InLogic (32) is Ack to confirm that in the step S3, that the process for directing the transfer of data (14A) of TCP segment 106 to reassembly buffers 34, and, TCP segment 106 is received successfully scheduling, and to downgrade the connection to the SLOW connection. 이러한 방식으로, 교착상태가 방지된다. In this way, deadlock is avoided. RNIC(16)가 TCP 세그먼트(106) 내에 포함된 다수의 DDP 세그먼트(112) 중의 하나를 드롭하는 것을 결정하면, 전체 TCP 세그먼트(106)가 드롭되는데, 이것은 구현을 간단하게 하고, 다루어질 필요가 있는 경우의 수를 감소시킨다. When RNIC (16) has decided to drop one of the multiple DDP segments 112 contained in a TCP segment 106, there is an entire TCP segment 106 is dropped, it needs to be simple, and treated the implementation reducing the number of cases that thereby. 앞에서 명백하게 설명되지 않았지만, 기타 데이터 전송 처리 또한 InLogic(32)의 전술한 동작과 함께 행해질 수 있다는 것을 알기 바란다. It should be understood that although not explicitly described earlier, other data transfer processing may also be performed along with the above-described operation of InLogic (32). 예를 들어, RNIC(16) 접속에 속하는 TCP 세그먼트의 필터링, 및 수신된 세그먼트의 TCP/IP 검증은 또한 TCP 체크섬 로직(66)(도 2c)을 통한 체크섬 검증을 포함하여 실행될 수 있다. For example, RNIC (16), filtering of TCP segments belonging to the connection, and the TCP / IP validation of received segments may also be performed including checksum validation via TCP checksum logic 66 (FIG. 2c). 내향 TCP 세그먼트(106)의 처리는 또한 MPA CRC의 계산, 및 CRC 로직(64)(도 2c)을 통한 이 CRC의 검증을 포함할 수 있다. Processing of inbound TCP segment 106 may also include verification of the CRC through the calculation, and the CRC logic 64 (FIG. 2c) of MPA CRC. CRC 계산 및 검증에 대한 한가지 특정 실시예는 더욱 상세하게 후술될 것이다. One particular embodiment for CRC calculation and validation will be described later in more detail. 검출된 에러의 원인 불명(예를 들어, 그러한 상황을 초래할 수 있는 하나의 예시적인 판정인 도 3의 단계 S10에서의 아니오)과 관련된 대안적인 실시예로서, " 제한된 재전송 시도 모드"는 교착상태를 방지하고 SLOW 접속으로 불필요하게 감소되는 FAST 접속의 수를 줄이기 위해 재전송 시도의 수를 제한하도록 구현될 수 있다. Unknown cause of the detected error an alternative embodiment associated with (e. G., NO at one illustrative determination that may result in such a situation, the step of Figure 3 S10), "the limited retransmission attempt mode" deadlock protection and can be implemented to limit the number of retransmission attempts to reduce the number of FAST connections that are needlessly reduced to SLOW connections. 특히, 전술한 바와 같이, C, D 및 E의 경우는 검출된 에러의 원인 불명으로 인해, DDP 세그먼트(112) 얼라인먼트의 손실이 없고, 데이터 손상에 의해 에러가 야기되었을 때 [OutLogic(40)에 의해] 잠재적으로 접속이 종료되는 SLOW 접속으로 접속이 다운그레이드될 수 있다(단계 S3). In particular, the [OutLogic (40) when an error was caused by data corruption, in the case of C, D and E are due to unknown cause of the detected error, DDP segment 112, there is no loss of alignment, as described above by] it can potentially be downgraded to a SLOW connection connected to a connection is terminated (step S3). 재전송 시도의 수를 제한하기 위해, 본 발명은 접속을 다운그레이드하기 전에 소정 수의 재전송을 가능하게 하기 위해 추가 필드를 접속 문맥(42)(도 2b)에 제공한다. To limit the number of retransmit attempts, the present invention provides before downgrading the connection to a connection context 42 (FIG. 2b) an additional field in order to enable re-transmission of a predetermined number. 특히, 도 2b에 도시된 바와 같이, 접속 문맥(42)은 다수의 회복 시도 필드(RecoveryAttemptsNum)(292), 최종 회복 순서 번호 필드(LastRecoverySN)(294) 및 최대 회복 시도 수 필드(MaxRecoveryAttemptsNum)(296)를 포함하는 한 세트의 필드(290)를 포함한다. In particular, as shown in FIG. 2b, connection context 42 includes a number of recovery attempts field (RecoveryAttemptsNum) (292), the final recovery sequence number field (LastRecoverySN) (294) and a maximum recovery attempts field (MaxRecoveryAttemptsNum) (296 ) includes a field (290) of a set comprising a. RecoveryAttemptsNum 필드(292)는 최종 갱신 이후로 접속을 위해 행해진 회복 시도의 수를 유지하고; RecoveryAttemptsNum field 292 maintains the number of recovery attempts made for the connection since the last update, and; LastRecoverySN 필드(294)는 마지막으로 시작된 회복 동작의 순서 번호(SN)를 유지하며; LastRecoverySN field 294 holds the last sequence number (SN) of the recovery operation is started, and; MaxRecoveryAttemptsNum 필드(296)는 접속을 다운그레이드하기 전에 InLogic(32)에 의해 행해져야 되는 최대 회복 시도의 수를 정의한다. MaxRecoveryAttemptsNum field 296 defines the maximum number of recovery attempts that should be performed by InLogic (32) before downgrading the connection. 도 4a를 참조하면, 동작시, 새로운 순서로 수신된 데이터 전송이 (일반적으로 도 4a에서 단계 S101로 도시된) 에러를 포함한다는 것을 InLogic(32)이 검출할 때, (도 3의 단계 S3에서) 접속을 SLOW 접속으로 바로 다운그레이드하는 것보다는 오히려, InLogic(32)은 그 에러가 포함된 데이터 전송에 대해 행해질 확실한 재전 송 수를 제공한다. Referring to Figure 4a, the data transmission received by the operation, the new sequence that includes a (generally illustrated in Figure 4a in step S101) error InLogic (32) in step S3 in this case be detected, (3 ) rather, InLogic (32), rather than immediately downgrade the connection to the SLOW connection provides a number of retransmission made to certain of the data transmitted that includes the error. 단계 S101은 비얼라인된 DDP 세그먼트(112NA) 또는 데이터 손상에 의해 야기되는 다수의 에러 판정에 일반적이라는 것을 알기 바란다(단계 S101은 예를 들어, 도 3의 단계 S5에서 예이거나 도 3의 단계 S10에서 아니오인 경우에 적용할 수 있다). Step S101 is should be noted that typically a large number of error determination, which is caused by the non-alignment of DDP segments (112NA) or data corruption (step S101, for example, or YES in step S5 in Fig. 3 The steps of the three-S10 can be applied in the case of NO are) in. 단계 S102에서, InLogic은 1씩 증가하는 RecoveryAttemptsNum에 의해 이 에러가 포함된 데이터 전송을 위해 이 전송 시도를 기록하는 처리를 한다. In step S102, InLogic is a process for recording a transmission attempt for the data transfer containing the error by RecoveryAttemptsNum which increases one by one. 또한, InLogic은 이전에 거기에 저장된 순서 번호와 새로 수신된(하지만 드롭된) 데이터 전송의 순서 번호 사이의 가장 큰 순서 번호를 저장하기 위해 LastRecoverySN을 갱신한다. In addition, InLogic updates the LastRecoverySN to store the largest sequence number between the previously stored thereon the sequence number and the newly received (but dropped) data transfer sequence number. 즉, InLogic은 최소한 하나의 이전에 수신된 에러-포함 데이터 전송과 새로 수신된 에러-포함(하지만 드롭된) 데이터 전송 사이의 가장 큰 순서 번호를 저장하기 위해 LastRecoverySN을 갱신한다. That is, InLogic at least one previously received error-updates the LastRecoverySN to store the largest sequence number between including (but dropped) data transfer including data transfer and the newly received error. 새로 수신된 에러-포함 데이터 전송은 새로 수신된 에러-포함 데이터 전송의 순서 번호를 저장된 가장 큰 순서 번호와 비교함으로써 가장 큰 순서 번호보다 큰 순서 번호를 갖도록 결정된다. The newly received error-including data transfer is newly received error-is determined by comparing the largest sequence number stored in the sequence number included in the data transmitted so as to have the largest sequence number greater than the sequence number. LastRecoverySN 기록의 중요성은 아래에서 명백해질 것이다. The importance of recording LastRecoverySN will become apparent below. 다음에, 단계 S103에서, InLogic(32)은 RecoveryAttemptsNum[필드(292)]가 MaxRecoveryAttemptsNum[필드(296)]를 초과하는지 판정한다. Determines that the following, at step S103, InLogic (32) is RecoveryAttemptsNum [Field 292] exceeds MaxRecoveryAttemptsNum [Field 296]. 아니오이면, 단계 S104에서, InLogic(32)은 TCP 세그먼트(106)를 드롭하고 성공적 수신을 확인하지 않는데, 이것은 TCP 세그먼트의 재전송의 원인이 된다. If NO, at step S104, InLogic (32) will drop the TCP segment 106 and does not confirm successful receipt, which causes a retransmission of the TCP segment. 그 다음, 처리는 단계 S1(도 3)로 되돌아간다. Then, the process returns to step S1 (Fig. 3). TCP 세그먼트(106)가 손상되었으면, 재전송은 데이터 전송(14A)이 (도 3의 단계 S7에서) FAST 접속으로 메모리에 직접 배치되도록 손상을 치료해야 한다. If TCP segment 106, is corrupted, the retransmission should be treated such that damage directly placed in the memory by the data transfer (14A) (step S7 in Fig. 3) a FAST connection. 대안적으로, 처리가 다른 에러 검출(예를 들어, 도 3의 단계 S10) 을 계속 보고하면, RecoveryAttemptsNum[필드(292)]는 결국 MaxRecoveryAttemptsNum[필드(296)]를 초과할 것이고, 단계 S106에서 예로 되게 할 것이다. Alternatively, if the processing is different error detection (e. G., Step S10 in Fig. 3) to continue to report, RecoveryAttemptsNum [Field 292] will be longer than the end MaxRecoveryAttemptsNum [field (296), by way of example in step S106 It will be presented. 이 경우에, InLogic(32)은 단계 S105로 진행하여, InLogic(32)이 접속을 SLOW 접속으로 다운그레이드하고, 에러-포함 데이터 전송(14A)을 재조립 버퍼(34)에 배치하며, 이 TCP 세그먼트의 성공적 수신을 확인하는 Ack를 스케쥴링한다. In this case, InLogic (32) proceeds to step S105, InLogic (32), the downgrading the connection to the SLOW connection and the error-and place the contained data (14A) to reassembly buffer 34, a TCP schedules an Ack confirming successful receipt of the segment. 상기 프로세스는 각각의 에러-포함 데이터 전송마다 발생한다. The process each error-including data transfer is generated for each. 도 4b는 데이터 손상이 보통 다수의 연속적인 TCP 세그먼트에서는 발생하지 않지만, 비얼라인된 세그먼트가 몇개의 후속 TCP 세그먼트에 영향을 줄 수 있다는 사실에 대처하는 제한된 재전송 시도 모드의 다른 요소를 나타낸 것이다. Fig. 4b is a corruption of the data will normally shows the number of successive does not occur in a TCP segment, and the other elements of the non-aligned segments with limited retransmission attempt mode to cope with the fact that can affect several subsequent TCP segments. 예를 들어, FAST 접속은 긴 기간동안, 예를 들어, 5시간 동안 유지될 수 있고, 때때로, 예를 들어 한시간에 한번, CRC 검증이 실패로 되게 할 데이터 손상을 가질 수도 있다. For example, FAST connection may, for over a long period, for example, can be maintained for 5 hours, at times, for instance once an hour, may have data corruption CRC validation to be a failure. 이러한 일이 발생할 때, RecoveryAttemptsNum[필드(292)]는 에러-포함 데이터 전송(즉, 손상된 세그먼트)이 드롭될 때마다 증가될 수 있다. When this occurs, RecoveryAttemptsNum [Field 292] is the error may be increased each time a data transfer includes (i. E., Corrupted segment) is dropped. 이 프로세스는 서로 다른 세그먼트가 서로 다른 기간에 데이터 손상으로 드롭되는 상황에 대처하고, 몇몇(대개는 하나)의 재전송 동작 후에, 이들 세그먼트는 성공적으로 수신되고, 메모리에 배치된다. The process and different segments to deal with situations in which the drop of data corruption at different periods, and after the retransmission operation of several (usually one), these segments are successfully received, it is placed in memory. 따라서, 이들 세그먼트를 위한 회복 동작은 성공적으로 완료되었고, 회복된 데이터 손상의 경우들은, 즉 새로운 에러 세그먼트의 수신으로 인해 새로운 회복 모드로 들어갈 때는, 카운트되지 않는다. Thus, the recovery operation for these segments was successfully completed, in the case of the restored data are damaged, i.e., due to the reception error of the new segment when entering a new recovery mode, it is not counted. 제한된 재전송 시도 모드로부터 빠져나가기 위해, 새로 수신된 순서적인 데이터 전송(즉, InOrderTCPSegmentSN)의 TCP 세그먼트 순서 번호(SN)가 LastRecovery 순서 번호(SN)[도 2b에서의 필드(294)]보다 큰 지의 여부에 관한 판정은 단계 105에서 행해진다. To exit from the limited retransmission attempt mode, whether newly received order data transfer (i. E., InOrderTCPSegmentSN) of the TCP segment sequence number (SN) is LastRecovery sequence number (SN) [FIG field of 2b (294)] is greater than the fingers determination is made in step 105. 즉, FAST 접속에 속하는 각각의 새로 수신된 순서적인 TCP 세그먼트의 순서 번호는 하나 이상의 이전에 수신된 에러-포함 데이터 전송으로부터 선택된 저장된 가장 큰 순서 번호와 비교된다. That is, the sequence number of each newly received in the order of TCP segments belonging to a FAST connection is an error in the reception of one or more earlier-is compared to a stored largest sequence number selected from the included data. (더 큰 SN을 갖는 비순서적인 세그먼트의 수신은 에러 회복이 완료되었다는 것을 의미하는 것이 아니라는 것을 알기 바란다.) 그러나, 회복이 완료되는 한 표시기는 회복 모드로의 엔트리를 야기한 세그먼트 후에 전송된 TCP 세그먼트가 수신된다는 것이다. (The reception of the non-sequential segments having a high SN is should be noted that it is not to mean that error recovery is complete.) However, one indicator that recovery is complete is the TCP segment transmitted after the segment that caused entry to the recovery mode, that will receive. 이 상황은 InOrderTCPSegmentSN을 LastRecoverySN과 비교함으로써 판정될 수 있다. This situation can be determined by comparing the InOrderTCPSegmentSN and LastRecoverySN. 이 판정은 이 접속을 위해 수신된 TCP 세그먼트의 실제로 임의의 처리 단계에서 행해질 수 있다. This determination can be done in practice any process steps of the TCP segment received for this connection. 예를 들어, 도 3의 단계 S9 이후, 또는 도 4a의 단계 102 이전이다. For example, after the step S9 in FIG. 3, or step 102 before the Figure 4a. 순서적인 세그먼트 SN이 LastRecoverySN보다 클 때, 즉 새로운 TCP 세그먼트가 수신되고, 단계 S105에서 예가 판정될 때, 단계 S106에서, RecoveryAttemptsNum[도 2b에서의 필드(292)]는 리셋, 즉 0으로 설정된다. When the order of the segment SN is greater than LastRecoverySN, that is, a new TCP segment is received, when an example is determined in step S105, in step S106, RecoveryAttemptsNum [field 292 in Fig. 2b] is set to a reset, or zero. 상기 예와 관련하여, 단계 S105는 긴 기간, 예를 들어 5시간 이후에 (즉, RecoveryAttemptsNum이 MaxRecoveryAttemptsNum을 초과하기 때문에) SLOW 접속으로의 FAST 접속의 불필요한 다운그레이딩을 방지하는데, 드롭된 세그먼트는 데이터 손상으로 인해 드롭되었고, 그 다음 송신기가 세그먼트를 재전송한 후에, 얼라인된 세그먼트로서 성공적으로 수신되어 처리되었다. In relation to the above example, step S105 is a long period, for example after 5 hours (i.e., because RecoveryAttemptsNum this exceeds MaxRecoveryAttemptsNum) to avoid unnecessary down grading of the FAST connection to a SLOW connection, the drop segment data corruption was due to the drop, then the transmitter is then retransmitted segment was successfully received treatment as aligning the segment. 단계 S105에서 아니오인 경우 또는 단계 S106 이후에, 세그먼트 처리는 평소대로, 예를 들어 도 3의 단계 S1과 같이 진행된다. In the case of No, or step S106 after step S105, segment processing as usual, for example, proceeds as step S1 of Fig. 상기 처리를 사용하면, 허용된 재전송의 수는 MaxRecoveryAttemptsNum 필 드(296)의 설정에 의해 사용자 정의될 수 있다. With the above processing, the number of retransmits allowed can be user defined by setting the MaxRecoveryAttemptsNum field 296. 제한된 재전송 시도 모드가 도 4a-4b와 관련하여 설명되고, 도 3의 단계 S10에 관한 에러 검출과 관련하여 설명되었지만, 제한된 재전송 시도 모드는 아래에 더욱 설명되는 바와 같이, 단계 S10의 에러 검출 바로 이후로 적용될 수 있다는 것을 알기 바란다. And described with a limited retransmission attempt mode connection with Figure 4a-4b, also has been described in connection with error detection according to the third step S10, the retransmission attempts limited mode as will be further described below, in step S10 of the error detection immediately after the it should be understood that they can be applied to. 제한된 재전송 시도 모드는 또한, 세그먼트가 ULP 고려사항으로 인해 드롭되었을 때 즉시 복제 Ack를 보내는, 후술된 D 부분의 TCP 재전송 처리 속도의 증가 와 함께 사용하는 것이 유리하다는 것을 알기 바란다. The limited retransmission attempt mode also should be noted that the segment is that it is free to use with immediate increase of TCP retransmission processing speed of the outgoing replication Ack, the later part D when the drop due to the ULP considerations. 도 5를 참조하면, 하나 이상의 비순서적으로 수신된 DDP 세그먼트(112)가 고속 경로 모드에서 수신지 데이터 버퍼(50)에 배치된 후에 접속이 다운그레이드되는 (도3의 단계 S3) 유일한 상황의 처리조작에 관해 이제 설명될 것이다. 5, the connection may be downgraded after DDP segment 112 is received by one or more non-forward books are arranged on the destination data buffers 50 in the fast path mode (step in FIG. 3 S3) process of the unique circumstances It will now explain the operation. 도 5에 도시된 바와 같이, 4개의 TCP 세그먼트 표시된 패킷(Pkt)은 비순서적으로, 즉, 3, 4, 1 및 2의 순서로 수신된다. The packet (Pkt) indicated four TCP segments as shown in Figure 5 is a non-forward books, that is, 3, 4, are received in the order of 1 and 2. 접속이 SLOW 접속으로 다운그레이드될 때, 다운그레이딩 순간부터 수신된 모든 데이터는 재조립 버퍼(34)에 배치되고, 순서적으로, 즉 Pkt 1, 2, 3 및 4와 같이 재조립된다. When a connection is downgraded to a SLOW connection, all data received from the down-grading the moment are disposed in re-assembly buffer (34), in sequence, that is, re-assembling as shown in Pkt 1, 2, 3 and 4. 이 경우에, TCP 프로토콜을 따라, InLogic(32)은 그러한 세그먼트들이 수신되었다는 기록을 유지한다. In this case, according to the TCP protocol, InLogic (32) maintains a record that such a segment has been received. 드물긴 하지만, 세그먼트(들), 예를 들어 Pkt #3(어두운 부분)이 수신지 데이터 버퍼(50)에 바로 배치되는 상황이 발생할 수 있다. In the unlikely event, segment (s), for example, may cause a situation in which immediately placed in Pkt # 3 (dark portion) is a destination data buffer 50. 이러한 상황은 InLogic(32)이 모든 데이터가 수신되었다고 추정한다 하더라도, 재조립 버퍼(34) 내의 위치가 '불필요한(garbage)' 데이터, 즉 갭 또는 홀로 채워져 있는 패킷 3(Pkt #3)을 통상적으로 갖고 있을수 있게 한다. Even if this situation is to estimate the InLogic (32) that all data is received, the location in reassembly buffers 34 by the "extra (garbage)" data, that is, a gap or a packet 3 filled alone (Pkt # 3) typically have to make iteulsu. 처리가 계속 수정될 수 없게 되면, OutLogic(40)이 재조립 버퍼(34)를 수신지 데이터 버퍼(50)에 전송할 때, 고속 경로 모드 상에서 보다 일찍 전송되었던 패킷 3(Pkt #3)은 '불필요한' 데이터로 덮어 쓰여질 것이고, 이것은 데이터를 손상시킬 것이다. If no processing is to be continued modification, OutLogic (40) the time to transmit to the destination data buffers 50, a reassembly buffer 34, packet 3 was earlier transmitted than on the fast path mode (Pkt # 3) is "unnecessary 'it will be overwritten with data, which will damage the data. 하드웨어 복잡도를 추가하지 않고 이 문제를 해결하기 위해, 대안적인 실시예에서, InLogic(32)은 접속이 FAST 접속이었을 때 비순서적으로 수신된 세그먼트(즉, 도 5의 Pkt #3)에 대해 잊어버리도록 TCP 로직에 명령한다. To solve this problem without adding hardware complexity, in an alternative embodiment, library InLogic (32) is connected to a forget about the segments (i. E., Pkt # 3 in FIG. 5) receives a non-forward book when he was a FAST connection to instruct the TCP logic. 특히, InLogic(32)은 단계 S3(도 3)에서 접속을 SLOW 접속으로 다운그레이드할 때 비순서적으로 배치된 데이터 전송을 위한 TCP 홀을 소거하도록 구성되고, 이들 패킷이 수신된 송신기로의 수신 보고(SACK 옵션)를 정지한다. In particular, InLogic (32) is a step S3, when (Fig. 3) to downgrade the connection to SLOW connections from being configured to mute the TCP hole for the data transmission arranged in a non-forward publications, these packet report received to the received transmitter the (SACK option) will stop. 결과적으로, 송신기는 수신지 데이터 버퍼(50)에 비순서적으로 직접 배치된 세그먼트(들), 즉 Pkt #3을 포함하는 모든 응답없는 데이터를 재전송한다. As a result, the transmitter retransmits the destination without any response data including the direct placement of the segment (s), that is, Pkt # 3 to the non-forward books in the data buffer 50. 재전송된 데이터는 수신될 때, 재조립 버퍼(34)에 기입되고, 임의의 비순서적으로 직접 배치된 세그먼트들은 OutLogic(40)이 재조립 버퍼(34)로부터 데이터를 전송할 때 수신지 데이터 버퍼(50)에서 덮어 쓰여진다. The retransmitted data are received, is written to reassembly buffers 34, directly arranged in any non-forward publications segments OutLogic (40) can when transferring data from reassembly buffers 34. Destination data buffer (50 ) in overwritten. 이 기능은 RNIC(16)가 이와 관련하여 수신지 데이터 버퍼(50)에 비순서적으로 배치된 세그먼트를 '드롭'한다는 것을 사실상 의미한다. This feature in effect means that RNIC (16) is In this connection destination "drop" the segments arranged in a non-forward books in the data buffer 50. 그러한 방법은 재조립 버퍼(34) 내의 '갭이 있는' 순서적 스트림의 경우를 제거해서, 그러한 동작을 초래할 수 있는 드문 조건으로 인한 가시적인 성능 저하를 야기하지 않는다. Such a method does not cause visible performance degradation by removing the case of the stream sequentially "in the gap" in the re-assembly buffer (34), due to the unusual conditions which may lead to such behavior. 다른 대안적인 실시예로서, 본 발명은 도 6에 도시된 바와 같은 접속 업그레 이드 절차를 포함할 수 있다. In another alternative embodiment, the present invention may include a connection upgrade procedure as illustrated in FIG. 전술한 고속 경로 모드의 목적은 얼라인 DDP 세그먼트(112)를 전달하는 접속을 위해 재조립 버퍼(34)의 바이패스를 허용하기 위한 것이다. The purpose of the above-described high-speed path mode is to allow bypass of reassembly buffers 34 for a connection carrying aligned DDP segments 112. The 그러나, FAST 접속에서조차, 데이터 소스(12) 또는 중간 네트워크 장치는 간헐적인 비얼라인된 DDP 세그먼트를 생성할 수 있는데, 이것은 전술한 기술에 따라 FAST 접속이 SLOW 접속으로 다운그레이드되게 한다. However, even in FAST connections, a data source 12 or intermediate network device may generate intermittent non-aligned DDP segment a, which causes FAST connections are downgraded to SLOW connections according to the techniques described above. 간헐적인 동작은, 예를 들어 TCP 재전송 동안의 최대 세그먼트 크기(MSS) 변경, 또는 그외 다른 산발적인 시나리오에 의해 야기될 수 있다. Intermittent operation, for example, be caused by the maximum segment size (MSS) changes, or other sporadic scenarios for other TCP retransmission. 도 6에 도시된 바와 같이, 이 상황으로부터 회복하기 위해, 본 발명은 또한, 예를 들어 단계 S3(도 3)에서, 보다 이른 다운그레이드 후에 SLOW 접속에서 FAST 접속으로의 접속 업그레이드를 제공할 수 있다. For as shown in FIG. 6, to recover from this situation, the present invention also, for example, after the step S3 (FIG. 3), an earlier downgrade, it is possible to provide a connection upgrade to a FAST connection in a SLOW connection . 업그레이드를 수용하기 위해서는, 여러 상황이 있어야 된다. In order to accommodate the upgrade, and should have different situations. 대안적인 실시예의 제1 단계 S31에서, InLogic(32)은 재조립 버퍼(34)가 비었는지 판정한다. In an alternative embodiment, the step S31 1, InLogic (32) determines the re-assembly buffer 34 is empty. 아니오이면, 업그레이드가 발생하지 않는다(단계 S32). If no, the upgrade does not occur (step S32). 단계 S31에서 예가 판정되면, 단계 S33에서, InLogic(32)은 얼라인된 DDP 세그먼트(112)가 수신되고 있는지 판정한다. If YES is determined in step S31, in step S33, InLogic (32) determines whether there is an aligned DDP segment 112 has been received. 아니오이면, 업그레이드가 발생하지 않는다(단계 S32). If no, the upgrade does not occur (step S32). 단계 S33에서 예가 판정되면, 단계 S34에서, InLogic(32)은 접속이 송신기, 예를 들어 데이터 소스(12)에 의해 FAST 접속으로 시작되었는지 판정한다. If YES is determined in step S33, in step S34, InLogic (32) determines that the connection is the transmitter, for example, starting with FAST connection by a data source (12). 단계 S24에서 아니오가 판정되면, 업그레이드가 발생하지 않는다(단계 S32). If NO is determined in step S24, the upgrade does not occur (step S32). 단계 S34에서 예가 판정되면, 접속은 FAST 접속으로 업그레이드된다(단계 S35). If YES is determined in step S34, the connection is upgraded to the FAST connection (step S35). 다른 대안적인 실시예는 TCP 세그먼트(106)가 수신되지만, RDMA 또는 ULP 고려사항, 예컨대 손상, DDP 세그먼트의 무효 CRC 등등으로 인해 드롭되는 상황에 대처한다. Other alternative embodiments will deal with the situation in which a TCP segment 106 is received, but, due to the drop RDMA or ULP considerations, such as invalid CRC and so the damage, DDP segment. 전술한 절차에 따르면, TCP 세그먼트(106)가 수신되고 TCP 체크섬을 보냈지만, 세그먼트를 커버하는 TCP Ack를 송신하지 않고 InLogic(32)에 의해 드롭되는 경우(즉, 도 3의 단계 S9)가 여러번 있다. According to the above-described procedure, TCP segment 106 is received and sent but the TCP checksum, and if no transmits the TCP Ack covering the segment being dropped by InLogic (32) (i.e., Step S9 in Fig. 3) a number of times have. 이 때, 종래의 절차는 그들 패킷의 재전송을 시도하려고 했다. In this case, the conventional procedure was to try to retransmit their packets. 특히, 기본 방식(소위, "Reno 프로토콜")에서, TCP 송신기는 3개의 복제된 Ack(즉, 순서대로 수신된 순서 번호를 증가시키지 않는 Ack)를 얻을 때 '고속 재전송' 모드를 시작한다. In particular, in the default way (so-called, "Reno protocol"), TCP transmitter starts the "fast retransmit" mode you get (Ack does not increase the sequence number that is received in the order) three cloned Ack. 예를 들어, 2개의 TCP 세그먼트 A와 B가 있는데, TCP 순서로 세그먼트 A가 세그먼트 B의 다음에 온다고 하자. For example, there are two TCP segments A and B, the segment A in TCP order let come in the next segment B. 세그먼트 A가 드롭되면, 수신기는 세그먼트 B를 수신할 때만 복제 Ack를 보낼 수 있다. If segment A is dropped, the receiver can send a duplicate Ack only when it receives a segment B. 이 복제 Ack는 "나는 세그먼트 A를 기다리고 있지만, 다른 세그먼트, 즉 세그먼트 B를 수신했다"는 것을 나타낼 수 있다. The replication Ack may indicate that "although I await the segment A, the other segments, namely receiving the segment B". Reno 프로토콜 하의 '고속 재전송' 모드에서, 송신기는 하나의 세그먼트를 보낸 다음에, 다른 패킷을 재전송하기 위해 다른 3개의 복제 Ack를 기다린다. In Reno protocol under the "fast retransmit" mode, the transmitter is then sent to one segment and wait for another three clones Ack to retransmit another packet. ("새로운-Reno 프로토콜"과 같은) 더욱 진보적인 방식은 '고속 회복' 모드로 각각의 수신된 복제에 대해 세그먼트를 재전송할 수 있게 한다. More progressive scheme (the "new -Reno protocol", such as a) makes it possible to retransmit a segment for each received duplicate in the "Fast Recovery" mode. 이러한 처리 이후의 로직은, 하나의 세그먼트가 네트워크를 떠났으면, 송신기가 다른 패킷을 네트워크에 보낼 수 있게 한다. Logic after this processing, if one segment left the network, enables the transmitter to send another packet to the network. 재전송을 용이하게 하기 위해, 본 발명의 대안적인 실시예에 따르면, InLogic(32)은 TCP에 의해 유효로 판정되지만 상위 계층 프로토콜(ULP) 판정에 기초하여(예를 들어, 도 3의 단계 S9에서) TCP에 의해 드롭된 수신 TCP 세그먼트를 커버하는 제1 복제 TCP 긍정응답(Ack)을 생성하고; In order to facilitate re-transmission, according to an alternative embodiment of the invention, InLogic (32) is determined to be valid by TCP, but on the basis of the determined upper layer protocol (ULP) (e.g., in step S9 of Fig. 3 ) and generates a first duplicate TCP acknowledgment (Ack) covering a received TCP segment dropped by the TCP; 복제 TCP Ack를 송신한다. It sends the replication TCP Ack. ULP는 전술한 바와 같이, MPA 프로토콜, DDP 프로토콜 및 RDMA 프로토콜 중의 하나 이상을 포함할 수 있다. ULP may comprise as, MPA protocol, DDP protocol, and at least one of the RDMA protocol described above. 제1 복제 TCP Ack는 TCP 세그먼트가 순서적이든 비순서적이든 상관없이, 그리고 다음의 순서적인 TCP 세그먼트가 수신되지 않은 경우라도, TCP 세그먼트에 대해 생성된다. The first cloned TCP Ack, even if no matter the TCP segment or non-forward order book publications, and does not receive the next order of TCP segments are generated for a TCP segment. InLogic(32)은 또한 다음의 비순서적인 수신된 TCP 세그먼트를 커버하는 제2 복제 TCP Ack를 생성하고, 제2 복제 TCP Ack를 전송할 수 있다. InLogic (32) may also generate a second duplicate TCP Ack covering a received TCP segment, then sequential non-on, and transmit the second duplicate TCP Ack. 이러한 상기 처리는 다음의 순서적인 세그먼트(예를 들어, 상기 예에서 세그먼트 B)가 아직 수신되지 않았을 지라도 (예를 들어, 상기 예에서 세그먼트 A에 대한) 복제 Ack의 생성을 효과적으로 할 것이므로, 전술한 재전송 규칙 하에서 송신기가 고속 경로 모드로 재진입하는 처리의 속도를 증가시킬 수 있다. Such a process is, even if this has not already been received (e.g., in the example of the segment A), because for the production of replication Ack effectively, the above the following sequence of segments (e.g., segments in the example B) it is possible to increase the processing speed of the transmitter to re-entry to the fast path mode under the retransmission rules. 더욱 구체적으로, 세그먼트 B가 수신되지 않은 경우라도, 송신기는 유효 TCP 세그먼트인 세그먼트 A가 ULP 고려사항으로 인해 수신되어 드롭되었다는 것을 알 수 있다. More specifically, even if segment B has not been received, the transmitter is valid TCP segment, the segment A can be seen that the reception is due to the drop ULP considerations. 결과적으로, 추가 복제 Ack는 재전송이 시작되기 전에 다수의 복제 Ack가 수신되어야 하는 경우에 송신기가 더 빨리 재전송 절차를 시작하게 한다. As a result, additional reproduction Ack has started a number of the faster retransmission procedure in case the transmitter must be received before retransmission begins replication Ack. 이 방법은 TCP 세그먼트(106)가 ULP에 성공적으로 도달되었고, ULP 고려사항(무효 CRC)으로 인해 드롭되었기 때문에, TCP 원칙을 위반하지 않는다. This method was because the TCP segment 106 was successfully reach the ULP, the drop was due to ULP considerations (invalid CRC), it does not violate TCP principles. 그러므로, 패킷은 IP 프로토콜에 의해 드롭 또는 재순서화되지 않았다. Therefore, the packet is not re-ordered or drop by the IP protocol. 이 방법은 RNIC(16)가 도 4a와 관련하여 개략적으로 나타낸 바와 같은 제한된 재전송 시도 모드를 구현할 때, 즉 단계 S103에서 Ack가 보내질 때, 특히 유익하다. The method as in the RNIC (16) in connection with Figure 4a schematically implement a limited retransmission attempt mode as shown by, i.e., when the Ack is sent at step S103, is particularly advantageous. 착신 이더넷 프레임의 종래의 처리는 필터링 프로세스에서 시작한다. Conventional processing of incoming Ethernet frames starts with a filtering process. 필터링하는 목적은 유효 이더넷 프레임을 무효 이더넷 프레임으로부터 분리하기 위한 것이다. The purpose of filtering is to separate valid Ethernet frames from invalid Ethernet frame. "무효 프레임"은 손상된 프레임이 아니라, RNIC(16)에 의해, 예를 들어 MAC 필터링-MAC 주소에 기초한 프레임 선택, 가상 구내 정보 통신망(VLAN) 필터링-VLAD 태그에 기초한 프레임 선택 등에 의해 수신되지 않아야 되는 프레임이다. "Void frame" is not to be received by a frame, not damaged by the RNIC (16), for example, frame selection based on MAC address filtering -MAC, virtual local area network (VLAN) filtering-frame selection based on a tag or the like -VLAD It is that the frames. RNIC(6)로 들어가도록 허용된 유효 프레임은 또한 상이한 유형으로 분리된다. The valid frame allowed to enter the RNIC (6) is also separated into different types. 이들 유형 중의 하나는 TCP 세그먼트이다. One of these types is a TCP segment. 필터링 프로세스는 전체 이더넷 프레임의 저장-전송 처리를 조금도 실행할 필요없이, 실행중에 행해진다. The filtering process is stored in the entire Ethernet frame without any need to perform the transmission processing is performed during execution. TCP 세그먼트 처리의 다음 단계는 TCP 체크섬 계산 및 검증이다. The next step of TCP segment processing is TCP checksum calculation and validation. 체크섬 계산은 소정의 알고리즘을 사용하여 통상적으로 데이터 블럭 내의 이진 값을 사용하는 송신시의 값을 계산하고, 수신시와 동일한 방식으로 계산된 값과 비교하기 위해 결과를 데이터와 함께 저장함으로써, 데이터가 에러없이 전송되었는지 판정한다. Checksum calculation by calculating a value at the time of transmission using a binary value in the normally data block by using a predetermined algorithm and storing the results with the data to be compared with the values ​​calculated in the same manner as when receiving the data is it is determined that the transmission without error. 체크섬 계산 및 검증은 전체 TCP 세그먼트가 전체 TCP 세그먼트 페이로드를 커버하기 때문에 전체 TCP 세그먼트의 저장-전송 처리를 필요로 한다. Checksum calculation and validation storage of the entire TCP segment because the entire TCP segment covering an entire TCP segment payload requires the transfer process. 종래, 순환 용장 검사(CRC)의 계산 및 검증은 통상적으로 TCP 체크섬 검증의 다음에 오는데, 즉 접속이 RDMA 접속으로 인식된 다음, 및 DDP 세그먼트의 경계가 이전의 DDP 세그먼트 또는 MPA 마커의 길이를 사용하여 검출된 다음이다. Conventionally, calculation and validation of a cyclic redundancy check (CRC) is typically coming next in the verification TCP checksum, that is connected to the boundaries of the recognized the RDMA connection and then, and the DDP segment using the length of previous DDP segment or MPA markers to the detected next. CRC 계산 및 검증은 피제수로서 사용된, 즉 고정된 제수에 의해 나누어지는, 메시지를 선정된 길이로 나눔으로써 데이터가 정확하게 전송되었는지 판정한다. CRC calculation and validation by dividing a, that is, divided by a fixed divisor, selected for the message length is used as the dividend is determined that the data is accurately transmitted. 계산의 나머지는 수신기에 의해 행 해진 동일한 계산과의 비교를 위해 메시지에 첨부된다. The rest of the calculation is appended to the message for comparison with the same line calculation made by the receiver. CRC 계산 및 검증은 또한 전체 DDP 세그먼트의 저장-전송을 필요로 하는데, 이것은 지연을 증가시키고, 저장을 위해 큰 데이터 버퍼를 필요로 한다. CRC calculation and validation also store the entire DDP segment, - requires a transmission, which increases the delay and, requires large data buffers for storage. CRC 계산의 한가지 요구사항은 이전의 DDP 세그먼트의 길이를 사용하거나 MPA 마커(도 1b)를 사용하여 판정되는 DDP 세그먼트 경계를 아는 것이다. One kinds of information required for the CRC calculation is to know DDP segment boundaries are determined by using the length of the preceding DDP segment or using MPA markers (Fig. 1b). 마커 기반의 판정은 다수의 예외 및 난처한 경우로 인해 매우 복잡해진다. Determination of the marker base is greatly complicated by the numerous cases of exception, and awkward. 부분적으로 수신된 DDP 세그먼트의 CRC 계산도 또한 복잡한 프로세스이다. CRC calculation of a partially received DDP segment is also a complicated process with. 상기 문제들에 대처하기 위해, 도 2c에 도시된 바와 같이, 본 발명은 동일한 저장-전송 버퍼(68)를 사용하여 TCP 체크섬 로직(66)을 통한 TCP 체크섬 계산 및 검증과 동시에 CRC 로직(64)을 통한 CRC 계산 및 검증을 실행한다. To cope with the above problem, as shown in Figure 2c, the present invention has the same storage-use the transfer buffer 68 at the same time and the TCP checksum calculation and validation via TCP checksum logic (66), CRC logic 64 run the CRC calculation and validation through. 또한, 본 발명은 DDP 세그먼트 경계의 위치를 바로 찾지 않고, 이때 DDP 세그먼트 CRC를 계산하고 검증한다. In addition, the present invention is just to find the location of DDP segment boundaries, this time to calculate and validate DDP segment CRC. 오히려, 본 발명은 CRC를 계산하고 나중에 DDP 경계를 판정함으로써 동작의 순서를 변경한다. Rather, the invention is to change the order of operations by calculating CRC and later determining DDP boundaries. 이러한 변경을 하기 위해, CRC 로직(64)은 (세그먼트가 RDMA 접속에 속한다는 것이 알려지기 전에) 각 TCP 세그먼트가 얼라인된 DDP 세그먼트에서 시작하는 것으로 가정한다. To make this change, CRC logic 64 (before the segment is to be known to belong to the RDMA connection), it is assumed that, starting from the DDP segment that each TCP segment alignment. 또한, 본 발명은 처음의 2바이트의 TCP 페이로드(127)(도 1b)가 MPA 프레임의 MPA 길이 필드(114)(도 1b)라고 가정한다. The present invention also assumes that the TCP payload 127 (FIG. 1b) of the first two bytes of the frame of MPA MPA length field 114 (FIG. 1b). 이 길이는 DDP 세그먼트 경계를 식별하고 그 세그먼트에 대한 CRC를 계산하기 위해 다음에 사용된다. This length is used in the following to identify the DDP segment boundaries and calculate CRC for that segment. 검증 유닛(44)은 TCP 세그먼트(106) 내의 처음의 가능한 DDP 세그먼트(112)의 경계를 식별한 후에, 그 DDP 세그먼트에 대한 CRC를 TCP 세그먼트 페이로드(127)의 그 부분에 대한 체크섬 계산과 동시에 계산하고 검증한 다음에, 동일 한 TCP 세그먼트(106) 내에 포함된 다음의 가능한 DDP 세그먼트(112)(만약 있다면)로 진행한다. Verification unit 44, after identifying the boundaries of the first possible DDP segment 112 in TCP segment 106, the CRC for that DDP segment, the checksum calculation for that portion of TCP segment payload 127 at the same time calculated and verified, and then, the process proceeds to the same TCP segment 106, then the possible DDP segment 112 in the included in the (if any). TCP 세그먼트(106) 내에서 발견된 각각의 "가능한" DDP 세그먼트에 대해, CRC 검증 결과는 유효이거나 무효이거나, 너무 길 수 있다. For each "potential" DDP segment discovered in TCP segment (106), CRC validation results are valid or invalid, or may be too long. CRC 검증의 결과는 도 3과 관련하여 전술한 바와 같이 사용하기 위해 저장된다. Results of CRC validation are stored for use as described above with respect to FIG. 전술한 바와 같이 CRC를 실제로 계산하기 위해, TCP 세그먼트(106)의 페이로드가 처리될 때, InLogic(32)는 MPA 마커(110)가 TCP 세그먼트(106) 내에 있는 곳을 알 필요가 있다. In order to actually calculate CRC as described above, when the payload of a TCP segment 106 is processed, InLogic (32) needs the MPA markers 110 know where in a TCP segment 106. The 도 1b와 관련하여 전술한 바와 같이, MPA 마커(110)는 TCP 세그먼트(106) 내에서 512 바이트마다 떨어져 배치되고, 제1 MPA 마커는 접속 문맥(42)의 StartNum 필드(248)(도 2b)로서 저장되는 TCP 헤더(126)(도 1b) 내의 초기 순서 번호로부터 512 바이트에 있다. As described also in conjunction with 1b above, MPA markers 110, the TCP segment 106 is disposed off in every 512 bytes, and the 1 MPA markers StartNum field 248 (FIG. 2b) in connection context 42 in the 512 bytes from the initial sequence number in the TCP header 126 (FIG. 1b) that is stored as a. 불행히도, 각 MPA 마커(110)의 평가는 StartNum(248)(도 2b)과 관련된 자신의 위치를 드러내지 않는다. Unfortunately, the evaluation of each MPA marker 110 does not reveal its position relative to the StartNum (248) (Fig. 2b). 또한, MPA 마커(110)는 CRC 데이터(116)에 의해 커버되지만, MPA 프레임의 페이로드만을 포함하는 MPA 길이 필드(114) 내에 포함되지 않는다. In addition, MPA markers 110 are covered by the CRC, but the data 116 is not included in the MPA length field 114, which includes only the payload of the MPA frame. 따라서, MPA 마커(110)를 식별하기 위해, RNIC(16)는 접속 문맥(42)으로부터 페치되어야 하는 StartNum(248)(도 2b)을 알 필요가 있다. Accordingly, to identify MPA markers (110), RNIC (16) needs to know StartNum (248) (Fig. 2b) to be fetched from connection context 42. 불행히도, 접속 문맥(42)의 판독은 처리시에 매우 빨리 발생하고, 패킷 처리를 중단시키거나 정지시키기 때문에, TCP 처리 동안에 행하기가 매우 불편하다. Unfortunately, reading connection context 42 is very fast because it to generate at the time of processing, and stops the packet processing or stopped, it is very inconvenient to conduct during TCP processing. 접속 문맥(42) 페칭을 줄이거나 없애기 위해, 본 발명은 DDP 세그먼트의 MPA CRC를 계산하고 검증하기 위해 요구되는 DDP 세그먼트(112) 길이의 정확한 계산을 가능하게 하는 4가지 대안을 제시한다. To reduce or eliminate connection context 42 fetching, the present invention provides four alternative that allows the accurate calculation of DDP segment 112 length required to calculate and validate MPA CRC of DDP segments. DDP 세그먼트(112) 길이를 정확하게 계산하는 제1의 대안적인 실시예는 StartNum 필드(248)(도 2b)로서 저장된 초기 순서 번호의 접속 문맥(42) 프리페치를 구현하는 것을 포함한다. An alternative embodiment of the first to accurately calculate the DDP segment 112 length includes implementing a connection context 42 prefetch of an initial sequence number as stored StartNum field 248 (Fig. 2b). 여기에서는 MPA 스펙에 대한 어떤 변경도 제안되지 않는다. This section does not propose any changes to the MPA specification. 현재의 MPA 스펙은 TCP 세그먼트(106) 내의 MPA 마커(110)의 위치를 식별하기 위해 초기 순서 번호(StartNum)의 지식을 요구한다. The current MPA specification requires knowledge of the initial sequence number (StartNum) to identify the location of the MPA markers 110 in TCP segment 106. 초기 순서 번호는 접속마다 변하는 TCP 접속 속성이고, 접속 설정시에 절충된다. The initial sequence number is a TCP connection attribute, which changes each connection, is compromised at the time of connection setup. 그러므로, StartNum(248)(도 2b)은 각 접속별로 유지된다. Therefore, StartNum (248) (Fig. 2b) is maintained for each connection. MPA 마커(110)의 위치를 식별하기 위해, CRC 로직(64)(도 2c)은 특정 세그먼트의 순서 번호(SeqNum) 및 StartNum의 나머지 (SeqNum - StartNum) 모드(512)가 제로(0)인지 검사한다. To identify the location of MPA marker (110), CRC logic 64 (FIG. 2c) is a remainder of a particular segment sequence number (SeqNum) and StartNum - checking whether (SeqNum StartNum) mode 512, zero (0) do. 즉, 각각의 TCP 세그먼트(106) 헤더가 자신의 페이로드의 제1 바이트의 순서 번호를 갖고 있기 때문에, CRC 로직(64)은 특정 세그먼트의 순서 번호와 StartNum(248) 사이의 차를 구함으로써 마커를 찾는 곳을 결정한 다음에, 이 위치에서부터 시작하여 512 바이트마다 마커를 위치시킬 수 있다. That is, because each TCP segment 106 header has a sequence number of the first byte of its payload, CRC logic 64 includes a marker by calculating the difference between a particular segment's sequence number and StartNum (248) the next determined to find a place, it is possible to position a marker every 512 bytes starting from this position. MPA 스펙은 전술한 마커 검출 방법을 정의한다. MPA specification defines the method for detecting the aforementioned marker. 이러한 방식으로, [TCP 투플(tuple)에 기초한] 해시 룩업(Hash lookup) 및 접속 문맥(42) 프리페치는 TCP 체크섬 검증이 실행되기 전에 실행될 수 있다. In this way, a Hash lookup [based on TCP tuple (tuple)] (Hash lookup) and a connection context 42 prefetch can be performed before the TCP checksum validation is performed. 이것은 정상 접속 문맥(42) 페치 흐름이다. This is a normal connection context 42 fetch flow. RNIC(16)는 접속 문맥(42)을 획득하고 싶으면, 먼저 이 문맥이 위치한 곳을 알아내거나 접속 ID를 획득할 필요가 있다. RNIC (16) would like to obtain a connection context 42, it is first necessary to obtain the access ID naegeona know where this context is located. TCP 세그먼트(106) 헤더는 TCP 투플[IP 주소(소스 및 수신지) 및 TCP 포트(소스 및 수신지)]를 갖고 있다. TCP segment 106 header has a TCP tuple [IP addresses (source and destination) and TCP ports (source and destination). 투플은 해시 함수로의 입력이다. Tuple is the input to the hash function. 해시 함수의 출력은 접속 ID이다. The output of the hash function is a connection ID. 물론, 상 이한 투플에 대한 동일한 접속 ID는 "충돌"이라고 하는 결과를 초래할 수 있다. Of course, the same Connection ID for the unavoidable tuples may result, known as "collision". 충돌을 조정하기 위해, RNIC(16)는 접속 문맥(42)을 판독하고, 접속 문맥(42) 내의 투플을 패킷 내의 투플과 대조하여, 일치하지 않으면, RNIC(16)가 다음 접속 문맥(42)에 대한 포인트를 얻는다. In order to adjust the collision, RNIC (16) is connected to the context (42) read out, and if in contrast to the tuple in connection context 42 with the tuple in the packet, not match, RNIC (16), the following connection context 42, a to obtain a point on. RNIC(16)는 일치하는 것을 찾을 때까지, 또는 세그먼트가 임의의 공지된 접속에 속하지 않는 것으로 인식될 때까지, 투플을 계속 검사한다. RNIC (16) is until it finds a match, or until a segment is recognized as being that does not belong to any known connection, and continues checking the tuple. 이 프로세스는 TCP 스트림 내의 MPA 마커(110)의 위치를 알 수 있게 한다. This process makes it possible to know the location of the MPA markers 110 in TCP stream. 결과적으로, CRC 계산 및 검증은 TCP 체크섬 검증과 동시에 실행될 수 있다. As a result, CRC calculation and validation can be performed simultaneously with TCP checksum validation. 제2의 대안적인 실시예에서, 정확하게 DDP 세그먼트 길이를 계산하는 것은 MPA 스펙에 다수의 변경을 가함으로써 접속 문맥 페칭없이 가능하다. In a second alternative embodiment, it is to accurately calculate the DDP segment length is possible without connection context fetching by applying a plurality of changes to the MPA specification. 먼저, MPA 스펙 내의 MPA 마커(110) 배치의 정의가 변경된다. First of all, it changes the definition of MPA marker 110 placement in the MPA specification. 전술한 접속 문맥 프리페치 방법의 한가지 단점은 TCP 세그먼트(106) 내의 MPA 프레임(109)의 경계를 식별하기 위해 해시 룩업 및 접속 문맥(42) 프리페치를 실행할 필요가 있다는 것이다. One disadvantage of the above-described connection context pre-fetch method is that it needs to perform a hash lookup and connection context 42 prefetch to identify boundaries of the MPA frame 109 in a TCP segment 106. 이것을 방지하기 위해, 본 발명은 초기 순서 번호(SN)[StartNum(248)으로서 저장됨]에서 시작한 512 바이트마다가 아니라, 512 바이트마다 MPA 마커(110)를 배치한다(이것은 전술한 SN-StartNum 모드(512) 처리를 필요로 한다). To prevent this, the invention is an initial sequence number (SN) is arranged to MPA marker 110 for each well every 512 bytes starting at, 512 bytes [StartNum (248) saved as (this is the above-described SN-StartNum mode It requires 512 processing). 이러한 형태로, MPA 마커(110) 위치는 MPA 마커(110)를 위치시키기 위한 순서 번호 모드(512) 프로세스에 의해 결정될 수 있고, 접속 문맥(42) 페치는 요구되지 않는다. In this fashion, MPA markers 110 location may be determined by the sequence number mode 512, the process for positioning the MPA markers 110, not connected to context 42 fetch is required. 이 실시예에 따른 MPA 스펙에 대한 제2 변경은 하나의 마커가 2개의 DDP 세그먼트(112)로 분할되는, 즉 초기 순서 번호가 워드-얼라인되지 않는 상황을 방지 하는 작용을 한다. A second change to the MPA specification according to this embodiment is one of the markers have two DDP segments, that is, the initial sequence number that is divided into 112 words - serves to prevent a situation that is not aligned. 결과적으로, 순서 번호 모드(512) 프로세스는 표준 TCP 구현이 랜덤하게 생성된 바이트-얼라인된 값을 초기 SN이 가질 수 있게 하기 때문에 모든 상황에서 행해질 수는 없다. As a result, the sequence number mode (512), the process is a standard TCP implementation is randomly generated bytes - can not be done in every situation because this allows you to have an initial SN value of alignment. 즉, 초기 순서 번호가 워드-얼라인되는 지의 여부는 RNIC(16)에 의해 제어불가능하다. That is, the initial sequence number of the word-whether or not that the alignment is not controlled by the RNIC (16). 결과적으로, 주어진 접속에 대한 TCP 스트림은 반드시 MPA 마커(110)에서 시작할 필요는 없다. As a result, it does not necessarily have to start from the MPA Markers (110) TCP stream for the given connection. 따라서, CRC 로직(64)이 순서 번호 모드(512) 프로세스만을 사용하여 마커(110)의 위치를 선택한다면, CRC 로직(64)은 받아들일 수 없는 바이트 얼라인된 위치에 배치된 마커를 획득할 지도 모른다. Accordingly, if CRC logic 64 is using only a sequence number mode 512, the process selecting the position of the marker (110), CRC logic 64 to obtain a marker placed in the accept no byte alignment position may. 이러한 상황을 피하기 위해, 본 발명은 워드-얼라인된 RDMA 모드로 이동할 때 RDMA 접속의 초기 SN을 작성하기 위해, 소위 "MPA 요청/응답 프레임"이라고 하는, MPA 절충 단계 동안에 교환된 MPA 프레임에 패딩(padding)을 추가한다. To avoid this situation, the present invention is a word-when moving to align the RDMA mode to create an initial SN of RDMA connection, so-called "MPA request / reply frame" is called, the padding to the MPA frames exchanged during the MPA compromise comprising: Add the (padding). 즉, 도 7에 도시된 바와 같이, 수정 팩터(factor)(150)는 워드-얼라인된 초기 SN을 작성하는데 필요한 바이트의 수를 포함하는 TCP 세그먼트(106)의 MPA 요청/응답 프레임(152)으로 삽입된다. That is, the, modified factor (factor), (150) the word as shown in Figure 7 - MPA request / reply frame 152 of a TCP segment 106 that includes the number of bytes required to create the alignment of the initial SN It is inserted. 수정 팩터(150)의 정확한 위치는 도시된 바와 같이 될 필요는 없다는 것을 알기 바란다. The exact location of the modification factor 150 It should be understood that there have to be as illustrated. 이러한 방식으로, CRC 로직(64)은 접속 문맥 페치없이 TCP 스트림 내의 MPA 마커(110)의 정확한 위치를 얻기 위한 순서 번호 모드(512)를 구현할 수 있다. In this way, CRC logic 64 may implement the sequence number mode 512 to obtain the precise location of the MPA markers 110 in TCP stream without a connection context fetch. MPA 스펙의 전술한 변경을 사용하여, 본 발명은 MPA 마커(110)를 위치시킬 수 있고, 접속 문맥(42)을 프리페치하지 않고 MPA 세그먼트의 길이를 적절하게 계산할 수 있다. Using the above-described change of the MPA specification, the present invention is to locate MPA markers 110, without pre-fetch a connection context 42 can properly calculate the length of MPA segment. 3. MPA 길이 필드 변경 방법. 3. How MPA length field changes. 이 변경된 정의는 MPA 프레임 내에 매입된 모든 MPA 마커(110)의 위치를 알 필요 없이 MPA 길이 필드(114)를 사용하여 MPA 프레임(109) 경계를 검출할 수 있게 한다. This modified definition makes it possible to detect the MPA frame 109 boundaries using MPA length field 114 without having to know the location of all MPA Markers 110 embedded in the MPA frame. MPA 계층 프로토콜은 마커(110), CRC 데이터(116) 및 패딩(121)을 추출할 책임이 있고, ULP 페이로드 길이를 갖는 ULP(DDP 계층)를 제공한다. The MPA layer protocol is provided a marker (110), CRC data 116 and is responsible for extracting padding (121), ULP payload ULP (DDP Layer) with a rod length. 도 8을 참조하면, MPA 길이의 이 정의를 사용하여, CRC 로직(64)은 다음과 같은 프로세스에 의해 MPA 프레임(109)의 경계의 위치를 알아낸다: 단계 S100에서, CRC 로직(64)은 MPA 프레임(109)의 제1 워드가 0과 같은지 판정한다. Referring to Figure 8, using this definition of MPA length, CRC logic 64 can find out the position of the boundary of the MPA frame 109 by the following process: In step S100, CRC logic 64 It determines the first word of the MPA frame 109 is equal to zero. 예이면, InLogic(32)(도 2a)은 다음 워드로부터 MPA 길이 필드(114)를 판독한다(단계 S102). If YES, InLogic (32) (Fig. 2a) reads the MPA length field 114 from the next word (step S102). 이것은 마커(110)가 2개의 MPA 프레임(109) 사이에 속하는 경우이다. This is the case, the marker 110 falls between two MPA frames 109. 이러한 상황에서, MPA 길이 필드(114)는 단계 S104에서 나타낸 바와 같이 다음 워드 내에 위치된다. In this situation, MPA length field 114 is located in the next word as indicated at step S104. 단계 S100에서 아니오로 판정되면, 이 워드는 MPA 길이 필드(114)를 유지한다. If it is determined as NO in step S100, the word keeps the MPA length field 114. 단계 S106에서, MPA 길이는 이 MPA 프레임(109)을 커버하는 CRC 데이터(116)의 위치를 찾기 위해 사용된다. In step S106, MPA length is used to find the location of the CRC data 116 covering this MPA frame 109. 그 다음, 상기 프로세스는 TCP 세그먼트(106) 내에 매입된 다른 MPA 프레임(109)의 위치를 찾기 위해 반복된다. Then, the process is repeated to find the location of the other MPA frames 109 embedded in TCP segment 106. 이 실시예는 접속 문맥(42)으로부터의 아무런 추가 정보없이 MPA 프레임(109) 경계의 위치를 찾을 수 있게 한다. This embodiment makes it possible to find the position of the MPA frame 109 boundaries without any additional information from connection context 42. 제4의 대안적인 실시예에서, 무-마커 컷스루 구현은 후술되는 바와 같이, CRC 계산 및 검증과 관련하여 사용된다. In a fourth alternative embodiment, the omni-marker cut-through implementation is as described below, is used in reference to CRC calculation and validation. DDP 세그먼트 길이를 정확하게 계산하기 위한 전술한 3개의 대안적인 실시예의 단점은 각각이 MPA 스펙의 변경 또는 접속 문맥(42) 프리페칭을 요구한다는 것이다. DDP a three alternate embodiment disadvantages described above to accurately calculate the segment length is that each requires a change or connection context 42 prefetching of the MPA specification. 이 실시예는 도달하는 MPA 프레임의 CRC를 계산하기 위해 접속 문맥(42)을 프리페치하지 않고, MPA 스펙에 대한 아무런 추가 변경없이, 내향 세그먼트의 컷-스루 처리를 구현한다. This embodiment is connection context 42 prefetch to without, without any additional changes to the MPA specification, the inward segments cut to calculate the CRC of the MPA frame to reach-through processing implements. 또한, 이 실시예는 MPA 마커의 사용없이 비순서적 직접 데이터 배치를 가능하게 한다. In addition, this embodiment allows for a non-forward publications direct data placement without use of MPA markers. 이 실시예는 MPA 스펙의 최근에 갱신된 버전에 따라 소정의 주어진 접속에 대한 '무-마커' 옵션을 절충하는 수신기의 능력에 부분적으로 기초하고 있다. This embodiment is given for a given connection according to a recent updated version of the MPA specification, - and in part on the ability of a receiver to negotiate a "non-marker" option. 특히, 갱신된 MPA 스펙은 MPA 수신기가 마커를 사용할 것인지 아니면 주어진 접속에 대한 것을 사용할 것인지 결정할 수 있게 하고, 송신기는 수신기의 결정을 존중해야 한다. In particular, the updated MPA specification allows to decide whether to use for a given connection, or whether the MPA receiver to use the marker, and the transmitter should respect the decision of the receiver. 이 실시예는 접속 문맥(42)을 프리페치하지 않고, TCP 체크섬 계산과 동시에 실행중에 CRC 계산을 할 수 있도록 검증 유닛(44)을 변경한다. This embodiment changes validation unit 44 does not prefetch the connection context 42, to the CRC calculation at the same time as the TCP checksum calculation. CRC 계산은 마커를 갖는 경우에 대해 설명된 바와 같이 정확하게 행해진다. The CRC calculation is done exactly as described for the case with a marker. 즉, 본 발명은 TCP 세그먼트가 얼라인된 DDP 세그먼트에서 시작하고, CRC의 위치를 찾기 위해 MPA 길이 필드를 사용한 다음에, CRC를 계산하고 검증하는 것으로 한다. That is, the present invention shall start, and calculating and verifying, the CRC, and then use the MPA length field to find the location of CRC in a DDP segment of the TCP segment alignment. 그러나, 이 실시예가 갖는 차이점은 MPA 헤더의 MPA 길이 필드가 주어지면, DDP 세그먼트 길이를 계산할 때 마커를 고려할 필요가 없다는 것이다. However, the difference with this embodiment is given an MPA length field of the MPA header, that there is no need to consider markers when calculating DDP segment length. 도 9를 참조하면, 이 실시예의 제1 대안에 관한 InLogic(32) 기능을 나타낸 흐름도가 도시된다. Referring to Figure 9, a flow chart illustrating a InLogic (32) functions related to the alternative of the first embodiment is shown. InLogic(32) 기능의 대부분은 도 3과 관련하여 전술한 것과 거의 유사하다. Most InLogic (32) function is substantially similar to that described above with respect to FIG. 명확하게 하기 위해, InLogic(32) 기능이 도 3과 관련하여 전술한 것과 거의 유사한 경우에, 단계들은 반복되었고, 점선 박스로 도시되었다. For clarity, as described above with respect to InLogic (32) function is almost similar to the Figure 3 case, steps have been repeated, it is illustrated by the dashed box. 갱신된 MPA 스펙 하에서, 수신기는 접속 초기화시에 특정 접속에 대한 '무-마커' 옵션을 절충한다. Under the updated MPA specification, a receiver for a particular connection at connection initialization - to negotiate a "non-markers" option. 도 9에 도시된 바와 같이, 이 실시예에서, 단계 S201에서, InLogic(32)은 내향 TCP 세그먼트(106)가 마커(110)를 포함하는지 판정한다. As shown in Figure 9, in this embodiment, at step S201, InLogic (32) determines that the inbound TCP segment 106 includes a marker (110). 예이면, InLogic(32)은 도 3에서와 같이 처리를 계속하고, 전술한 바와 같이, CRC 계산 및 검증에 관한 소정의 다른 방법이 사용될 수 있다. If YES, InLogic (32) has a predetermined different process related to CRC calculation and validation it can be used, as described, the processing is continued, as in the above-described FIG. 아니오이면, 단계 S202에서, 내향 MPA 프레임(109)은 TCP 체크섬 로직(66)과 동일한 저장-전송 버퍼(68)를 사용하여, 하지만 접속 문맥(42)을 페치하지 않고, 실행중에 계산되고 검증된 자신의 CRC를 갖는다. In the smoke is, in step S202, inbound MPA frames 109 have the same storage and TCP checksum logic (66) using the transfer buffer 68, but without fetching connection context 42, and the calculated and verified during the execution It has its own CRC. 접속이 SLOW 접속인지 여부의 판정 또한 완료될 수 있다(도 3에서와 같은 단계 S2 및 S3). This connection can also be determined whether the completion of the SLOW connection (step S2 and S3 as in FIG. 3). CRC 검증의 결과는 다음 경우 중의 하나일 수 있다: 1) MPA 프레임(109)의 길이가 TCP 세그먼트(106)의 길이와 일치하고, MPA 프레임(109)이 유효 MPA CRC를 갖는 경우; If: 1) the length of MPA frame 109 matches the length of TCP segment 106, MPA frame 109 has a valid MPA CRC;: Results of CRC validation can be one of the following cases: 2) MPA 프레임(109)의 길이가 TCP 세그먼트(106)의 길이와 일치하지만, MPA 프레임(109)이 무효 CRC를 갖는 경우; 2) the length of MPA frame 109 matches the length of TCP segment 106, but, MPA frame 109 has an invalid CRC; 3) MPA 프레임(109)의 길이가 TCP 세그먼트의 길이를 초과하는 경우; 3) if the length of MPA frame 109 exceeds a length of TCP segment; 및 4) MPA 프레임(109)의 길이가 TCP 세그먼트(106)의 길이보다 작은 경우. And 4) the length of MPA frame 109 is smaller than the length of TCP segment 106. 1)의 경우에, InLogic(32) 기능은 도 3의 단계 S4-S7과 거의 유사하다. In the case of 1), InLogic (32) function is substantially similar to steps S4-S7 of Fig. 즉, MPA 프레임(109)이 TCP 세그먼트(106)와 동일한 길이를 갖고(도 3의 단계 S4 및 S5), 유효 MPA CRC를 갖는(단계 S6) 경우, 프레임은 유효 MPA 프레임으로 간주되고, 내부 데이터 버퍼(38)를 통해 추가 처리하기 위해 OutLogic(40)으로 보내지고, 고속 경로 모드 상에서 수신지 데이터 버퍼(50)로 보내진다. That is, if MPA frame (step S6) (109) having a (steps S4 and S5 in Fig. 3), valid MPA CRC has the same length as a TCP segment 106, the frame is considered to be a valid MPA frame, internal data is sent to OutLogic (40) for further processing via the buffer 38, the number is sent to the destination data buffers 50 on the fast path mode. 2)의 경우에, MPA 프레임(109)이 TCP 세그먼트(106)와 동일한 길이를 갖고(도 3의 단계 S4 및 S5), 무효 CRC를 갖는(도 3의 단계 S6) 경우, InLogic(32) 기능은 도 3과 관련하여 설명된 것과 다르다. In the case of 2), MPA frame 109, the TCP has the same length as the segment 106 (a step S4, and S5), invalid CRC of Figure 3 (step a 3 S6) case, InLogic (32) features It is different to that described with respect to FIG. 특히, 수신된 MPA 프레임(109)이 MPA 마커(110)를 포함하지 않기 때문에, (도 3의 단계 S10에서처럼) 마커 관련 정보는 회복을 위해 사용될 수 없다. In particular, since received MPA frame 109 does not contain MPA markers 110, the marker related information (as in step S10 in Fig. 3) it can not be used for recovery. 이것은 처리될 필요가 있는 2가지 경우만을 남게 한다: A의 경우: MPA 프레임(109)이 (도 3의 단계 S8에서 판정된 바와 같이) 이전에 수신된 세그먼트(및 검증된) MPA 프레임(109)의 길이에 의해 표시되는 때이고; This left the two only if need be handled: for A: MPA frame 109, the previous segment (and validated) received MPA frame 109 (as determined in step S8 in Fig. 3) represented by the length of ttaeyigo; B의 경우: 그 밖의 모든 경우이다. In the case of B: That is all the other cases. A의 경우에, MAP 프레임(109)은 손상되고, B의 경우에, MPA 프레임(109)은 손상되거나 얼라인되지 않을 수 있다. In the case of A, MAP frame 109 is corrupted, it is possible in the case of B, not MPA frame 109 is corrupted or not in alignment. 둘 다의 경우에, 수신된 TCP 세그먼트(106)는 드롭되고(도 3의 단계 S9), 수신은 확인되지 않는다. In the case of both, the received TCP segment 106 is dropped (step S9 of FIG. 3), the reception is not confirmed. 이 경우에, 도 4와 관련하여 설명된 제한된 재전송 시도 모드는 그 TCP 세그먼트(106)의 드롭에서 회복하도록 구현될 수 있는데, 이것은 송신기가 드롭된 TCP 세그먼트(106)를 재전송하고, 임의의 가능한 데이터 손상을 해결할 수 있게 한다. In this case, the Figure 4 and the limited retransmission attempt mode described in connection may be implemented to recover from the drop of that TCP segment 106, which is to retransmit the TCP segment 106, a transmitter, a drop, any possible data be able to solve the corruption. MPA 프 레임(109)이 TCP 세그먼트(106)에 얼라인되지 않았으면, 제한된 재전송 시도 모드는 전술한 바와 같이, 접속을 SLOW 접속으로 다운그레이드하는 것으로 끝날 것이다. If MPA frame 109 was not aligned to TCP segment is 106, a retransmission attempt mode will end up restricted to downgrade the connection as described above to SLOW connections. 3)의 경우에, MPA 프레임(109)의 길이가 TCP 세그먼트(106)의 길이를 초과하는 경우(도 3의 단계 S5), MPA 프레임(109)이 TCP 세그먼트(106)에 얼라인되지 않거나, 또는 길이가 손상된다. In the case of 3), if the length of MPA frame 109 exceeds a length of TCP segment 106 (step of Fig. 3 S5), MPA frame 109 is unsubstituted or is aligned to TCP segment 106, or the length is corrupted. 이 경우에, 수신된 TCP 세그먼트(106)는 드롭되고(도 3의 단계 S9), TCP는 수신을 확인하지 않는다. In this case, the received TCP segment 106 is dropped (step S9 of FIG. 3), TCP does not confirm receipt. 이 경우에, 다시, 도 4와 관련하여 설명된 제한된 재전송 시도 모드는 그 TCP 세그먼트(106)의 드롭에서 회복하도록 구현될 수 있는데, 이것은 송신기가 드롭된 TCP 세그먼트를 재전송하고, 임의의 가능한 데이터 손상을 해결할 수 있게 한다. In this case, again, FIG. 4 and the limited retransmission attempt mode described in connection may be implemented to recover from the drop of that TCP segment 106, which is to retransmit the TCP segment, the transmitter is dropped, any possible data corruption, be able to solve. 다시, MPA 프레임(109)이 TCP 세그먼트(106)에 얼라인되지 않으면, 제한된 재전송 시도 모드는 전술한 바와 같이, 접속을 SLOW 접속으로 다운그레이드하는 것으로 끝날 것이다. Again, if MPA frame 109 is not aligned in a TCP segment 106, a retransmission attempt mode will end up restricted to downgrade the connection as described above to SLOW connections. 4)의 경우에, MPA 프레임(109)의 길이가 TCP 세그먼트(106)의 길이보다 작거나(도 3의 단계 S4), TCP 세그먼트(106)가 잠재적으로 다수의 MPA 프레임(109)를 가질 수 있는[송신기가 패킹(packing) 옵션을 실행하는] 경우, InLogic(32)은 수신된 TCP 세그먼트(106) 내에 매입된 모든 DDP 세그먼트(112)의 CRC를 순차적으로 검사한다(도 3의 단계 S11-S13). In the case of 4), the length of MPA frame 109 may have a plurality of MPA frame 109 by the potential is less than the length of TCP segment 106 is on (step S4), the TCP segment (106 in Fig. 3) in case [the transmitter executes a packing (packing) option], InLogic (32) is a CRC of all DDP segments 112 embedded in the received TCP segment 106 is checked in order (step of Fig. 3 S11- S13). 모든 DDP 세그먼트(112)가 유효 CRC를 갖고 있으면, InLogic(32)은 그 TCP 세그먼트(106)의 수신을 승인하고, 모든 MPA 프레임은 고속 경로 모드 상에서 더욱 처리하기 위해 전송된다(도 3의 단계 S7). If all DDP segments 112 have a valid CRC, InLogic (32) is the TCP acknowledge receipt of the segment 106, and all MPA frames are transferred to further processing on the fast path mode (step in FIG. 3 S7 ). DDP 세그먼트들(112) 중의 하나가 무효 CRC를 갖고 있거나, 최종 세그먼트가 TCP 세그먼트 내에 완전히 포함되지 않으면(도 3의 단계 S12-S13), 전체 TCP 세그먼트는 드롭되고(도 3의 단계 S9), InLogic(32)은 그 TCP 세그먼트의 수신을 확인하지 않는다. DDP segment 112, or one that has an invalid CRC of, if the last segment is not fully contained in the TCP segment (steps S12-S13 in Fig. 3), the entire TCP segment is dropped (step S9 of FIG. 3), InLogic 32 does not confirm reception of that TCP segment. 전술한 바와 같이, 도 4와 관련하여 설명된 제한된 재전송 시도 모드는 그 TCP 세그먼트(106)의 드롭으로부터 회복하도록 구현될 수 있는데, 이것은 송신기가 드롭된 TCP 세그먼트를 재전송하고, 임의의 가능한 데이터 손상을 해결할 수 있게 한다. The limited retransmission attempt mode has been described with respect to Figure 4 as described above may be implemented to recover from the drop of that TCP segment 106, which is any possible corruption of data and retransmits the TCP segment, the transmitter is dropped, be able to solve. MPA 프레임(109)이 TCP 세그먼트(106)에 얼라인되지 않았으면, 제한된 재전송 시도 모드는 전술한 바와 같이, 접속을 SLOW 접속으로 다운그레이드하는 것을 끝날 것이다. If MPA frame 109 was not aligned to TCP segment is 106, the limited retransmission attempt mode will end up to downgrade the connection to the SLOW connection, as described above. 도 10을 참조하면, 이 실시예에 관한 InLogic(32) 기능을 나타내고, 제한된 재전송 시도 모드 및 TCP 재전송 속도 상승의 실시양상을 포함하는 다른 대안적인 흐름도가 도시된다. Referring to Figure 10, it shows the InLogic (32) function according to the present embodiment, an alternative flow chart, including aspects of the Limited Retransmission attempt mode and TCP retransmit speed increase is shown. 도 9와 대조적으로, 기능은 도 3에 비해 훨씬 더 간단해진다. In contrast to Figure 9, it will function much simpler than in Fig. 명확하게 하기 위해, InLogic(32) 기능이 도 3과 관련하여 전술한 것과 거의 유사한 경우에, 단계들은 반복되었고, 점선 박스로 도시되었다. For clarity, as described above with respect to InLogic (32) function is almost similar to the Figure 3 case, steps have been repeated, it is illustrated by the dashed box. 도 10에서, 단계 S151-S153은 도 3의 단계 S1-S3과 거의 동일하다. 10, the steps S151-S153 is substantially the same as steps S1-S3 of Fig. 단계 S154에서, InLogic(32)은 CRC 검증을 통과했는지 판정한다. In step S154, InLogic (32) judges that passed the CRC verification. 이 평가는 DDP 세그먼트 당 표시를 제공하는 대신에, CRC 로직(54)이 수신된 TCP 세그먼트 내의 모든 DDP 세그먼트의 CRC 검증의 성공 또는 실패를 나타내는 CRCValidationPassed 비트를 제공한다는 점에서 도 3의 단계 S4와 다르다. This review DDP, instead of providing an indication per segment, CRC logic 54 is different from the step S4 of FIG. 3 in that it provides a CRCValidationPassed bit to indicate the success or failure of CRC validation of all DDP segments in a received TCP segment, . 이 비트는 수신된 TCP 세그먼트 내에 포함된 모든 DDP 세그먼트에 대해 CRC 검증이 통과한 경우에 설정되고, CRC 검증이 세그먼트들 중의 하나에 대해 실패했거나, 최종(전용) 세그먼트가 너무 긴 경우에 소거된다. This bit is set in the case where the CRC validation passed for all DDP segments contained in received TCP segment, or CRC validation failed for one of the segments, are erased when the last (only) segment was too long. 아니오이면, InLogic(32)은 단계 S155로 진행하여, RecoveryAttemptsNum[도 2b의 필드(292)]가 MaxRecoveryAttemptsNum[도 2b의 필드(296)]보다 큰 지의 여부에 관한 판정이 이루어진다. If NO, InLogic (32) advances to a step S155, it is made RecoveryAttemptsNum MaxRecoveryAttemptsNum the determination as to whether the larger fingers Field 296 of Fig. 2b] Field 292 of Figure 2b]. 예이면, InLogic은 단계 S153으로 진행하여, DDP 세그먼트가 재조립 버퍼(34)에 배치되고, Ack가 송신되며, 접속이 (FAST 접속이었으면) SLOW 접속으로 다운그레이드된다. If YES, InLogic proceeds to step S153, and the DDP segment is placed to reassembly buffers (34), the Ack is transmitted, (yieoteumyeon FAST connection) connection is downgraded to a SLOW connection. 단계 S155에서 아니오이면, 단계 S156에서, TCP 세그먼트(106)는 드롭되고, 확인이 스케쥴링되지 않는다. If NO in step S155, in step S156, TCP segment 106 is dropped, it is not sure that the scheduling. 또한, RecoveryAttemptNum[도 2b의 필드(292)]은 1씩 증가되고, LastRecoverySN[도 2b의 필드(294)]은 갱신된다. Also, RecoveryAttemptNum [Field 292 of Fig. 2b] is incremented by 1, LastRecoverySN [Field 294 of Fig. 2b] is updated. 단계 S154로 돌아가서, 판정이 예로 되면, InLogic(32)은 단계 S157에서, 새로 수신된 순서적 데이터 전송의 순서 번호(순서적 SN)가 LastRecoverySN[도 1b의 필드(294)]보다 큰 지의 여부를 판정하는 처리를 한다. Returning to step S154, if it is determined this example, InLogic (32) in step S157, whether or not the newly received ordinal data transmission sequence number (ordinal SN) is LastRecoverySN larger fingers Field 294 of Fig. 1b] a process for the determination. 예이면, 단계 S158에서, InLogic(32)은 RecoveryAttemptsNum[도 1b의 필드(292)]을 소거하고, 즉 0으로 설정한다. If YES, in step S158, InLogic (32) should cancel the RecoveryAttemptsNum [Field 292 of Fig. 1b], that is set to zero. 단계 S157에서 아니오이면, 또는 단계 S158에 후속하여, 단계 S159에서, 세그먼트는 세그먼트를 수신지 데이터 버퍼(50)에 배치함으로써 "고속 경로 모드" 상에서 처리된다. If NO in step S157, or subsequent to step S158, in step S159, the segment is processed by arranging a number of segments to destination data buffers 50 on the "fast path" mode. 단계 S159는 또한 RCP 재전송 속도증가 옵션과 관련하여 전술한 바와 같이, 복제 Ack의 구현을 포함할 수 있다. Step S159 may also, including the implementation of the duplicate Ack, as described above with respect to the RCP retransmit speed-up option. 전술한 도 10의 실시예는 본 발명의 컷-스루 모드 외에도, 제한된 재전송 시도 모드 및 TCP 재전송 속도 상승 옵션을 MPA 마커의 사용없이 구현한다. Examples of the above-described FIG. 10 is cut according to the present invention - in addition to the through mode, and implements the limited retransmission attempt mode and TCP retransmit speed rise option without use of MPA markers. OutLogic(40)(도 2a)은 RDMA 메시지마다 정보를 유지하지 않고 RDMA 메시지 들의 순서적 전달을 실행한다. OutLogic (40) (Fig. 2a) executes sequentially delivery of RDMA messages without keeping information per RDMA message. 처리되는 2가지 상황이 있다: 1) 송신 메시지를 제외한 모든 RDMA 메시지에 대한 경우, 및 2) RDMA 송신 메시지에 대한 경우. There are two conditions to be treated: 1) on, and 2) transmitted RDMA messages, if for all RDMA messages except the messages transmitted. 도 1f-1h로 돌아가서, OutLogic(40)(도 2a)의 동작이 이제 설명될 것이다. Returning to the 1f-1h, will be the operation of OutLogic (40) (Fig. 2a) is now described. OutLogic은 고속 경로 모드 상에서 내부 데이터 버퍼에 배치된 내부 데이터 버퍼(38)(도 2a)로부터의 얼라인된 DDP 세그먼트(220)를 처리하고, 수신기의 데이터 버퍼로의 얼라인된 DDP 세그먼트의 배치 및 전달을 행한다. OutLogic is disposed in alignment with DDP segment of into the data buffer 38, it processes the alignment of DDP segment 220 (Fig. 2a), and a receiver data buffer disposed within the data buffer on the fast path mode, and It performs the transmission. 여기에서 설명될 때, "배치"라는 용어는 실제로 버퍼 내에 데이터를 놓는 프로세스를 나타내고, "전달"이라는 용어는 데이터 전송의 완료를 확인하는 프로세스를 나타낸다. When discussed herein, the term "disposed" is actually represents a process which sets the data in the buffer, the term "forward" indicates a process to check the completion of data transfer. "배치"는 세그먼트와 메시지 둘다에 적용될 수 있지만, "전달"은 메시지에만 적용된다. "Batch" can be applied to both segments and messages, "transfer" is only applied to messages. RDMA 프로토콜 하에서, 얼라인된 DDP 세그먼트는 비순서적 형태로 배치될 수 있지만, 전달은 얼라인 DDP 세그먼트들 모두가 순서대로 배치될 때까지 발생하지 않는다. Under the RDMA protocol, a DDP segments aligned, but can be arranged in a non-forward type publications, the delivery does not occur until all of the aligned DDP segments are placed in sequence. 예를 들어, 3개의 얼라인된 DDP 세그먼트 1, 2 및 3에 대해, 세그먼트 2 및 3이 세그먼트 1없이 먼저 배치되는 경우에, 전달은 세그먼트 1이 배치될 때까지 발생하지 않는다. For example, for three aligned DDP segments of 1, 2 and 3, if the segments 2 and 3 are first placed without segment 1, delivery does not occur until segment 1 is placed. 배치와 관련하여, OutLogic(40)은 후술되는 바와 같이, RDMA 판독 메시지에 관한 것을 제외하고는 RDMA 메시지의 종래의 배치를 제공한다. In relation to the placement, OutLogic (40) provides to the conventional placement of RDMA messages except those related to, RDMA read the message, as will be described later. 태그지정된 DDP 세그먼트와 관련하여, 예를 들어, 도 1d로 돌아가서, RDMA 프로토콜에 따르면, 태그지정된 DDP 세그먼트의 헤더(124)는 수신기의 이전에 등록된 메모리 영역[예를 들어, 도 1g의 메모리 영역(232)]의 주소를 갖고 있다. With regard to tagged DDP segments, for example, go back to Figure 1d, according to the RDMA protocol, the tag header 124 of the designated DDP segment before the memory area registered in the receiver, e.g., the memory region of Figure 1g It has an address of 232. 앞에 서 나타낸 바와 같이, 이 주소는 메모리 영역/윈도우[예를 들어, RDMA 기입 메시지를 위한 도 1g의 메모리 영역(232)] 내에 놓이는 수신지 버퍼를 나타내는 시작 태그(STag), 이 영역/윈도우 내의 타겟 오프셋(TO) 및 트랜잭션 길이(세그먼트 페이로드)를 포함한다. As shown in front, in the address memory region / window, for example, also in the memory area (232) 1g for RDMA write message; Start indicating a destination buffer lies in a tag (STag), this region / window and a target offset (tO) and a transaction length (segment payload). 이 경우에, 데이터 배치는 접속 문맥(42)(도 2a)으로부터 아무런 추가 정보도 검색하지 않고, 종래의 방식으로 OutLogic(40)에 의해 행해진다. In this case, the data arrangement does not detect any additional information from connection context 42 (FIG. 2a), it is made by OutLogic (40) in a conventional manner. Stag 및 TO가 수신지 데이터 버퍼를 설명하는 메모리 영역의 물리적 버퍼의 리스트로 변환되는 종래의 주소 변환 및 보호(ATP) 프로세스는 OutLogic(40)에 의한 데이터 배치보다 먼저 일어난다. Stag and conventional Address Translation and Protection (ATP) processes the destination TO converted into a list of physical buffers of a memory region describing the data buffer takes place before the data arrangement by OutLogic (40). RDMA 판독 메시지와 같은 태그 비지정 DDP 세그먼트와 관련하여, 도 1h를 참조하면, RDMA 프로토콜은 절충시에 교환되는 계류중인 내향 판독 요청(222)의 최대 수를 정의한다. If in connection with the tag unspecified DDP segments such as the RDMA read the message, see Fig. 1h, RDMA protocol defines the maximum number of inbound read request 222 pending to be exchanged at the time of trade-off. 각각의 RDMA 판독 메시지(204)는 단일 DDP 세그먼트(22)를 소비한다. Each RDMA read message 204 consumes a single DDP segment (22). RNIC(16)는 RDMA 판독 메시지(204)를 수신하면, RDMA 판독 응답 WQE(216RR)를 판독 큐(214)에 포스트한다. RNIC (16) receives the RDMA read message 204, to the post RDMA read response WQE (216RR) to a read queue 214. 다른 예에서, 도 1f를 참조하면, 각각의 송신 메시지(200)는 응답기, 즉 데이터 싱크(18)(도 2a)의 수신 큐(RQ)(212)에 배치된다. In another example, referring to Figure 1f, each transmitted message 200 is placed in the receive queue (RQ) (212) of the transponder, that data sink 18 (FIG. 2a). 전술한 바와 같이, 각각의 수신 큐(RQ)(212)는 제어 명령어가 배치되는 버퍼이고, 페이로드가 배치되는 WQE(216R)를 포함한다. As noted above, each receive queue (RQ) (212) includes a WQE (216R) which is a buffer that is a control command arranged, placed the payload. 수신 큐(RQ)(212)는 WQE(216R)를 포함한다. Receive queue (RQ) (212) includes a WQE (216R). 각각의 WQE(216R)는 소비기에 의해 포스트된 수신 WR(208R)을 설명하는 제어 정보를 보유한다. Each WQE (216R) holds control information describing a receive WR (208R) by a post-consumption. 각각의 WQE(216R)는 또한 그 WR(208R) 내에 포스트된 소비기 버퍼(들) 위를 가리킨다. Each WQE (216R) also refers to the above WR consumed buffer group (s) in the post (208R). 그들 버퍼는 페이로드를 배치하기 위해 사용된다. They buffer is used to place the payload. 따라서, 각 메시지(200)는 WQE(216R)를 소비한다. Accordingly, each message 200 consumes a WQE (216R). 도 11을 참조하면, 도 1h와 유사한 RDMA 판독 메시지(204) 및 RDMA 판독 응답(206)의 표현이 도시된다. Referring to Figure 11, a representation of the RDMA read message 204 and RDMA read response 206 similar to Figure 1h is shown. 그러나, 본 발명에 따르면, 판독 큐(414)는 순환 버퍼로서 구현된 특정 작업 큐(WQ)로서 제공되고, 이 순환 버퍼의 각 엔트리는 전송 로직에 의해 생성될 필요가 있는 RDMA 판독 응답을 설명하는 WQE(216RR)이다. However, according to the present invention, a read queue 414 is provided as a specific work queue (WQ) implemented as a cyclic buffer, and each entry of this cyclic buffer is describing the RDMA read response that needs to be generated by the transmission logic the WQE (216RR). 이것은 각각의 내향 RDMA 판독 요청에 대해, 판독 큐(414), 즉 WQE(216RR) 내에 잘 알려진 위치가 있기 때문에, 비순서적 RDMA 판독 요청(222)을 용이하게 효율적으로 배치할 수 있게 한다. This allows for each inbound RDMA read request, read because queue 414, i.e., there is a well-known location in the WQE (216RR), non-forward publications RDMA can be easily efficiently arranged a read request (222). 예를 들어, RDMA 판독 메시지 #3이 수신되고, RDMA 판독 메시지 #2가 손실될 때, RDMA 판독 메시지 #3이 배치된다. For example, RDMA read message # 3 is received, when RDMA read message # 2 is lost, RDMA read the message # 3 is disposed. 이 배치는 RDMA 판독 요청 메시지(222)의 수신시, 즉 요청기 상의 판독 WR(208R)의 포스팅으로 인해 보내진 메시지의 수신시에 행해진다. This arrangement is performed upon receipt of a message sent due to the posting of the read WR (208R) on the group, i.e. request upon reception of RDMA read request message 222. 판독 큐(414) 내의 WQE(216RR)의 위치는 RDMA 판독 메시지 헤더(124)(도 1d) 내의 MSN에 의해 식별된다. Location of WQE (216RR) in the read queue 414 is identified by the MSN in RDMA read the message header 124 (FIG. 1d). RDMA 프로토콜은 비순서적 데이터 배치를 허용하지만, 순서적 전달을 요구한다. RDMA protocol allows a non-forward book data placement but requires an orderly transfer. 따라서, 종래의 구현은 메모리에 (완전히 또는 부분적으로) 배치되었지만 아직 전달되지 않은 각 메시지에 대한 정보의 유지를 요구한다. Thus, conventional implementation has been placed in the memory (fully or partially) requires the maintenance of information about each message that is not delivered yet. 그러나, 단일 TCP 세그먼트의 손실은 수신지 버퍼에 배치될 수 있는 다수의 비순서적 RDMA 메시지의 수신을 초래할 수 있는데, 이것은 손실 세그먼트가 재전송되어 메모리에 성공적으로 배치될 때까지 완료되지 않는다. However, there may result in the receipt of a number of non-forward book RDMA message that the loss of a single TCP segment can be placed in the destination buffer, which does not finish until the retransmitted segment is lost successfully deployed in the memory. 종래의 상황 하에서, 제한된 자원은 비순서적 스트림이 수신된 후에 소정 수의 후속 메시지만이 저장될 수 있도록 비순서적 스트림을 저장하는데 이용가능하다. Under conventional circumstances, limited resources are available to store non-forward stream books to be only a predetermined number of subsequent messages after a non-forward stream received books are stored. 그러나, 본 발명에 따르면, 각각의 전달되지 않는 RDMA 메시지에 대한 소정의 정보를 보유함에 따라 지원된 비순서적 수신 메시지의 수를 제한하는 대신에, 무제한 수의 전달되지 않는 RDMA 메시지가 각 TCP 홀마다 정보를 저장함으로써 지원된다. However, according to the present invention, instead of limiting the number of the supported non-forward books received message as holding the predetermined information for each not delivered RDMA messages of unlimited number of not delivered RDMA messages are each TCP hole of by storing the information is supported. "TCP 홀"은 비순서적 TCP 세그먼트의 수신 결과로서 TCP 스트림 내에 만들어진 빈 자리를 설명하는 용어이다. "TCP hole" is a term that describes a vacancy created in the TCP stream as a result of receipt of a non-forward book TCP segment. 도 12를 참조하면, 백색 블럭은 TCP 홀(130A-130C)을 형성하는 손실된 TCP 세그먼트(400)를 나타내고, 어두운/회색 블럭(402)은 연속 수신된 TCP 스트림을 나타낸다. Referring to Fig 12, white blocks indicate the missing TCP segments 400 that form a TCP hole (130A-130C), a dark / gray blocks 402 indicate a continuously received TCP stream. 각 TCP 홀(130A-130C) 정보는 접속 문맥(42)(도 2b) 내에 저장된다. Each TCP hole (130A-130C) information is stored in connection context 42 (FIG. 2b). 지원된 TCP 홀(130A-130C)의 제한된 수는 TCP 프로토콜 구현으로부터 계승된 특성이다. A limited number of supported TCP holes (130A-130C) is a characteristic inherited from the TCP protocol implementation. 특히, TCP 프로토콜은 일반적으로, 지원된 TCP 홀(130A-130C)의 수를, 예를 들어 1개, 2개 또는 3개의 홀로 제한한다. In particular, TCP protocol, in general, the number of supported TCP holes (130A-130C), for example one, two or three restriction alone. 전형적으로, TCP 홀(130A-130C)의 제한된 수의 지원은 사실상, 비순서적 TCP 세그먼트가 도달하여, 새로운 TCP 홀을 열면, 이 세그먼트가 TCP 로직에 의해 드롭된다는 것을 의미한다. Typically, a limited number of supported TCP holes for (130A-130C) is in effect, by a non-forward publications TCP segment arrives, opening a new TCP hole, this means that that segment is dropped by TCP logic. 도 12는 3개의 TCP 홀 구현을 도시한 것이다. Figure 12 illustrates the implementation of TCP three holes. 이 경우에, 새로운 세그먼트가 하부 TCP 홀(130C) 뒤에, 즉 2개의 하부 손실 세그먼트(400) 뒤에 도달하면, 이 세그먼트는 지원되지 않는 네번째 홀을 "개방"할 것이다. In this case, if a new segment arrives after the bottom TCP hole (130C), i.e., after the two lower loss segment 400, this segment will be "open" a fourth hole that is not supported. 결과적으로, 그 세그먼트는 드롭될 것이다. As a result, that segment would be dropped. 이러한 상황에 대처하기 위해, 본 발명은 비순서적 메시지/세그먼트의 추적보다 오히려, 접속 문맥(42)(도 2a 및 2B)을 통해 TCP 홀(130)(도 12)의 추적을 구현한다. To cope with this situation, the present invention, rather than keep track of the non-forward books messages / segments, implements tracking of TCP holes 130 (FIG. 12) via connection context 42 (FIG. 2a and 2B). 특히, 도 2b에 도시된 바와 같이, 본 발명은 완료된 RDMA 판독 요청을 카운트하기 위한 PendingReadResponseNum 필드(300), 완료된 송신 메시지를 카운트하 기 위한 CompletedSendsNum 필드(302), 및 완료된 RDMA 판독 응답을 카운트하기 위한 CompletedReadResponseNum 필드(306)를 저장한다. In particular, as shown in FIG. 2b, the present invention is completed RDMA PendingReadResponseNum field for counting a read request 300, the completion of transmitting a message count and group CompletedSendsNum field 302, and completed RDMA for counting the read response for stores CompletedReadResponseNum field (306). 본 기술 분야에 숙련된 기술자들이 알 수 있는 바와 같이, 그 밖의 다른 필드가 각 홀에 요구될 수 있는데, 간결하게 하기 위해 그에 관한 설명은 하지 않겠다. As is clear to those skilled in the art, there are some other fields may be required for each hole, are beyond the scope thereof for the sake of brevity. 이 방법은 무제한 수의 비순서적으로 수신된 RDMA 메시지가 완료 및 순서적 전달을 기다릴 수 있게 한다. This method allows a non-forward to receiving an unlimited number of books can not wait for the completion of RDMA message and orderly transfer. 이 방법은 아무런 제한없이 수신(212) 및 송신(210) 큐 둘다에 의해 완료 큐(240)(도 1f-1h)를 공유하는 능력을 제한하지 않는다. This approach does not limit ability to share a reception 212 and transmission 210, completion queue 240 (Fig. 1f-1h) by the queue both without limitation. 특정 유형의 메시지를 처리조작하는 것에 관한 상세는 이제 설명될 것이다. Details relates to a particular type of message processing operation will now be explained. 첫째, RDMA 기입 메시지(202)(도 1g)의 전달은 동작의 특성 때문에 응답기로의 어떤 보고나, 다른 하드웨어 로직으로의 어떤 통지도 초래하지 않는다는 것을 알기 바란다. First, the delivery of RDMA write message 202 (Fig. 1g) is It should be understood that because of the nature of the operation which reports to the answering machine, or does not cause any notification to other hardware logic. 따라서, 이러한 유형 RDMA 메시지에 관한 전달 사항은 하나도 없다. Therefore, none is passing details on this type RDMA message. 둘째, 도 11로 돌아가면, RDMA 판독 응답 메시지(206)와 관련하여, 이 동작은 계류중인 RDMA 판독 메시지(204)의 완료를 나타낸다. Second, even when you return to 11, with respect to the RDMA read response message 206, this operation represents the completion of an RDMA read message 204 pending. 이 경우에, 다수의 완료된 RDMA 판독 응답 메시지(206)의 각 TCP 홀(130)을 포함하는 접속 문맥(42) 내의 CompletedReadResponseNum 필드(306)(도 2b)의 저장은 계류중인 RDMA 판독 작업 요청(208R)을 완료하기에 충분한 정보를 요청기의 완료 처리 로직에 제공하기에 충분하다. In this case, the number of completed RDMA read response message 206 stores the pending RDMA read work request of CompletedReadResponseNum field 306 (FIG. 2b) in connection context 42 that includes each TCP hole 130 (208R ) is sufficient to provide enough information to complete the processing logic of the group requested to complete a. TCP 홀이 닫히면, 이 홀과 관련된 완료된 RDMA 판독 응답의 수는 계류중인 RDMA 판독 작업 요청(208R)의 완료를 나타내기 위해 요청기의 완료 처리 로직에 보고된다. TCP hole is closed, the number of completed RDMA read response associated with this hole is reported to completion handling logic of the requester to indicate completion of the RDMA read work request (208R) is pending. RDMA 판독 요청과 관련하여, WQE(216RR) 포스트의 동작은 두 단계: 즉, 판독 큐(414)로의 WQE(216RR)의 배치, 및 RNIC(16)에게 이 WQE가 처리될 수 있다는 것을 알려주는 통지, 즉 초인종 울림을 포함한다. With respect to the RDMA read request, operation of WQE (216RR) post is done in two steps: that is, indicating that a batch, and the RNIC (16) of the WQE (216RR) to read queue 414 is WQE can be processed is notified , that includes a buzzer sound. WQE(216RR)의 배치는 비순서적으로 행해질 수 있다. Placement of WQE (216RR) can be done in a non-forward book. 그러나, 전술한 바와 같이, WQE 처리의 시작(따라서, 초인종 울림)은 RDMA 순서화 규칙에 따라야 된다. However, the start of the WQE processing (and thus, the doorbell ring) as described above is subject to RDMA ordering rules. 즉, RDMA 프로토콜은 임의의 종류의 이전에 전송된 모든 RDMA 메시지가 완료될 때까지 내향 RDMA 판독 메시지(204)의 처리 지연을 요구한다. That is, RDMA protocol requires delay of processing of inbound RDMA read messages 204 until all previously transmitted RDMA messages of any kind are completed. 그러므로, 초인종 울림, 즉 통지는 모든 순서적인 이전의 RDMA 판독 메시지(204)가 완료될 때까지 지연되어야 한다. Thus, the doorbell ring, that notification is to be delayed until all of the sequence of the previous RDMA read message 204 is complete. 하나의 초인종 울림, 즉 통지는 몇개의 WQE(216RR)의 포스팅을 나타낼 수 있다. A buzzer sound, that notification may indicate posting of several WQE (216RR). 상기 문제를 해결하기 위해, 본 발명에 따른 RNIC(16)는 접속 문맥(42)[PendingReadResponseNum 필드(300)(도 2b)] 내에, 각각의 TCP 홀(130)(도 1b)마다 초인종 울림(통지)을 기다리는 포스트된 RDMA 판독 응답 WQE(216RR)의 수를 저장한다. In order to solve the above problem, RNIC (16) according to the invention is connected to the context 42 in the [PendingReadResponseNum field 300 (Fig. 2b)], the buzzer sound for each TCP hole 130 (FIG. 1b) (notify ) and stores the number of the post RDMA read response WQE (216RR) waiting for. TCP 홀(130)이 닫히면, RNIC(16)는 판독 큐(214)로의 PendingReadResponseNum WQE(216RR)의 포스팅을 확인하기 위해 초인종을 울린다(통지한다). Closes the TCP hole (130), RNIC (16) is ring the buzzer to make a posting PendingReadResponseNum WQE (216RR) to a read queue 214 (notifies). 이것은 모든 이전의 판독 메시지(204)가 완료되었고, RNIC(16)가 포스트된 판독 응답 WQE(216RR)의 처리를 시작할 수 있다는 것을 나타낸다. This indicates that all previously read messages 204 have been completed, RNIC (16) to start the processing of the post-read response WQE (216RR). 도 13을 참조하면, RDMA 송신 메시지(500)는 유일한 상황을 나타낸다. Referring to Figure 13, RDMA send message 500 represents a unique situation. 특히, 완료된 송신 메시지의 전달은 CQ(540)로의 CQE(542)의 배치를 포함한다. In particular, the transmission of the transmission message is completed comprises the arrangement of the CQE (542) to the CQ (540). CQE(542)는 완료된 메시지를 설명하는 정보(예를 들어, 길이, 무효 STag 등)를 갖고 있다. CQE (542) has the information (e. G., Length, void STag, etc.) describing the completed message. 이 정보는 메시지 특정 정보이므로, 각각의 계류중인 송신 메시지(500)마다 유지되어야 한다. This information is message specific information, to be maintained for each transmitted message 500 each pending. RNIC(16)는 앞에 나타낸 바와 같이, CQ(540)가 몇개의 송신(510) 및 수 신(512) 큐에 의해 공유될 수 있기 때문에, [수신된 판독 작업 요청(508R) 내의 RDMA 판독 응답 WQE(508RR)의 배치와 유사하게] 송신 메시지(500)가 완료되기 전에 CQE(542)를 배치할 수 없다. RNIC (16), as shown before, CQ (540) is because it can be shared by one of the transmission 510 and the receive 512 queues, [RDMA read response in the received read work request (508R) WQE you can not place a CQE (542) before being similarly] transmitting message 500 is complete, and the arrangement of (508RR). 추가 RNIC 자원을 소비하지 않고, 크기조정 가능한 구현을 제공하여, 이 문제를 해결하기 위해, 본 발명에 따른 OutLogic(40)은 CQE(542) 내에 포함될 필요가 있는 모든 정보를 그 송신 메시지(500)에 의해 소비된 WQE(516R)에 배치한다. Without consuming additional RNIC resources, and providing a scalable implementation, in order to solve this problem, OutLogic (40) is CQE (542) that transmits message 500 to all of the information that needs to be included in accordance with the present invention It is placed in the WQE (516R) consumed by. 그 다음, 이 정보는 완료를 위한 폴(Poll-For-Completion) 요청시에 동사 라이브러리(20)(도 2a)에 의해 WQE(516R)로부터 검색된다. Then, the information is retrieved from WQE (516R) by the time pawl (Poll-For-Completion) request for completing the verb library 20 (Fig. 2a). RNIC(16)는 대응하는 TCP 홀이 닫힐 때, CQE(542)를 CQ(540)에 포스트하기 위해 사용되는 접속 문맥(42) 내의 각 TCP 홀(130)마다 [CompletedSendsNum 필드(302) 내에] 완료된 송신 메시지(500)의 수를 유지할 필요가 있다. RNIC (16), when closed, the TCP hole corresponding, [in CompletedSendsNum field (302) for each TCP hole 130 in connection context 42 that is used to post the CQE (542) to the CQ (540) is complete it is necessary to keep the number of transmitted messages (500). TCP 홀(130)이 닫히면, RNIC(16)는 CQE(542)를 CQ(540)에 배치한다. Closes the TCP hole (130), RNIC (16) places the CQE (542) to the CQ (540). 배치될 CQE(542)의 수는 이 홀에 대해 카운트된 완료 송신 메시지(500)의 수와 같다. The number of CQE (542) to be disposed is equal to the number of completed send messages 500 counted for this hole. 이 방법은 2N 기입 동작을 수반하는데, N은 완료된 송신 메시지(500)의 수이다. The method involve a 2N write operation, N is the number of completed send messages 500. RDMA 송신 메시지(500)의 전달과 관련하여 앞에서 제시된 방법의 한가지 단점은 RNIC(16)에 의해 실행된 기입 동작의 수를 두배로 한다는 것이다. One disadvantage of the method described earlier in connection with the delivery of RDMA send message 500 is that the number of write operations performed by RNIC (16) to double. 즉, 각각의 완료된 송신 메시지(500)에 대해 WQE(516R)로의 하나의 기입이 있고, CQE(542)의 하나의 기입이 있다. That is, for each complete transmission message 500 and one of the write to WQE (516R), there is one write of CQE (542). 이 문제에 대처하기 위해, 도 14에 도시된 바와 같이, 본 발명의 대안적인 실시예에 따르면, CQE(542)의 내용은 특정 CQE(542)가 완료하는 WQE(516R)의 참조 카운터(544)를 갖도록 변경된다. To address this problem, as shown in Figure 14, according to an alternative embodiment of the invention, the contents of the CQE (542) is a reference counter 544 of the WQE (516R) to complete a particular CQE (542) the changes have. 참조 카운터(544)는 주어진 TCP 홀(130)에 대해 완료된 송신 메시지(500)의 수로 RNIC(16)에 의해 초기화된다. Reference counter 544 is initialized by RNIC channel (16) of the transmission message 500 completed for the given TCP hole 130. 동사 라이브러리(20)는 각각의 완료를 위한 폴 동작마다, 참조 카운터(544)를 감소시키고, 카운터가 0이 되는 경우에만 CQ(540)로부터 CQE(542)를 제거한다. Verb library 20 is to remove the CQE (542) from CQ (540) only if each pole operation for each complete, and reduces reference counter 544, the counter becomes zero. 또한, RNIC(16)는 WQE(516S)가 완료를 기다리는 미결 송신 메시지(500)를 임계치(M)보다 크게 유지하는 경우에만 WQE(516S)를 갱신한다. In addition, RNIC (16) updates a WQE (516S) only when the zoom maintain WQE pending outgoing message (500) (516S) is waiting for the completion than the threshold (M). M은 구성가능한 파라미터로서, 계류중인 내향 송신 메시지(500)를 위한 정보를 유지하기 위해 할당된 내부 자원의 양을 나타낸다. M is configured as parameters, it represents an amount of internal resources allocated to keep information for inbound transmission message 500 is pending. M이 0이면, 임의의 비순서적으로 수신된 송신 메시지(500)는 WQE(516R)의 갱신을 필요로 한다[순서적으로 수신된 송신 메시지(500)에 대해서는 갱신을 필요로 하지 않는다]. If M is 0, the transmission message 500 received by any non-forward books requires an update of WQE (516R) [and does not require an update for sequentially transmitting the message 500 received. 이 실시예는 또한, 2종류의 CQE(542)를 정의하는 것, 및 CQE가 CQE의 보디(body) 내에 모든 완료 데이터를 갖고 있는 것인지, 아니면 하나 이상의 RDMA 송신 메시지와 관련된 WQE(516R) 내에 저장된 완료 정보의 나머지를 갖는 완료 데이터의 일부를 갖고 있는 것인지 나타내기 위해 CQE(542)에 표시기(546)를 제공하는 것을 포함한다. Stored in this embodiment also, to define two types of CQE (542), and CQE the WQE (516R) associated with all want to have the complete data, or one or more RDMA send messages within the CQE body (body) and the CQE (542) to indicate whether you have a part of the complete data with the remainder of the completion information includes providing a display (546). 이 대안적인 실시예는 기입 동작의 수를 N+1로 감소시키는데, N은 TCP 홀(130)이 닫히기 전에 계류중이던 완료 송신 메시지(500)의 수이다. This alternative embodiment is to reduce the number of write operations to the N + 1, N is the number of completed send messages 500, that were pending before TCP hole is closed (130). 앞의 설명에서, 방법의 단계들은 본 발명의 하나 이상의 기능적 태스크를 실행하기 위한 특수 하드웨어를 포함하는 전용 컴퓨터, 즉 유한 상태 기계에 의해 양호하게 실행된다는 것을 알 수 있을 것이다. In the preceding explanation, the steps of the methods are to be understood that preferably only executed by the computer, that is a finite state machine that contains special hardware for carrying out one or more of the functional tasks of the invention. 그러나, 방법의 단계들은 또한 메모리 내에 저장된 프로그램 제품의 명령어를 실행하는 CPU와 같은 프로세서에 의해 실행 될 수 있다. However, the steps of the method may also be executed by a processor such as a CPU for executing the instruction in the program stored in the memory. 여기에서 설명된 다양한 장치, 모듈, 메카니즘 및 시스템은 하드웨어, 소프트웨어, 또는 하드웨어와 소프트웨어의 조합에 의해 실현될 수 있고, 도시된 것과 다르게 구분될 수 있다는 것을 알 수 있을 것이다. Various devices, modules, mechanisms and systems described herein will be appreciated that there can be realized by a combination of hardware, software, or hardware and software, may be different from that shown nine minutes. 그것들은 임의의 유형의 컴퓨터 시스템, 또는 여기에서 설명된 방법을 실행하도록 적응된 또는 다른 장치에 의해 구현될 수 있다. They can be implemented by the or other apparatus adapted for executing the method described in a computer system, or where any type of. 하드웨어와 소프트웨어의 전형적인 조합은 로드되어 실행될 때, 여기에서 설명된 방법을 실행하도록 컴퓨터 시스템을 제어하는 컴퓨터 프로그램을 갖는 범용 컴퓨터 시스템일 수 있다. A typical combination of hardware and software may be a general-purpose computer system with a computer program that, when executed, controls the computer system is loaded, to execute the methods described herein. 본 발명은 또한, 여기에서 설명된 방법 및 특징의 구현을 가능하게 하는 모든 특징을 포함하고, 컴퓨터 시스템에 로드될 때, 이들 방법 및 기능을 실행할 수 있는 컴퓨터 프로그램 제품에 내장될 수 있다. The invention also may include all the features enabling the implementation of the methods and features described herein, and which when loaded in a computer system embedded in a computer program product that can perform these methods and functions. 이러한 맥락에서 컴퓨터 프로그램, 소프트웨어 프로그램, 프로그램, 프로그램 제품, 또는 소프트웨어는 정보 처리 능력을 갖는 시스템이 특정 기능을 바로, 또는 (a) 다른 언어, 코드 또는 표기로의 변환 후; In this context, computer programs, software program, program, program product, or software for a particular function system having an information processing capability directly, or (a) After conversion to another language, code or notation; 및/또는 (b) 상이한 자료형으로의 재생 후에 실행하게 하도록 되어 있는 명령어 세트의 소정의 언어, 코드 또는 표기로 된 소정의 표현을 의미한다. And / or (b) means that a predetermined language, a predetermined expression or a code representation of the instruction set to be executed after the reproduction of a different type. 본 발명은 전술한 특정 실시예와 관련하여 설명되었지만, 다수의 대안, 변경 및 변형이 본 기술 분야에 숙련된 기술자들에게 명백할 것이라는 것은 자명하다. While the invention has been described in conjunction with the foregoing specific examples, it is apparent that many alternatives, modifications and variations will be apparent to those skilled in the art. 따라서, 전술한 본 발명의 실시예는 예시적인 것이지, 제한하고자 하는 것은 아니다. Thus, embodiments of the invention described above are illustrative and geotyiji, not to be construed as limiting. 다음의 청구범위에 정의된 본 발명의 정신 및 범위를 벗어나지 않고서 다양한 변경이 이루어질 수 있다. Without departing from the spirit and scope of the invention defined in the following claims it may be made various changes. 특히, 단계들의 설명된 순서는 상이한 세트의 단계들에 의해 제공된 기능 또는 소정의 상황에서, 본 발명의 범위를 벗어나지 않고서 변경 될 수 있다. In particular, it is possible to change the order of the steps is described without departing from the scope of the invention for the given function or a given situation, by the steps of a different set. 본 발명은 데이터 전송 분야에서 산업상 이용가능성을 갖는다. The invention has the potential industrially used in data transmission fields. 순서에 맞는(in-order) 다음 TCP 세그먼트가 수신되지 않은 경우라도, 상기 송신기를 재진입(re-entering)시키는 프로세스를 고속 경로 모드(fast path mode)로 가속(speed up)함으로써 상기 재전송 프로세스를 앞당기기 위하여, 상기 제1 복제 TCP Ack가 생성되고 전송되는 것인, TCP 재전송 프로세스 속도를 증가시키는 방법. By (in-order), and then TCP even when the segment is not received, accelerating the process of re-entry (re-entering) the transmitter to the fast path mode (fast path mode) (speed up) for the order in advance the retransmission process a method of increasing the phosphorus, TCP retransmission process speed to the first duplicate TCP Ack is generated and transmitted to group. 프로토콜 데이터 유닛 얼라인먼트를 갖는 마커(marker with protocol data unit alignment: MPA) 프로토콜, 직접 데이터 배치(direct data placement: DDP) 프로토콜, 및 원격 직접 메모리 액세스(remote direct memory access: RDMA) 프로토콜 중 최소한 하나를 포함하는 것인, TCP 재전송 프로세스 속도를 증가시키는 방법. Marker with protocol data unit alignment (marker with protocol data unit alignment: MPA) protocol, a direct data placement (direct data placement: DDP) protocol, and a remote direct memory access (remote direct memory access: RDMA) include at least one of the protocol the method of increasing the TCP retransmission process to speed. TCP 세그먼트에 대해, 그 TCP 세그먼트가 순서에 맞는 것(in-order)인지 순서에 안 맞는 것(out-of-order)인지의 여부에 상관없이, 상기 제1 복제 TCP Ack가 생성되는 것인, TCP 재전송 프로세스 속도를 증가시키는 방법. Would for a TCP segment, the TCP segment is to fit in order (in-order) if no matter not whether to (out-of-order) for the sequence, wherein the first duplicate TCP Ack is generated, how to increase the TCP retransmission process speed. 를 더 포함하는, TCP 재전송 프로세스 속도를 증가시키는 방법. A method of increasing the speed of TCP retransmission process further includes. 제1항 내지 제5항 중 어느 한 항에 따른 방법의 각 단계를 수행하기 위한 각각의 수단을 포함하는, TCP 재전송 프로세스 속도 상승 시스템. Claim 1 to, TCP retransmission process speed increase system including a respective means for performing the steps of the method according to any one of claim 5. 상기 컴퓨터 판독가능 프로그램은, 제1항 내지 제5항 중 어느 한 항에 따른 방법의 각 단계를 수행하기 위한 각각의 프로그램 코드를 포함하는 것인, 컴퓨터 판독가능 기록 매체. The computer-readable program, the first term to the computer-readable recording medium containing program code for performing each of the steps of the method according to any one of claim 5.